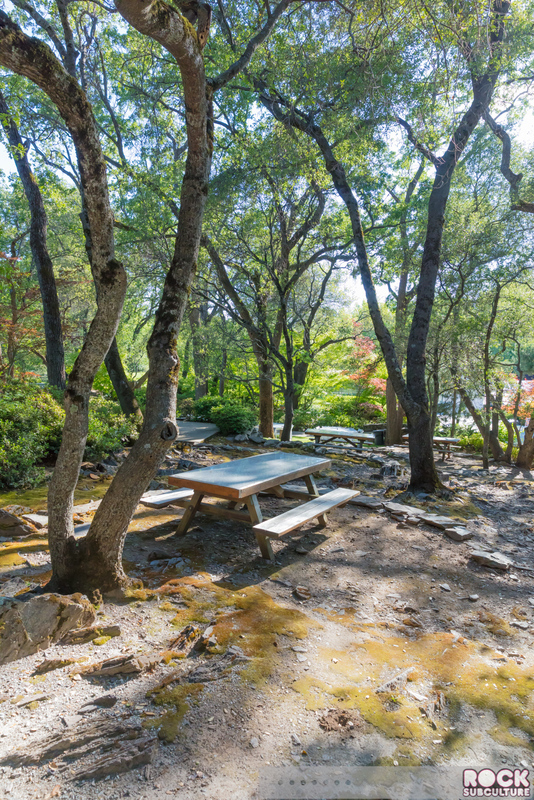 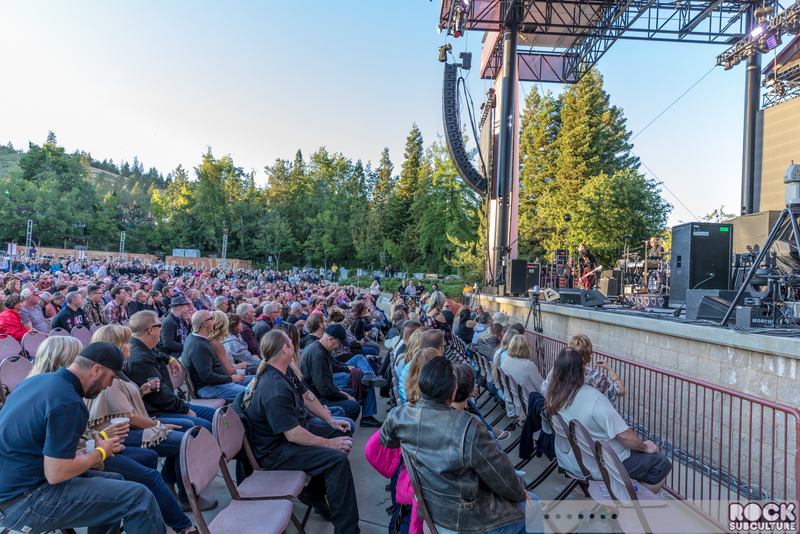 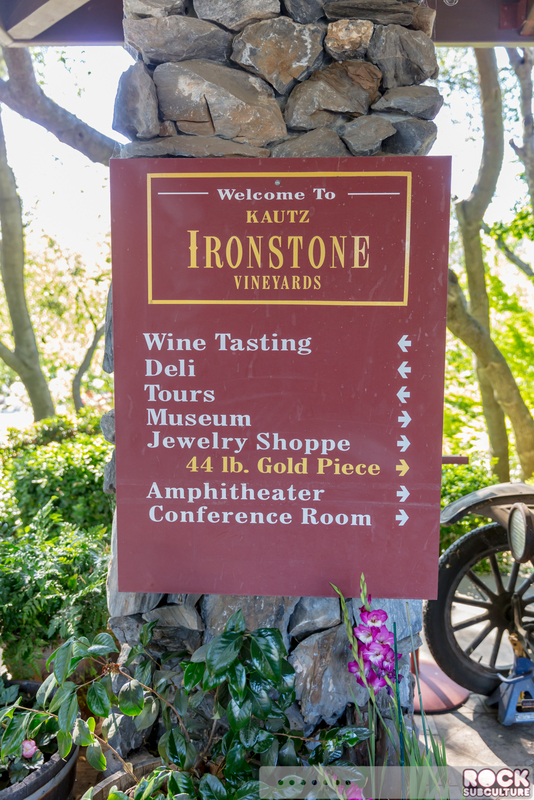 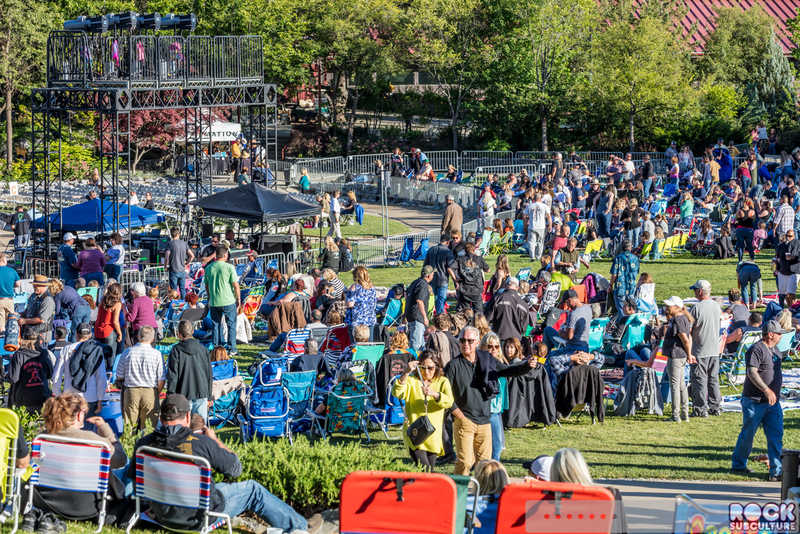 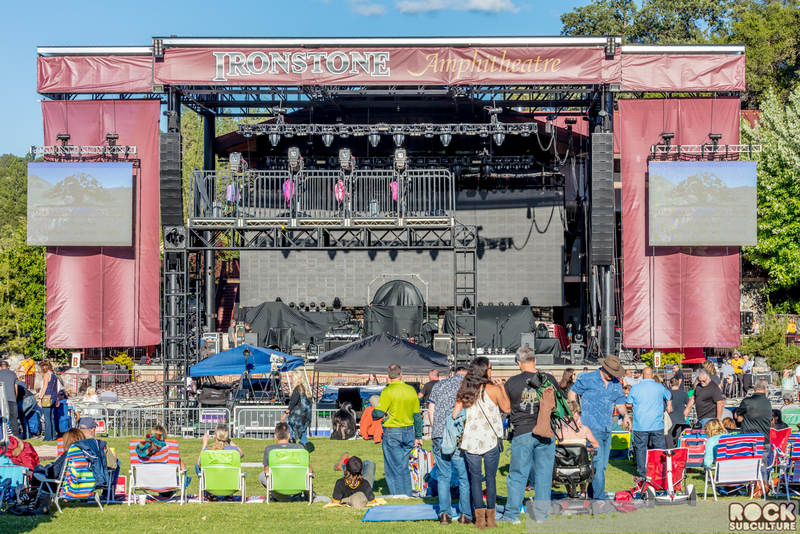 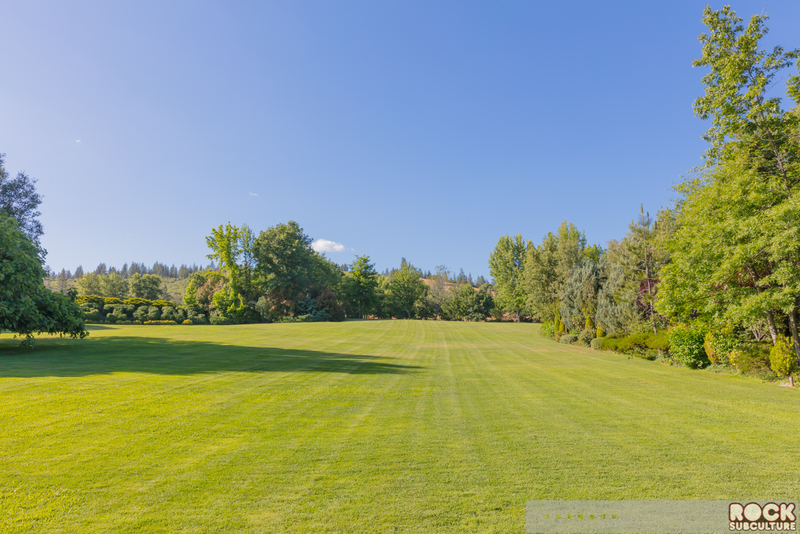 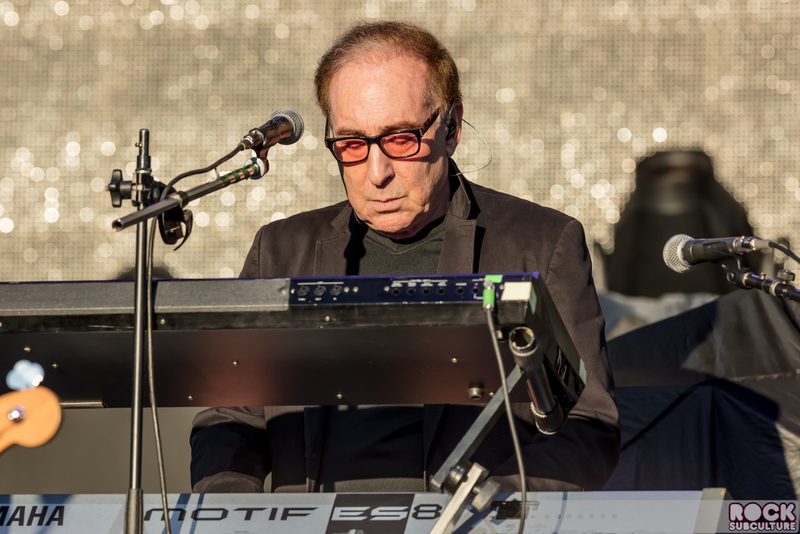 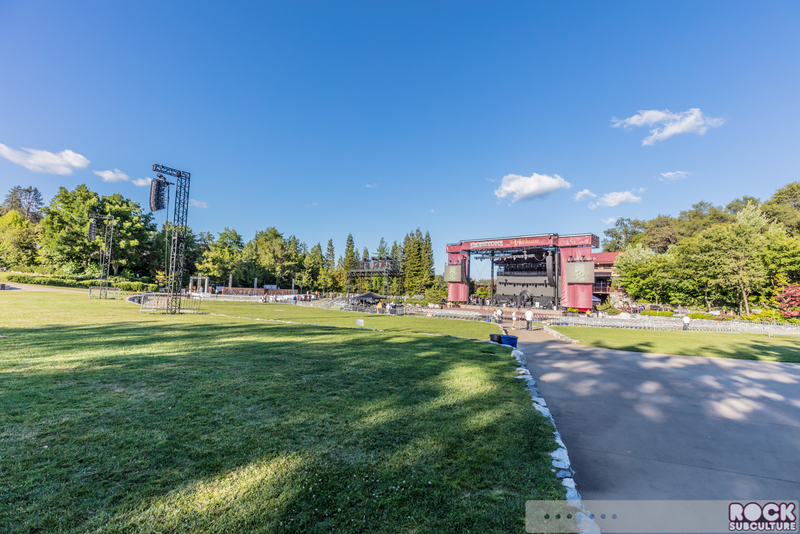 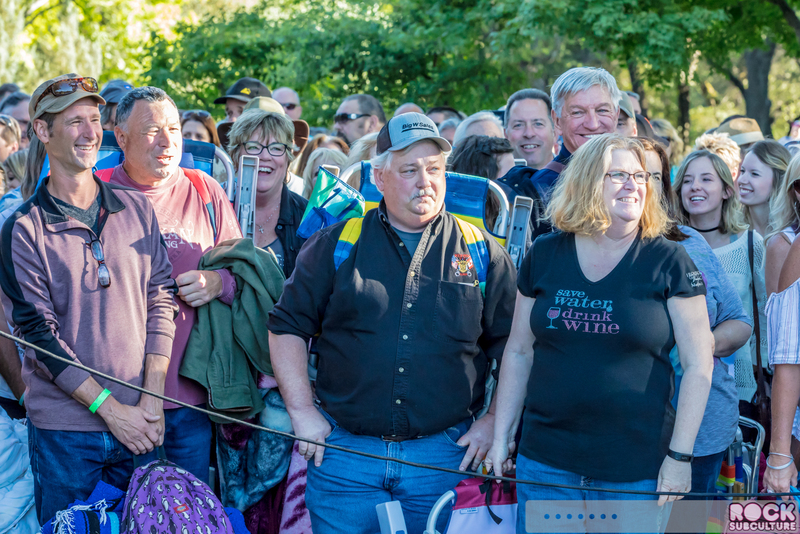 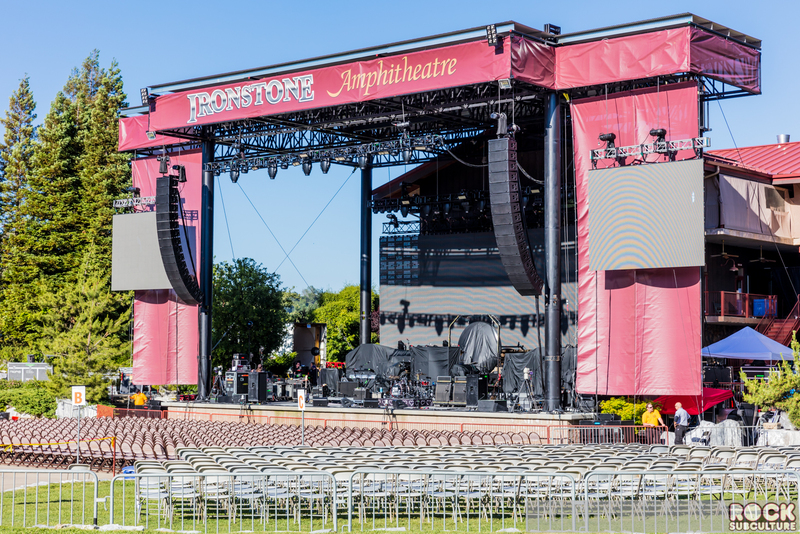 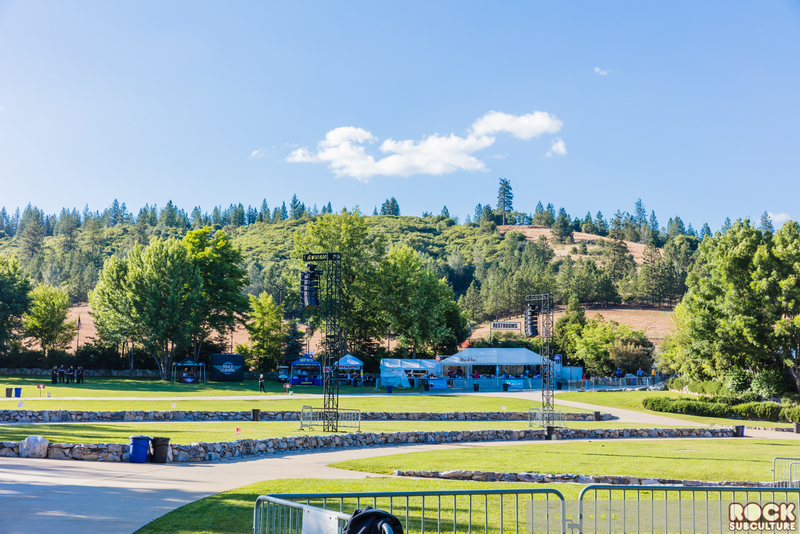 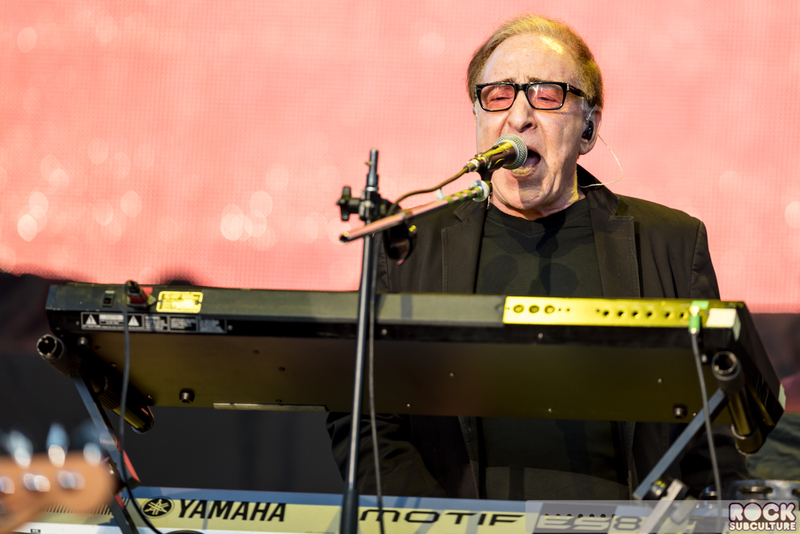 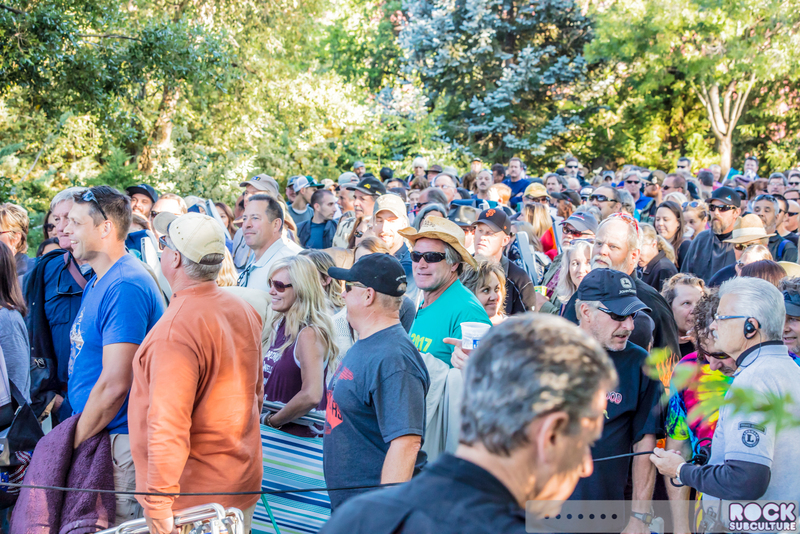 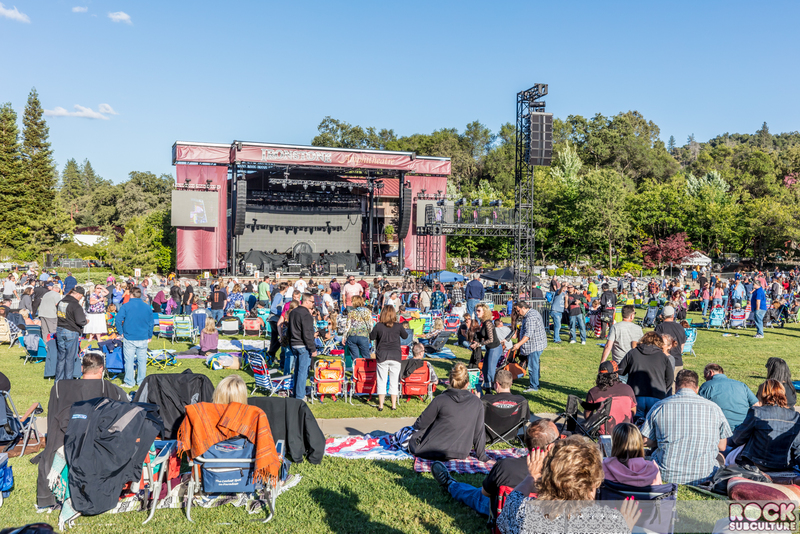 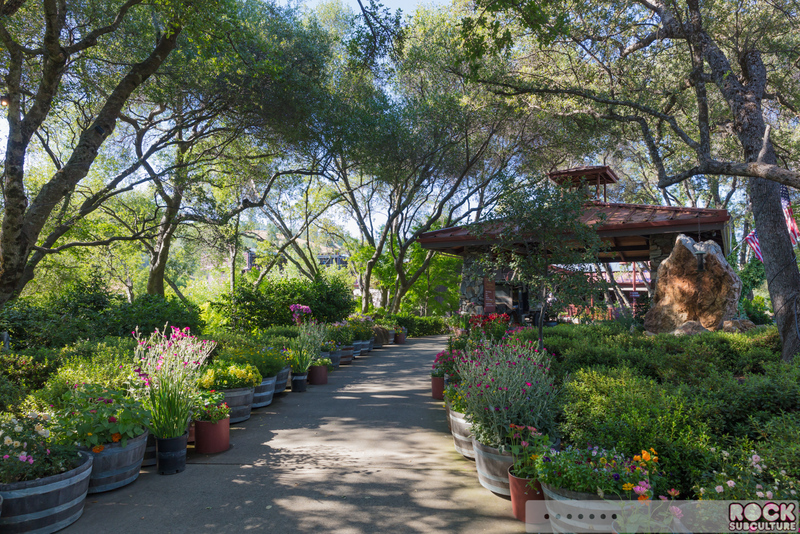 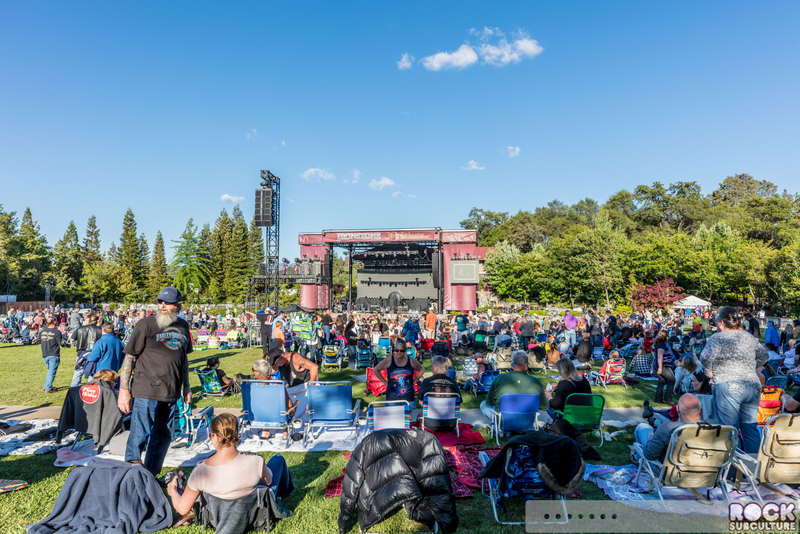 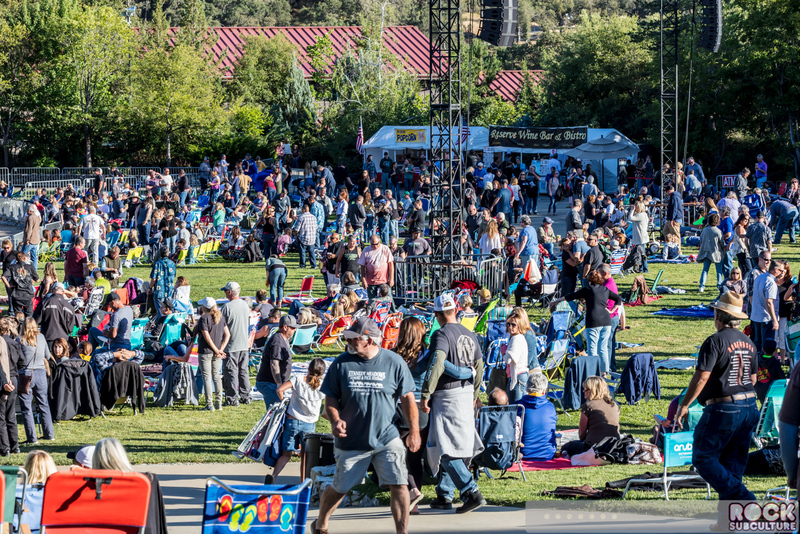 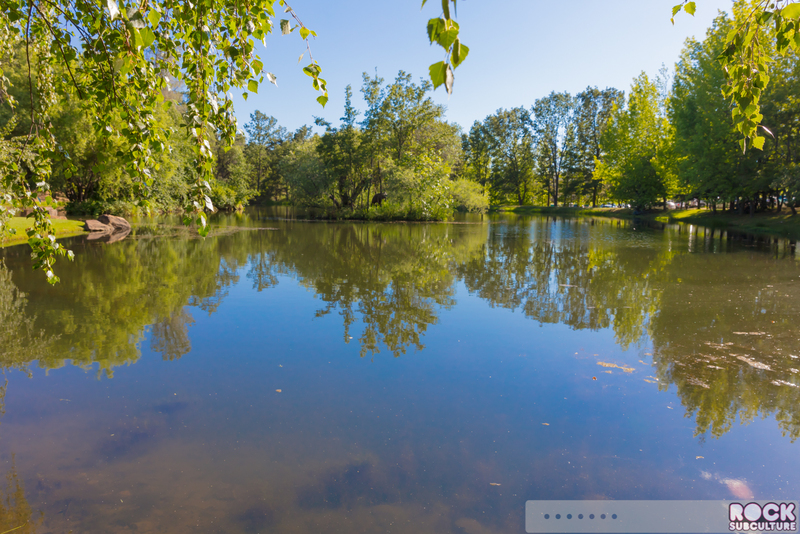 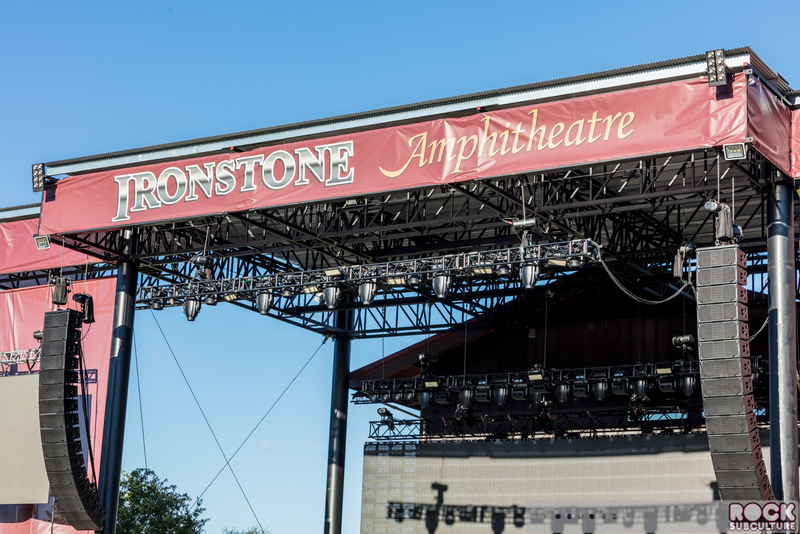 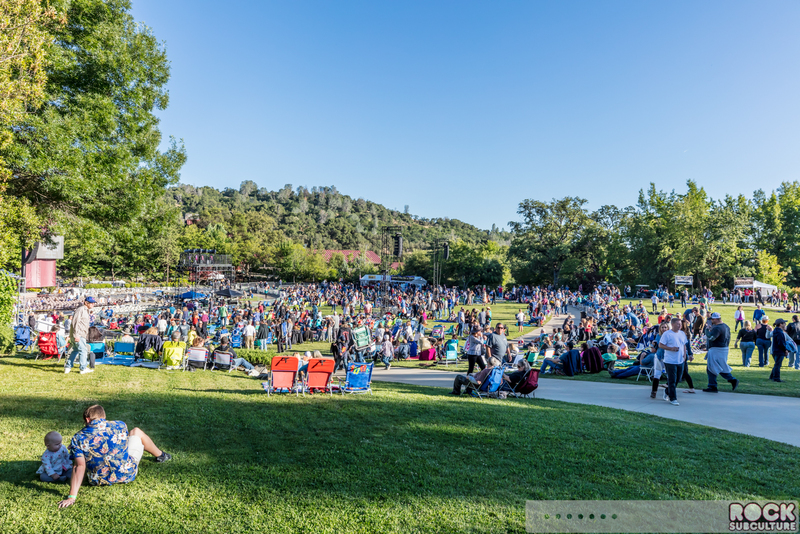 Richter Entertainment Group’s Summer Concert Season at Ironstone Amphitheatre in Murphys is taking place in June, July, August and September this year. 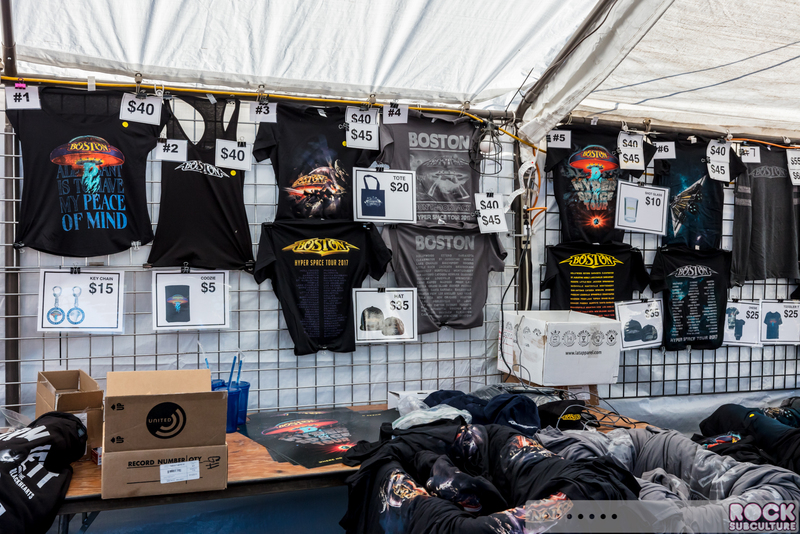 Artists include Toby Keith, Boston, Joan Jett & The Blackhearts, John Mellencamp, The Moody Blues, Jason Mraz, Lindsey Buckingham and Christine McVie, matchbox twenty, Counting Crows, Steve Miller Band, Peter Frampton, Willie Nelson, Kenny G, George Benson, and more! 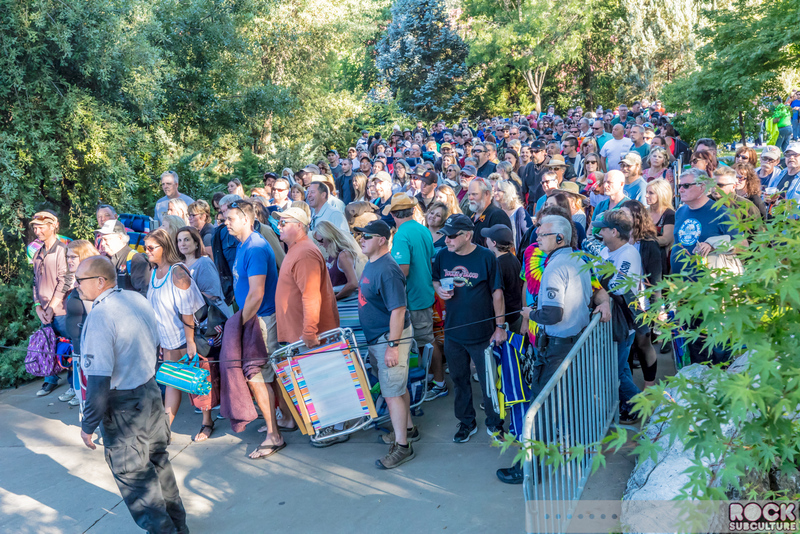 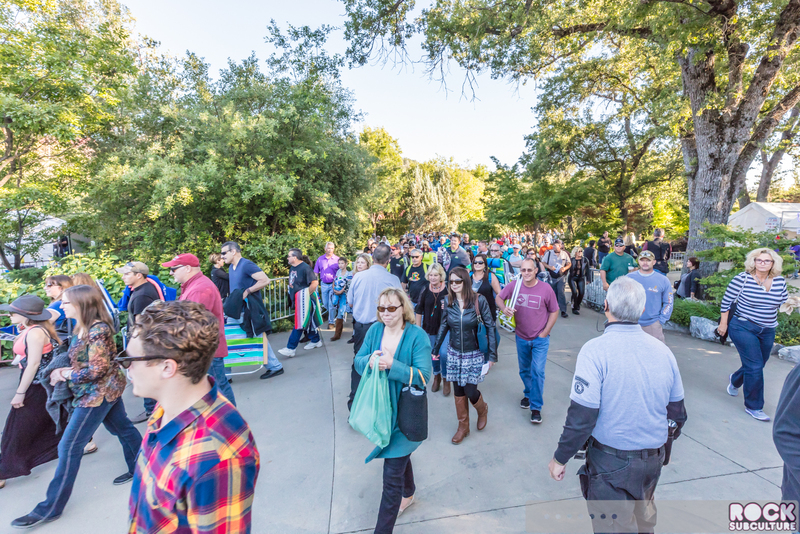 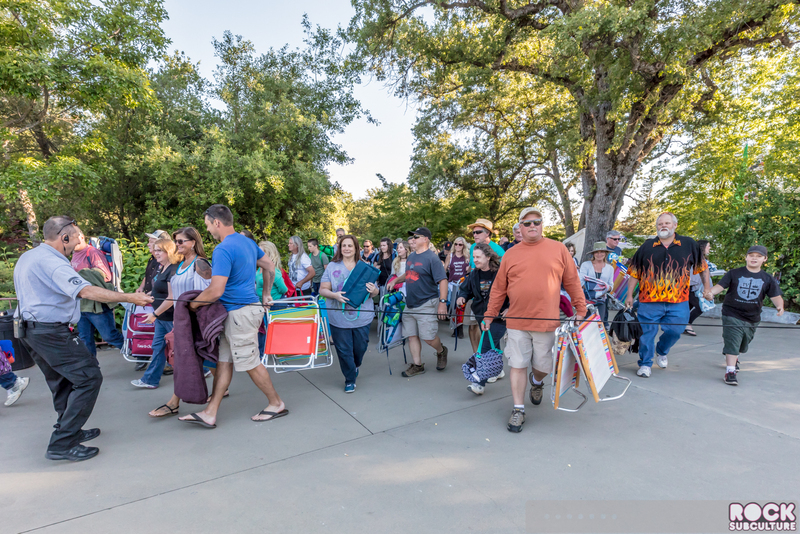 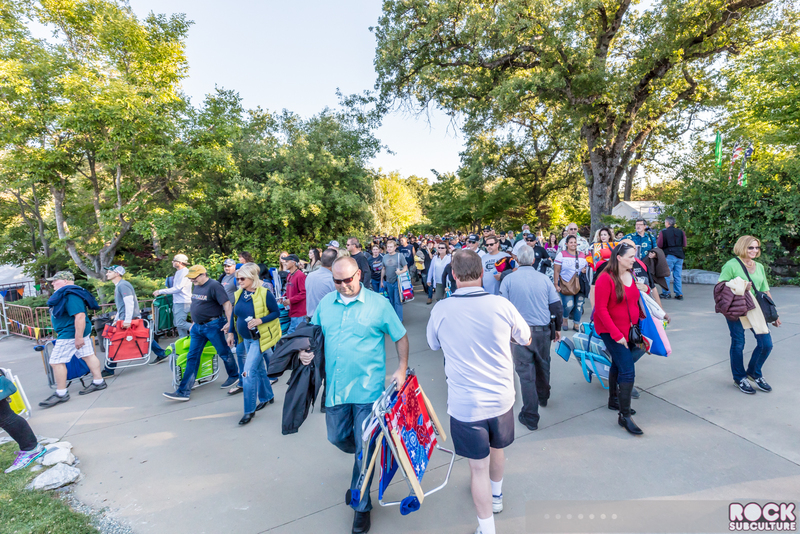 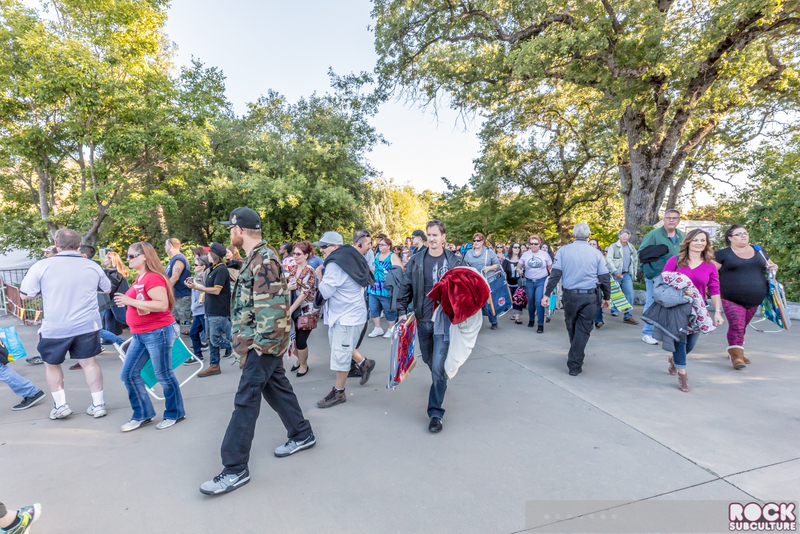 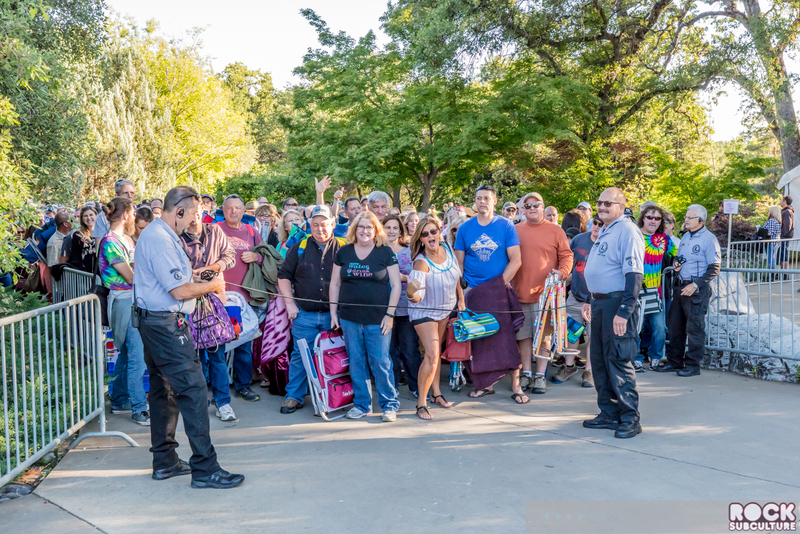 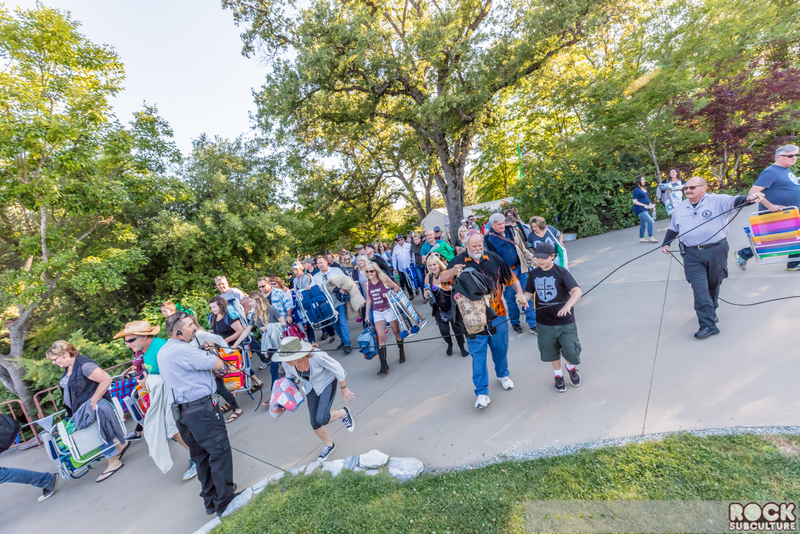 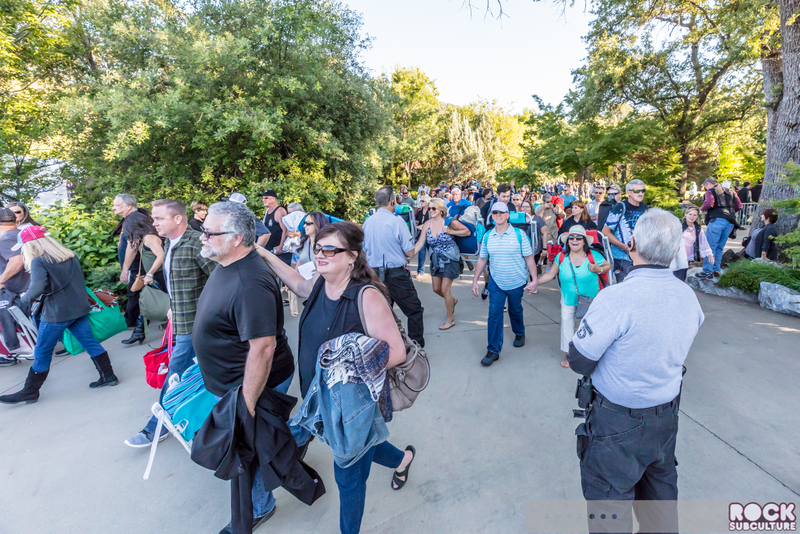 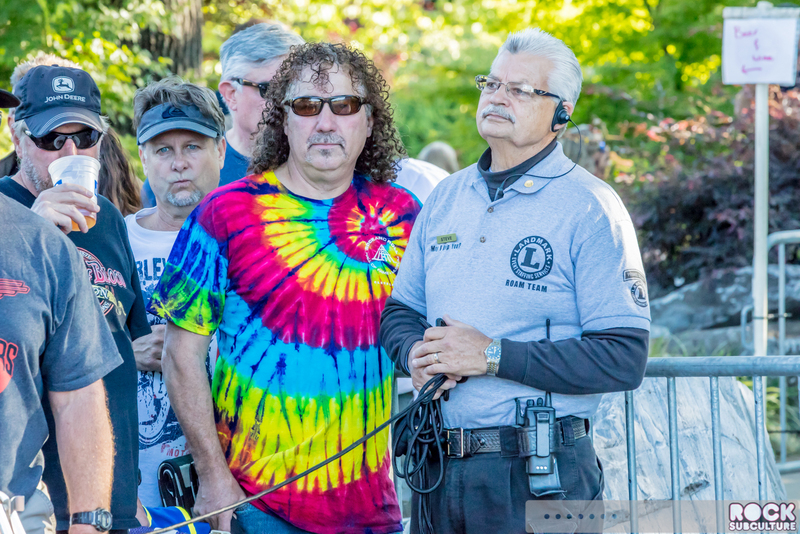 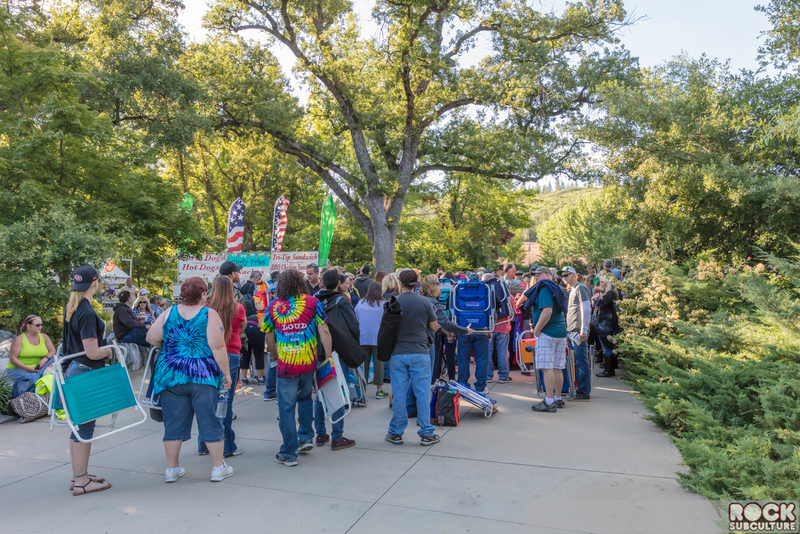 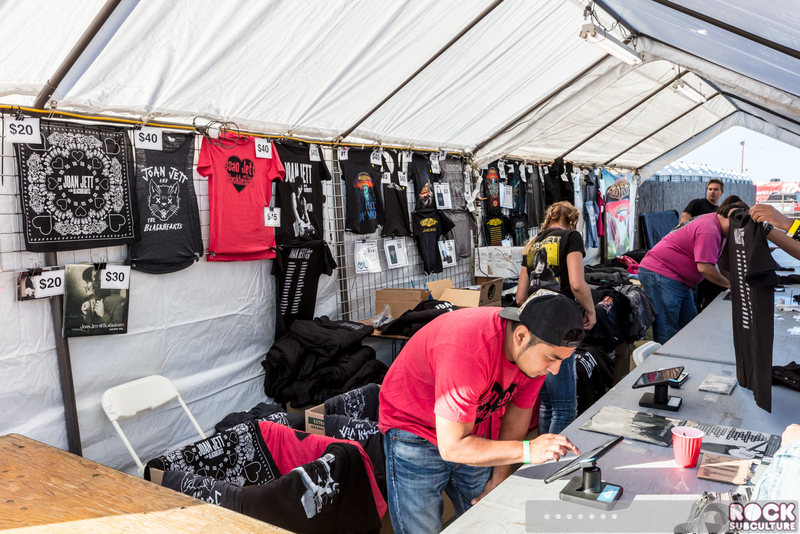 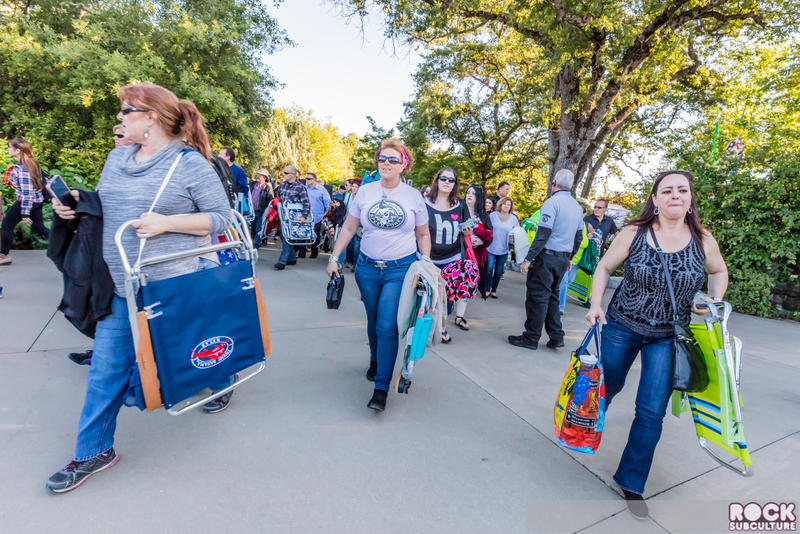 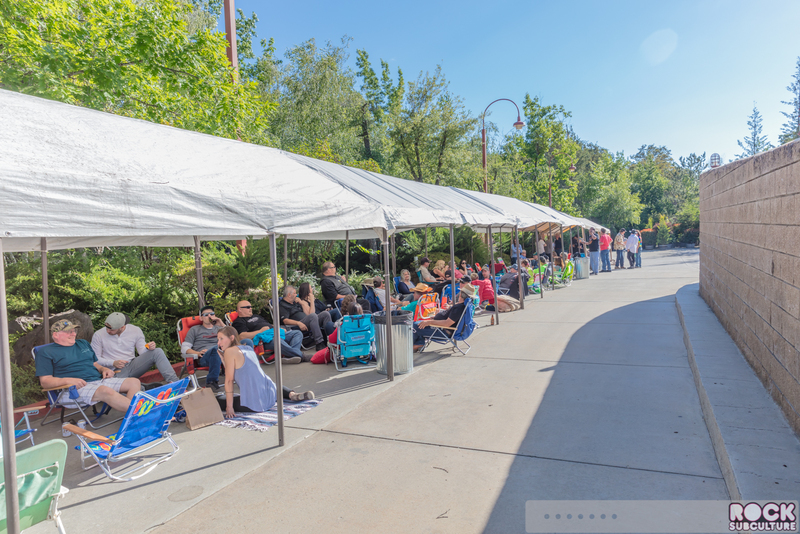 This was the second show of the season, and hours before doors fans were already lined up to have their first choice in where to set up for the general admission areas of the venue. 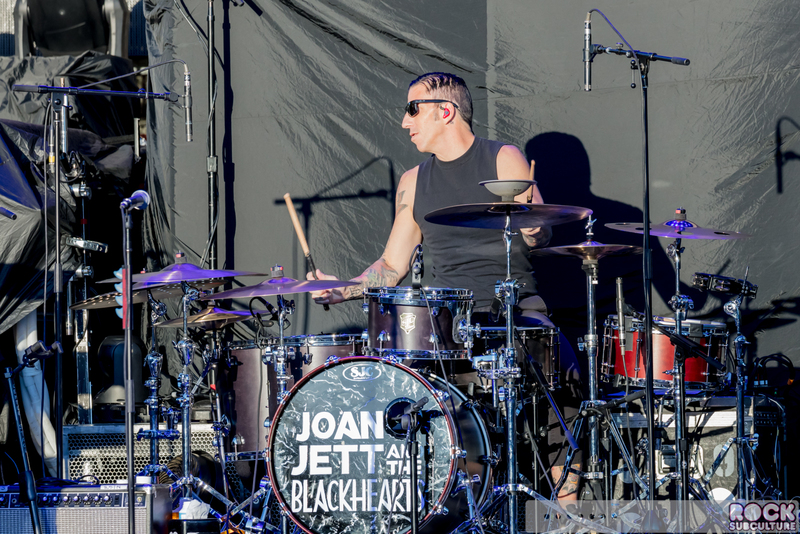 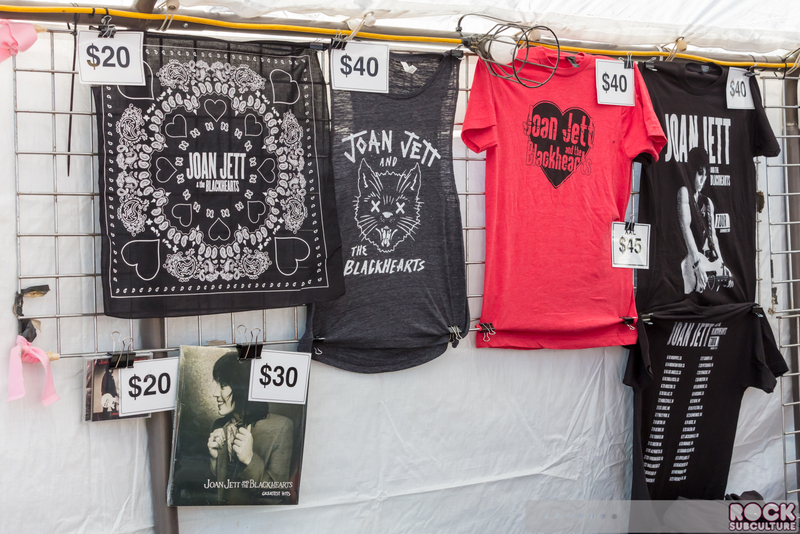 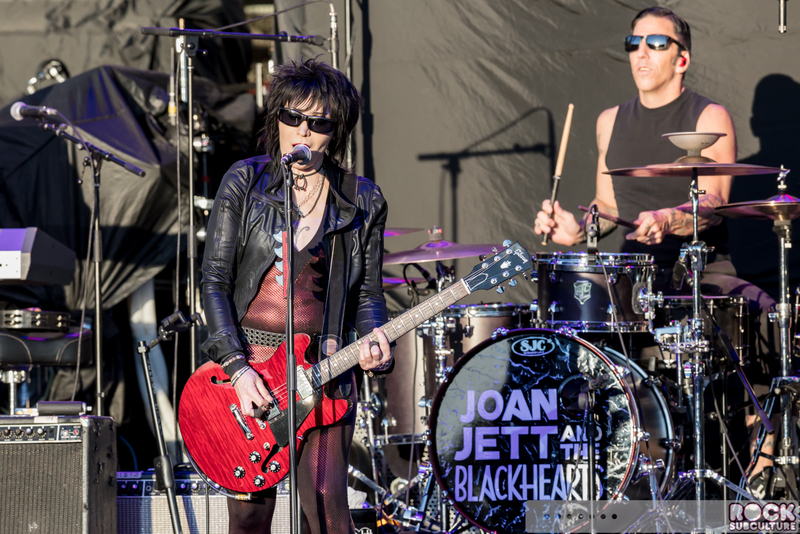 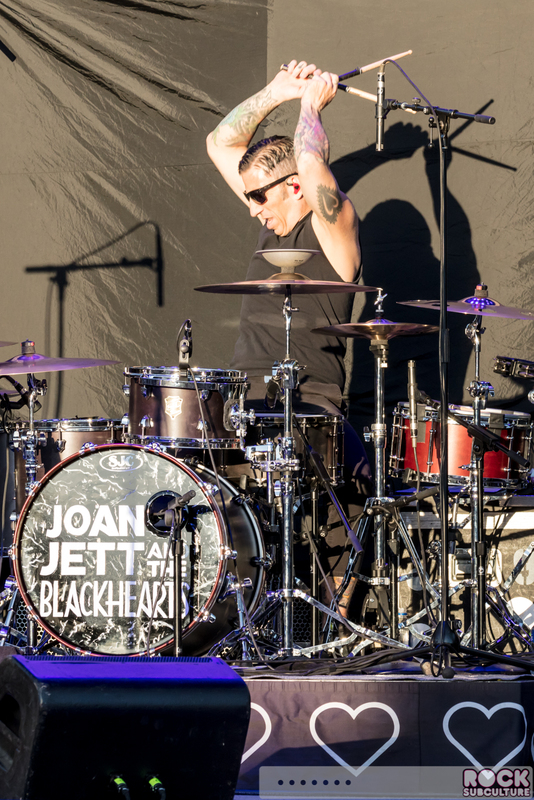 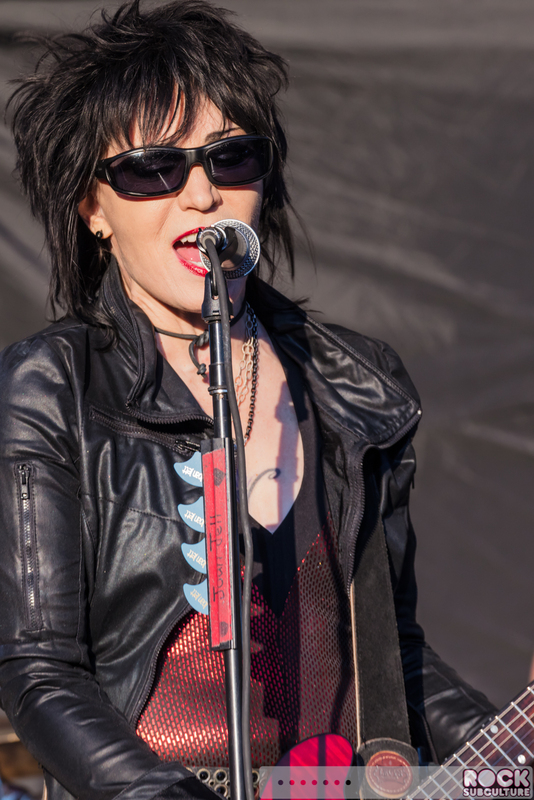 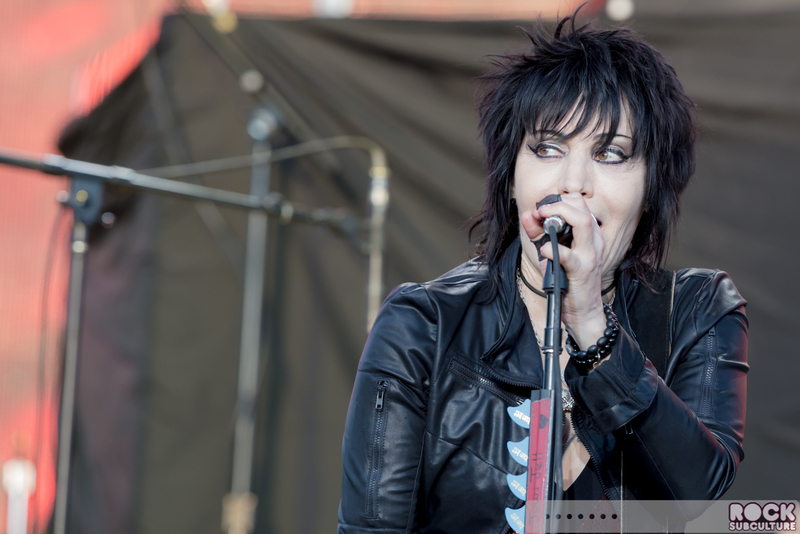 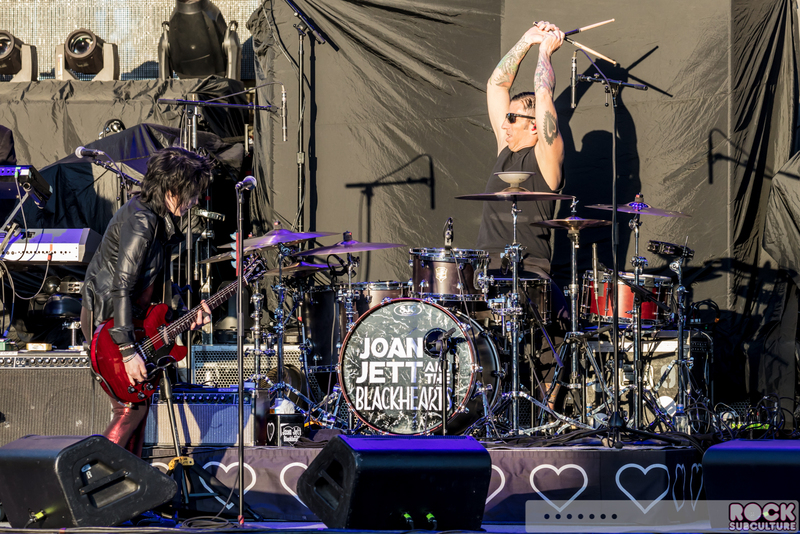 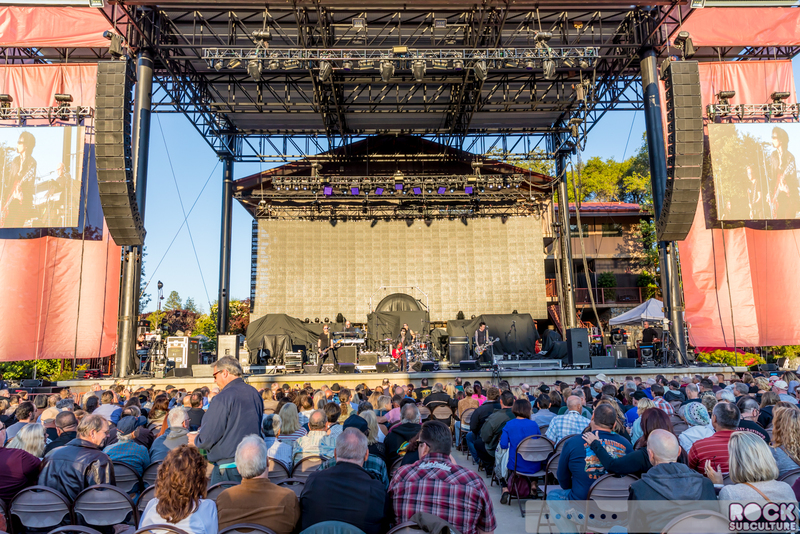 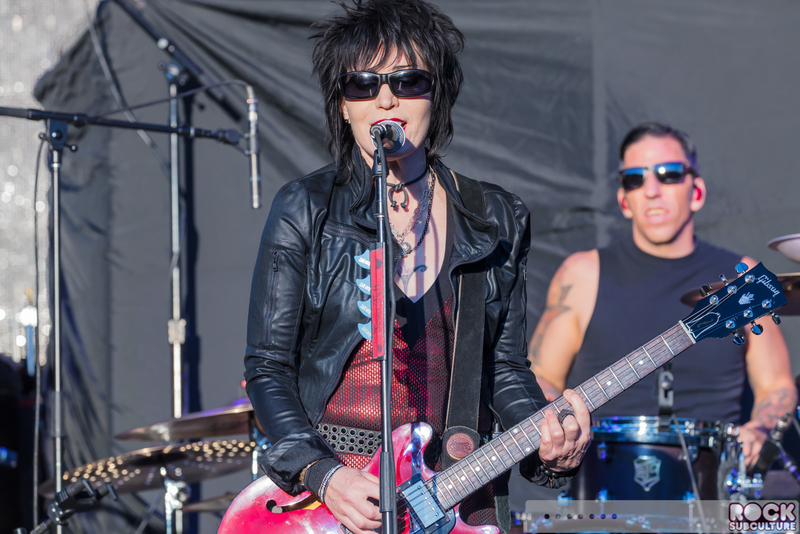 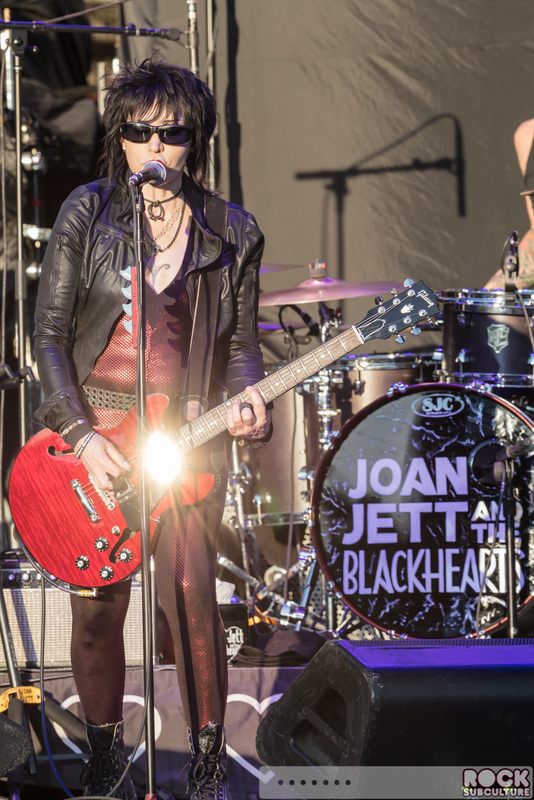 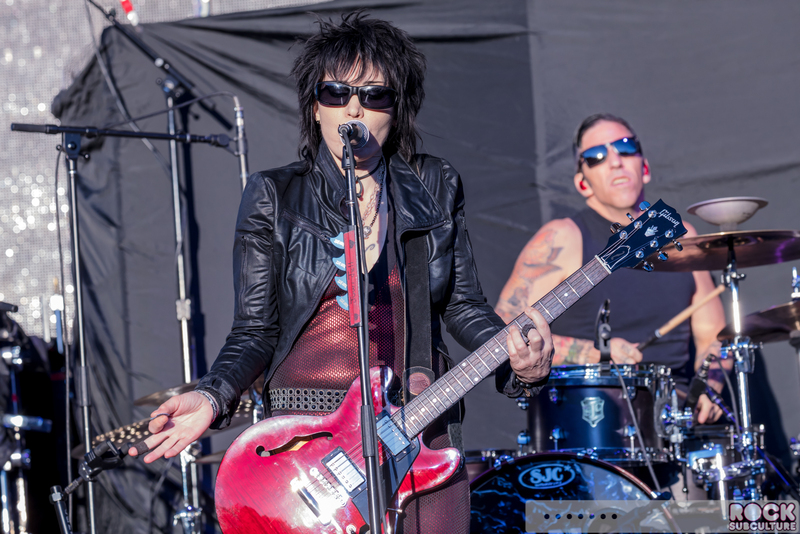 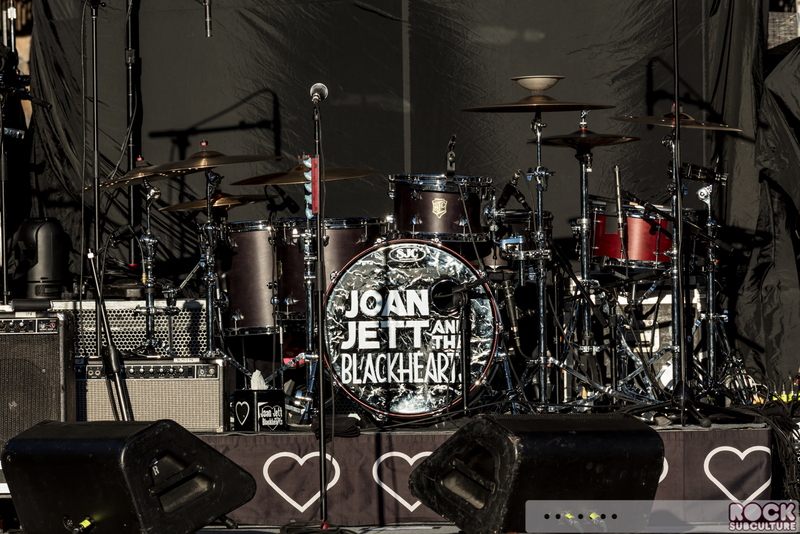 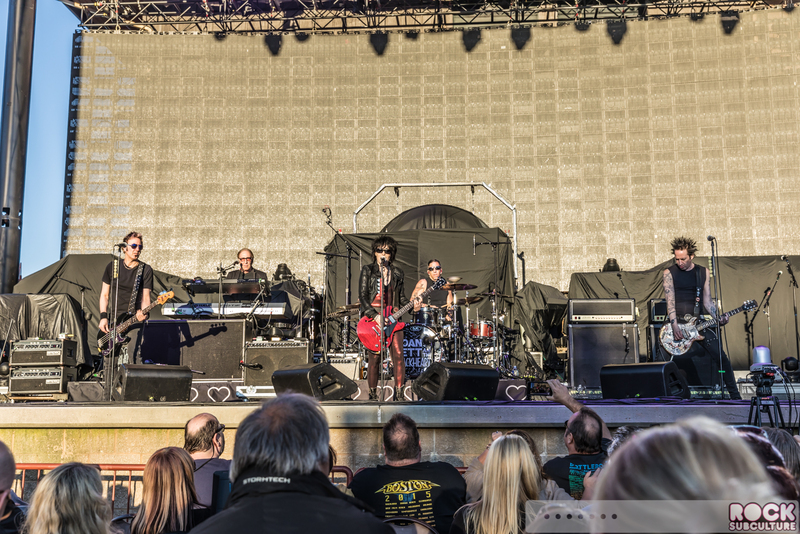 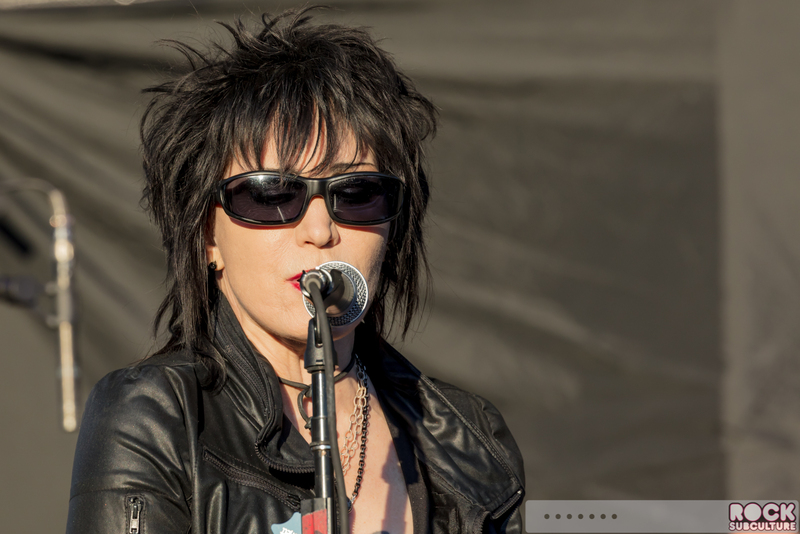 Of all the artists coming out to Ironstone Amphitheatre this season, Joan Jett & The Blackhearts is tied for first place of those I’m personally most excited to see perform. 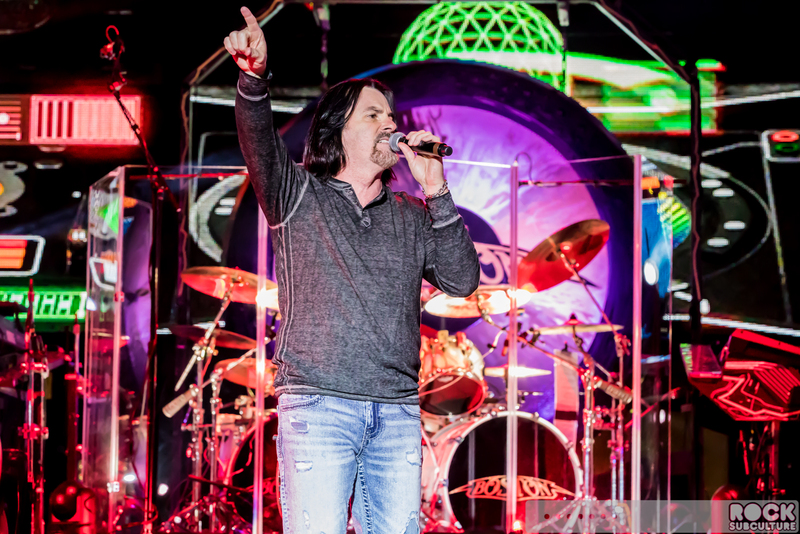 They certainly did not disappoint, with an awesome non-stop set of music including many of those most popular hits. 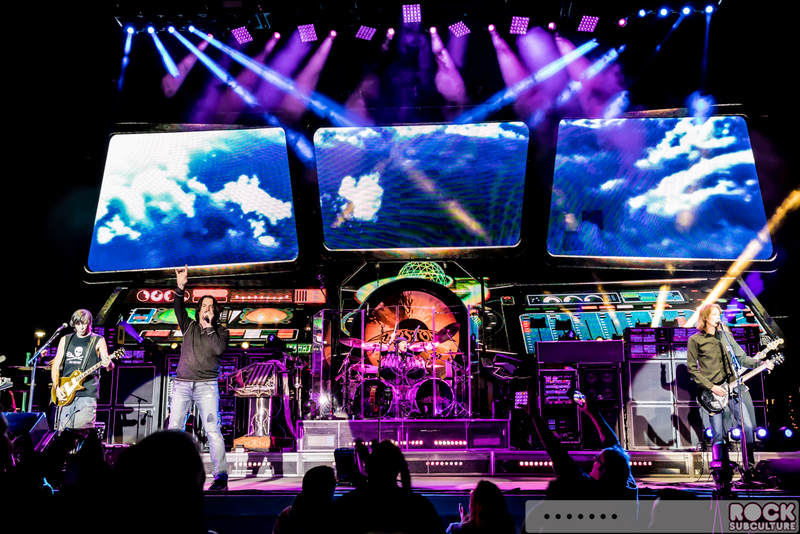 They always put on one of those shows where as soon as it’s over, you want to see them again soon. 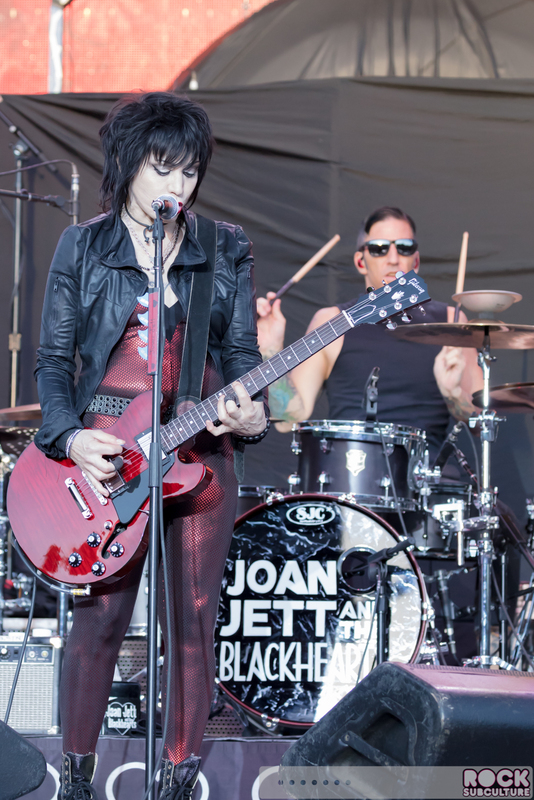 Joan Jett real rock and roll legend. 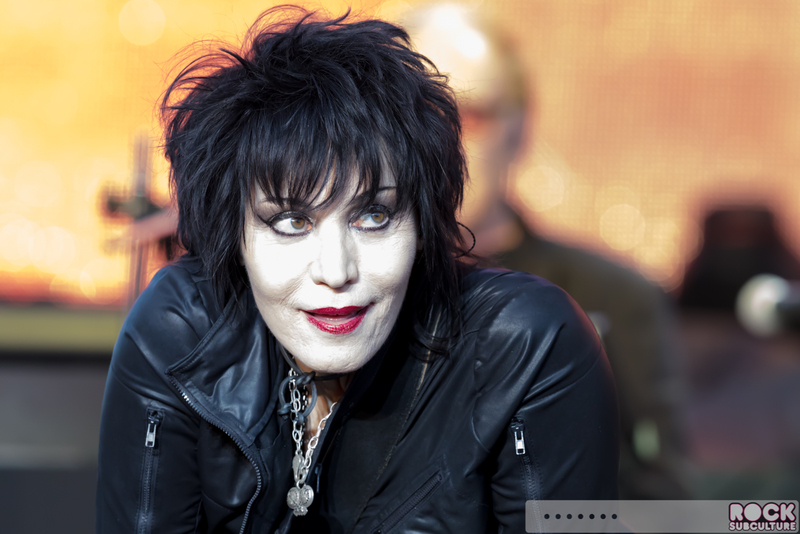 Of all of the amazing artists to flourish in the 80s in particular, she is one of the few who still stands as an icon of that era. 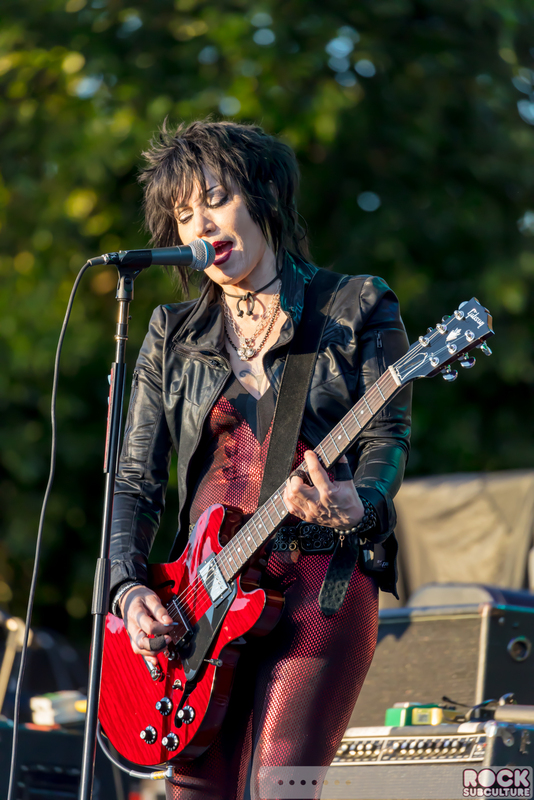 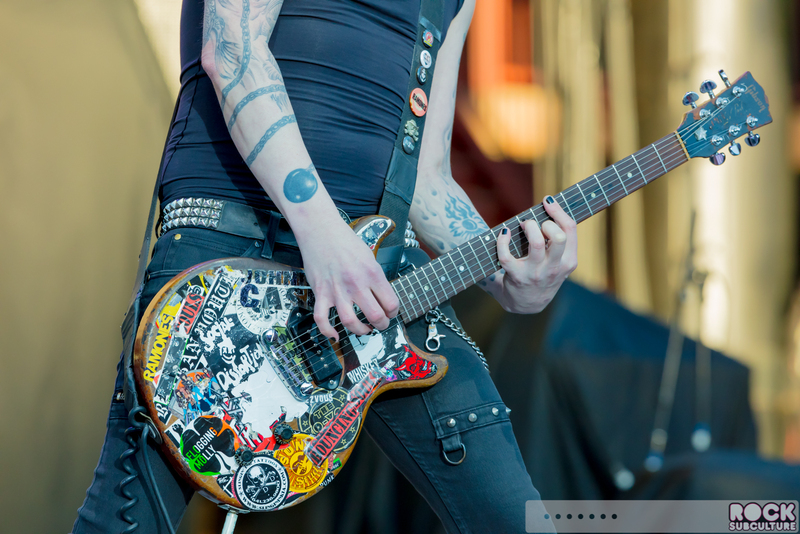 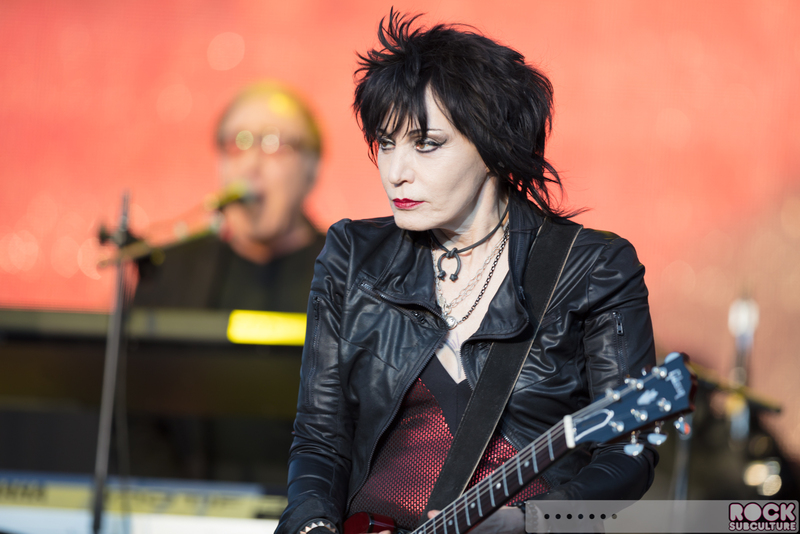 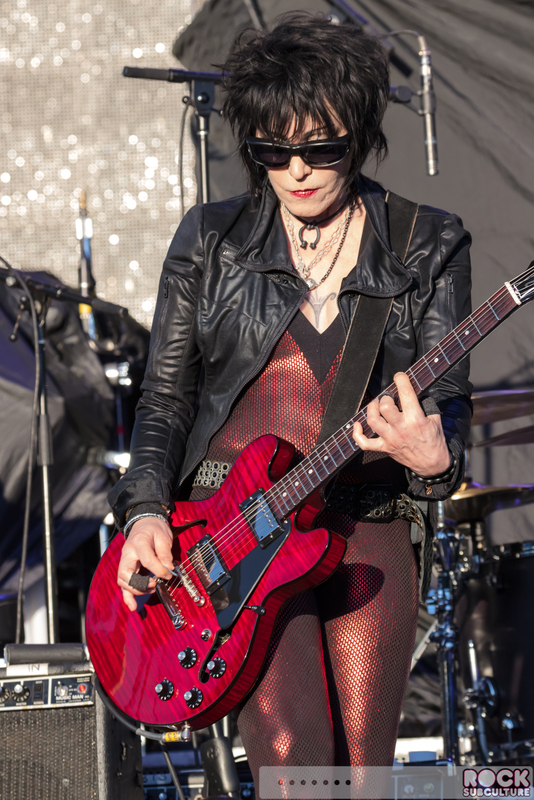 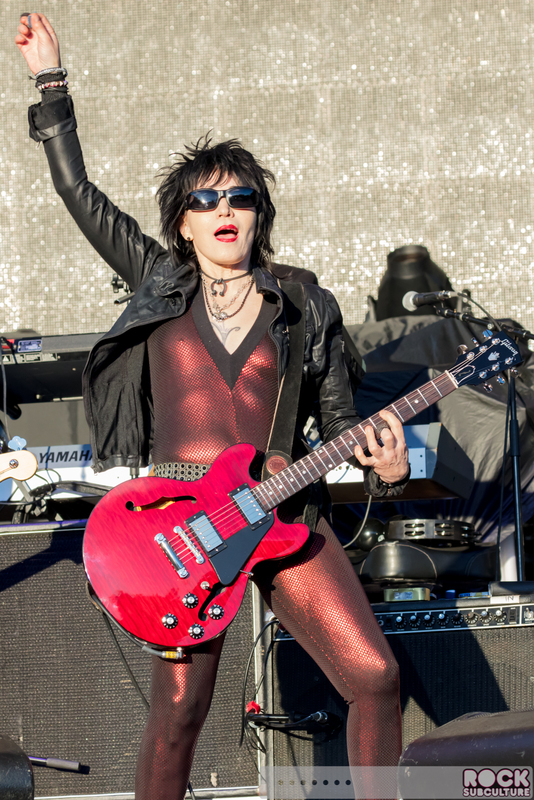 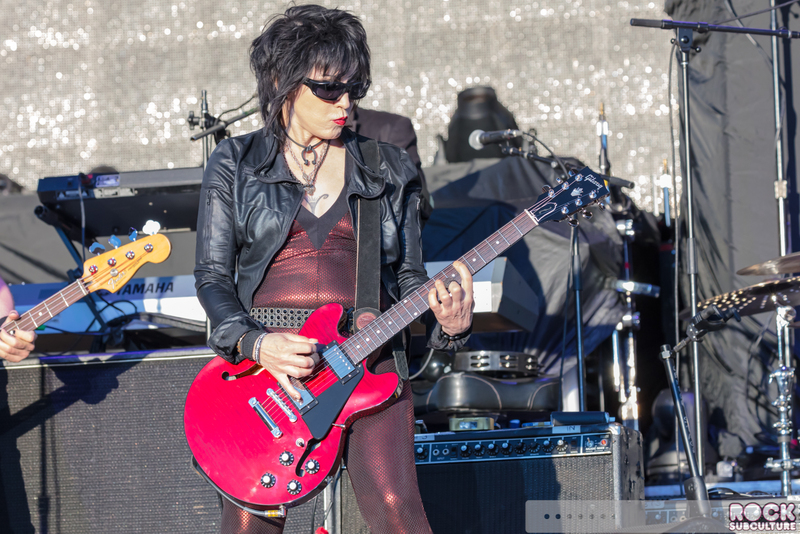 Joan Jett’s history and innovation in music and the pop culture scene goes all the way back to her teenage years. 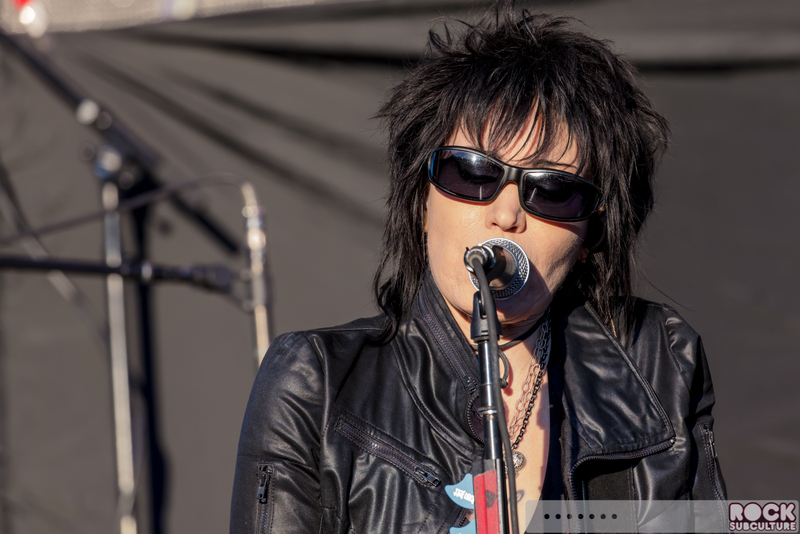 A great synopsis of her beginnings with rock and roll is the 2010 Floria Sigismondi film, The Runaways, which chronicles the ups and downs of her first all-girl rock band in the 70s. 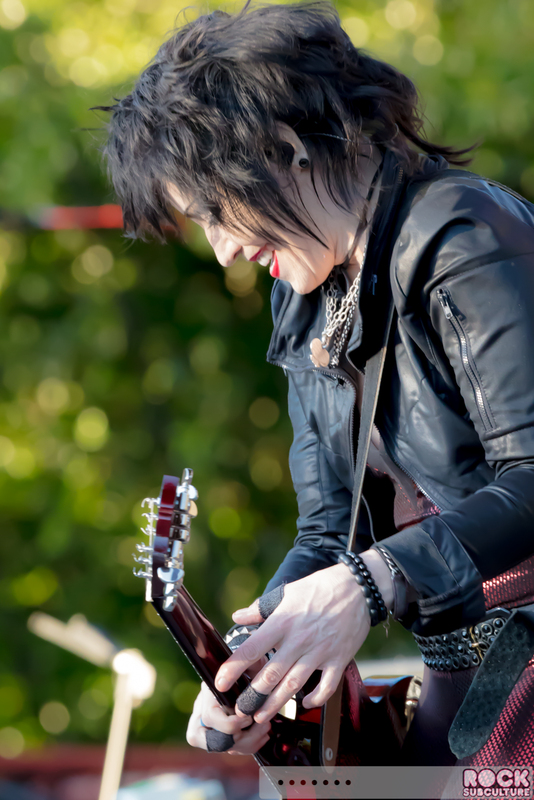 Jett was also an executive producer on the film which featured Kristen Stewart playing the younger version of herself. 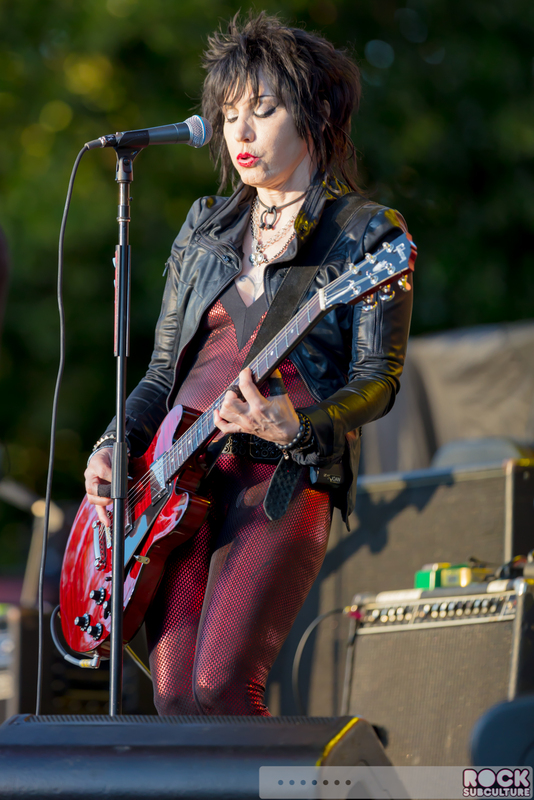 The Runaways was comprised of Joan Jett, Cherie Currie, Lita Ford, Sandy West, and Jackie Fox, and after huge success, the band imploded and Joan Jett ultimately beginning her solo career in 1979. 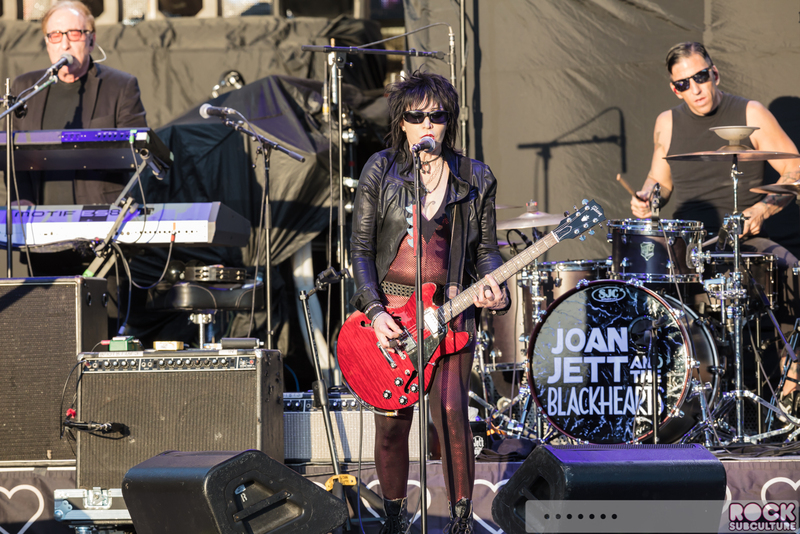 In a change from her groundbreaking all-girl origins, she sought out “three good men” to form the Blackhearts. 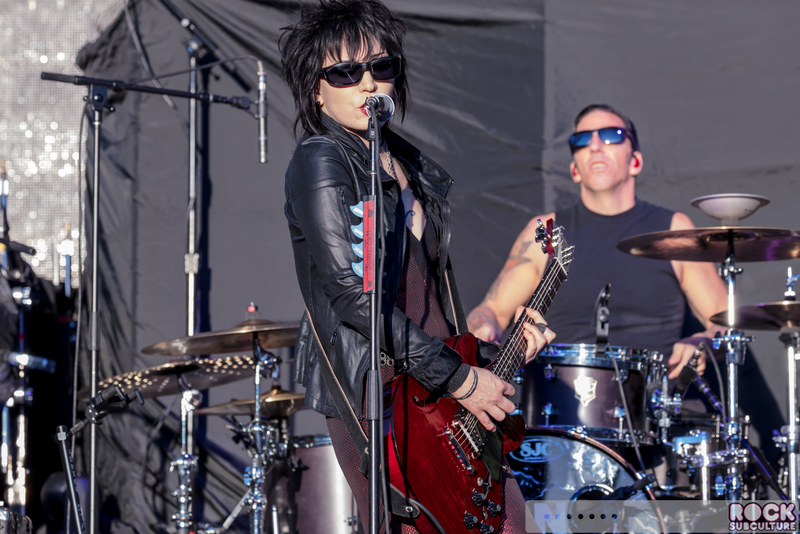 As a kid, I always had a loose association between Joan Jett and Billy Idol… both were pioneers (for their respective genders) in the leather wearing punk icon with kind of a pop twist, and both came from being one part of a former band to record under their own names with their own new bands. 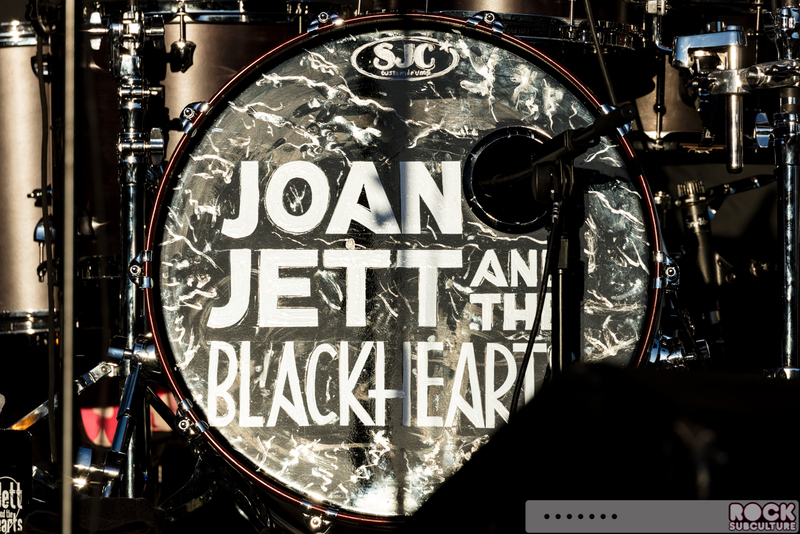 Funny enough, and unbeknownst to me at the time, they actually have a bit of history together. 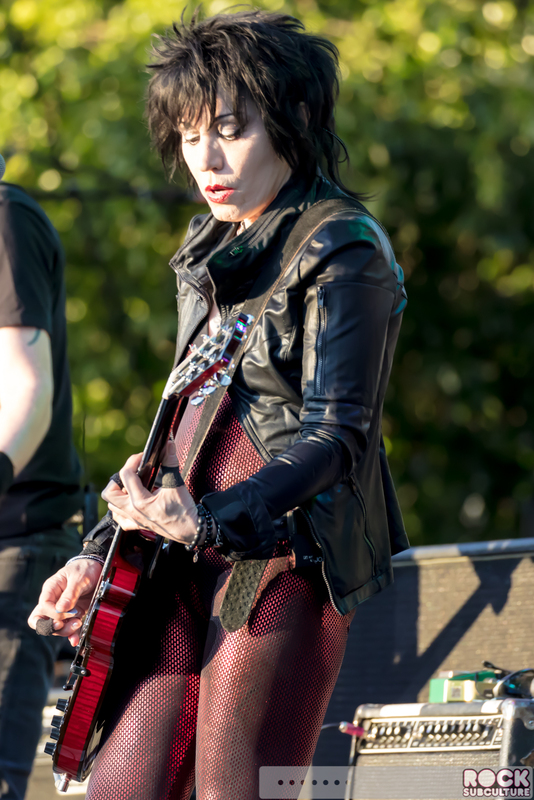 Joan Jett and her new band had a string of hits that helped to define the sound and energy of the 80s, including “I Love Rock ‘n’ Roll”, “Bad Reputation”, “I Hate Myself for Loving Your”, and “Crimson and Clover” (a cover of a Tommy James and the Shondells song from 1968). 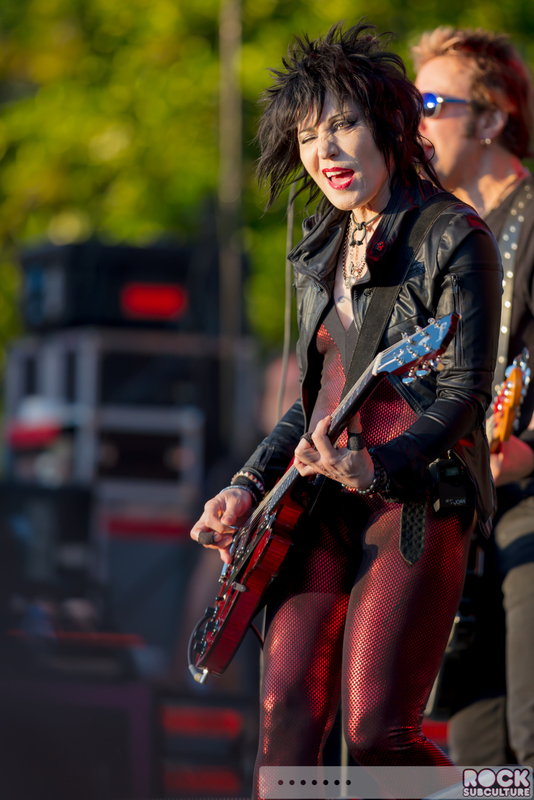 Joan Jett was not just a pioneer in music, but in fashion and lifestyle as well, with her distinctive, sleek, punk look. 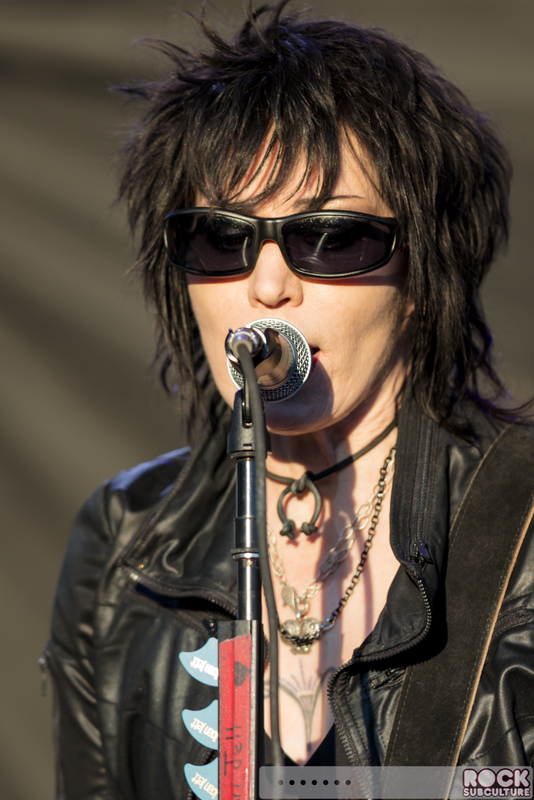 In addition to recording her own music, Jett had produced for others, including artists on her own Blackheart Records, which she founded with Kenny Laguna. 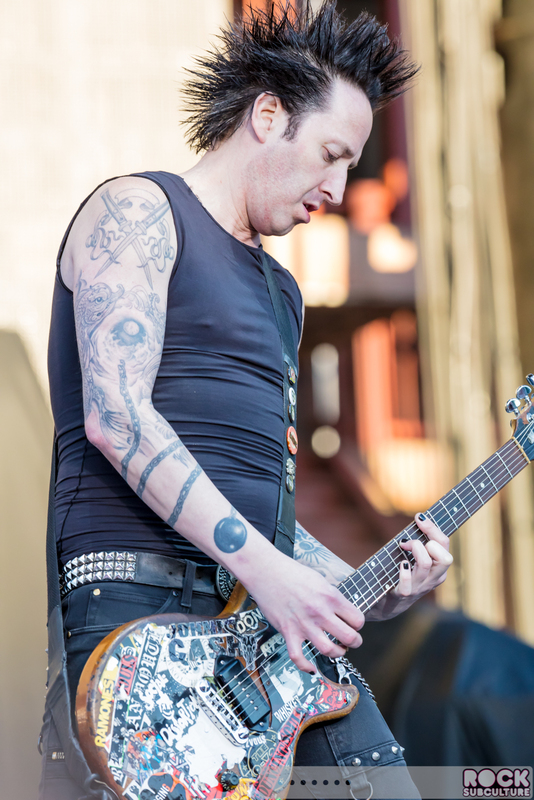 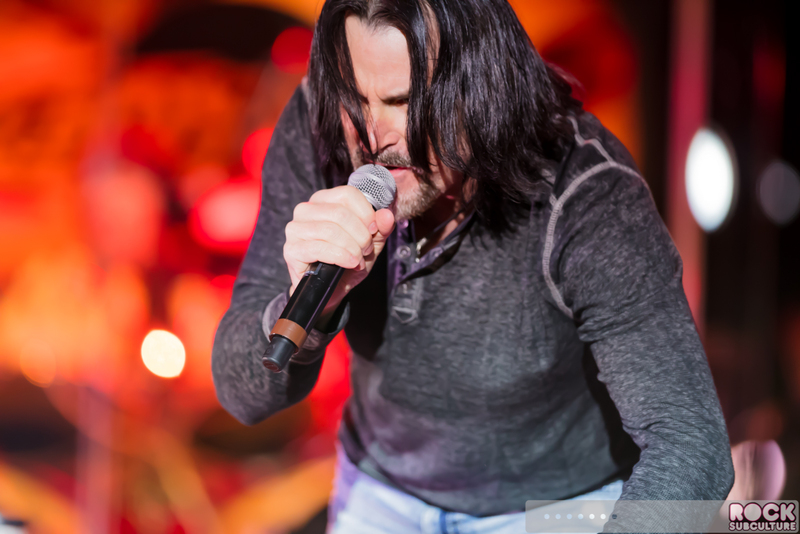 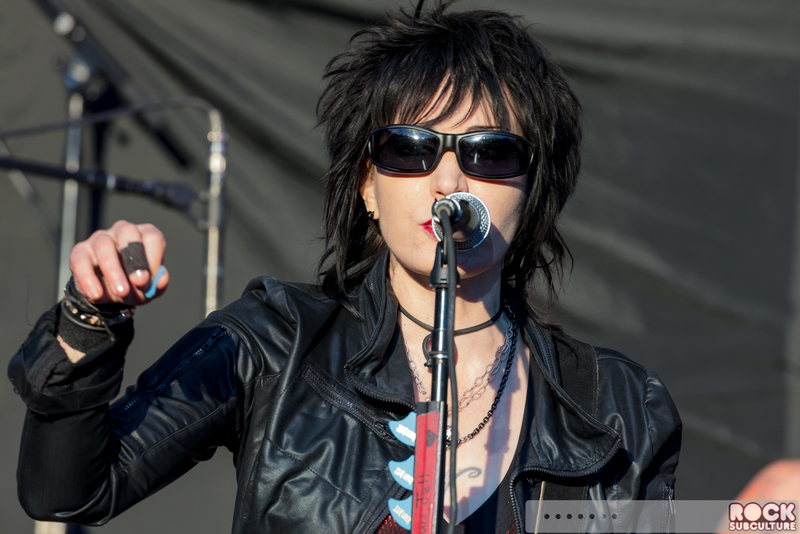 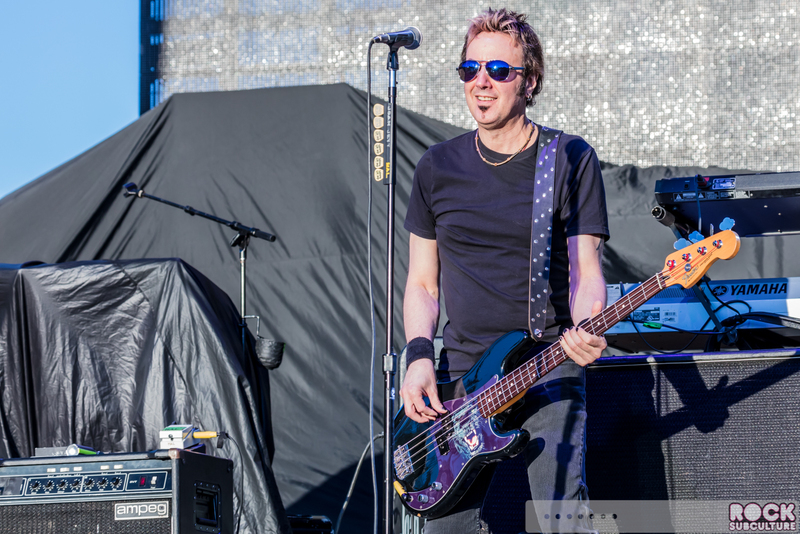 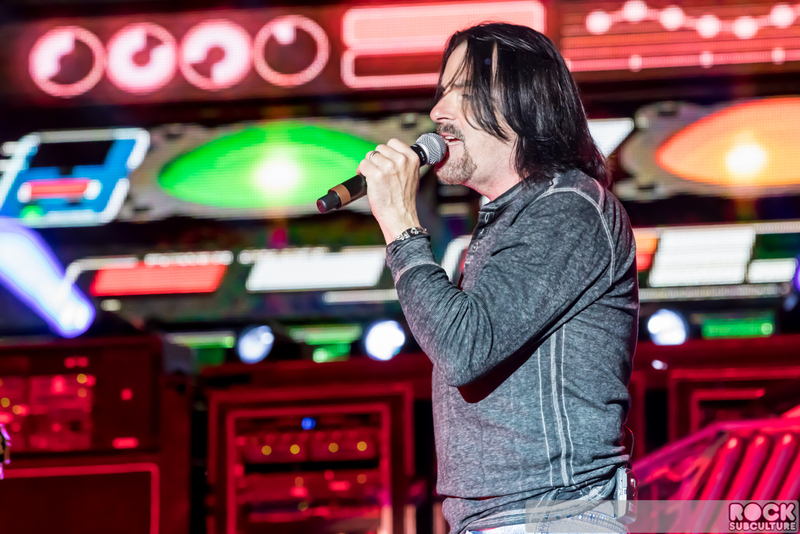 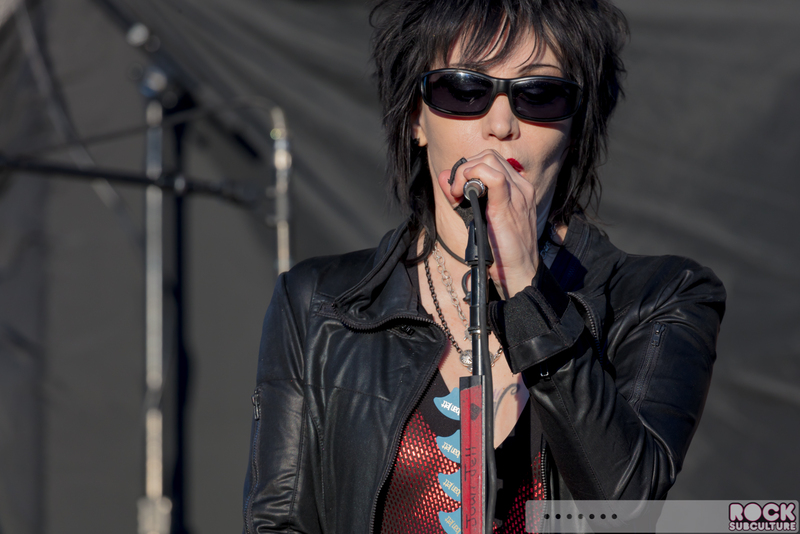 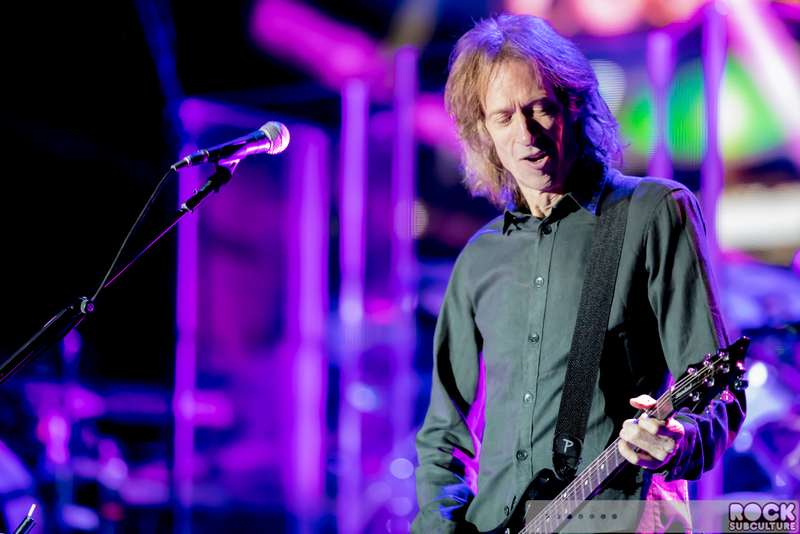 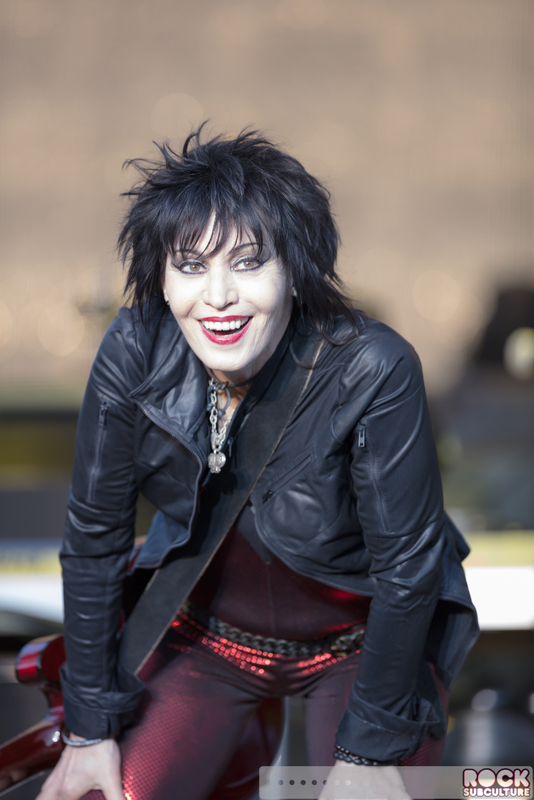 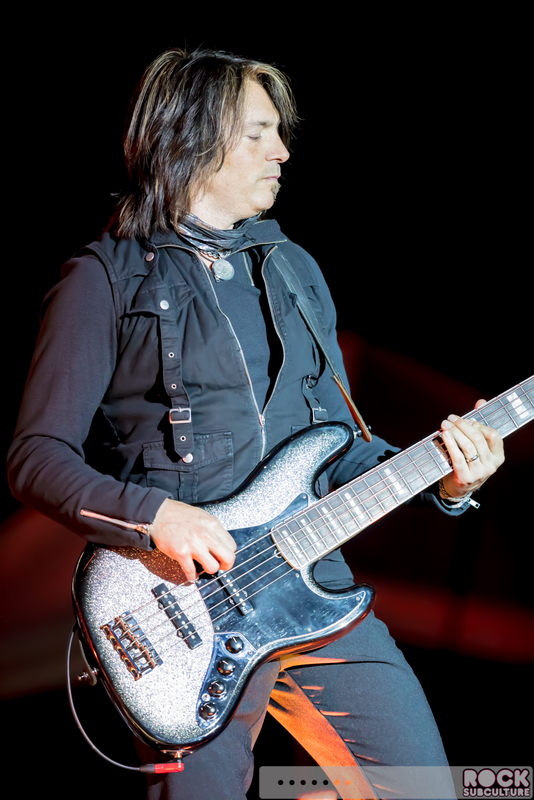 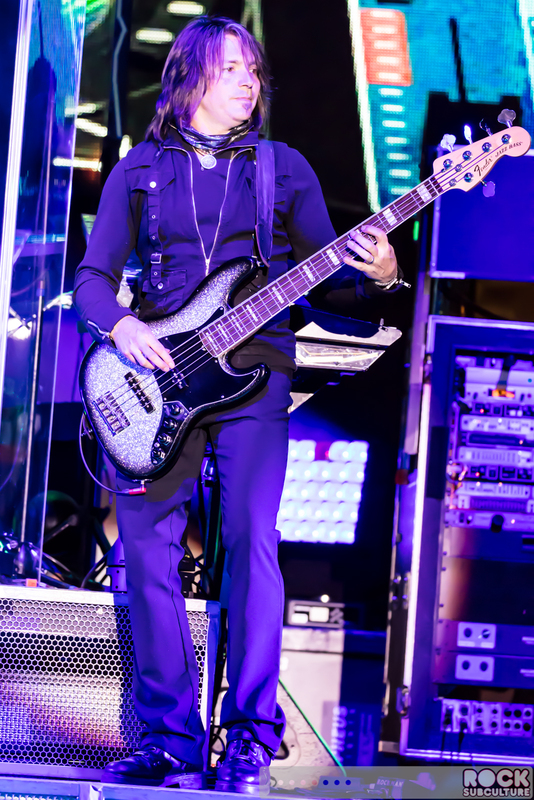 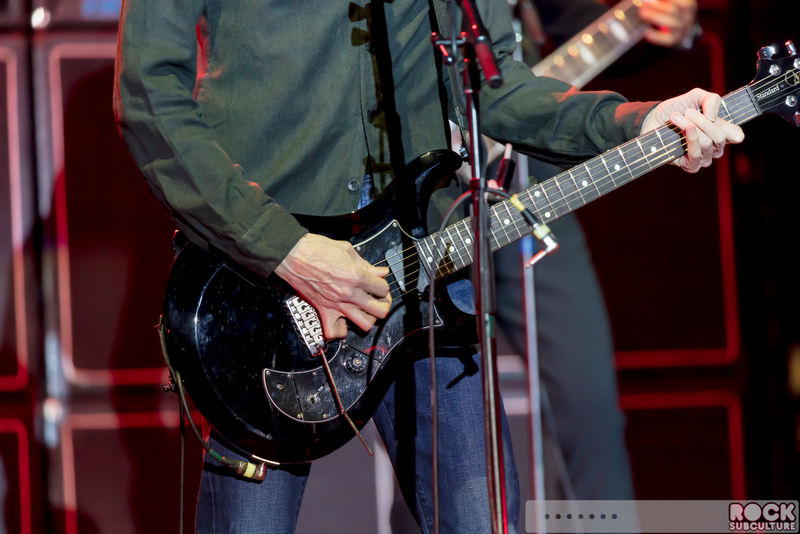 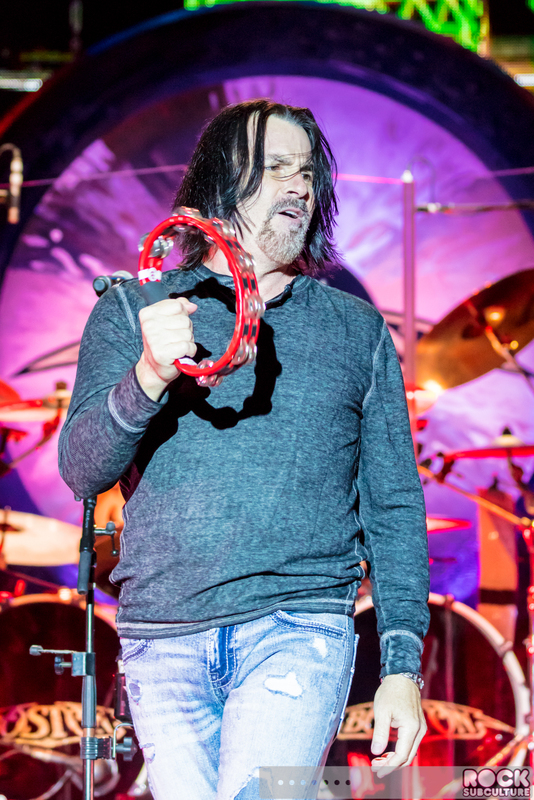 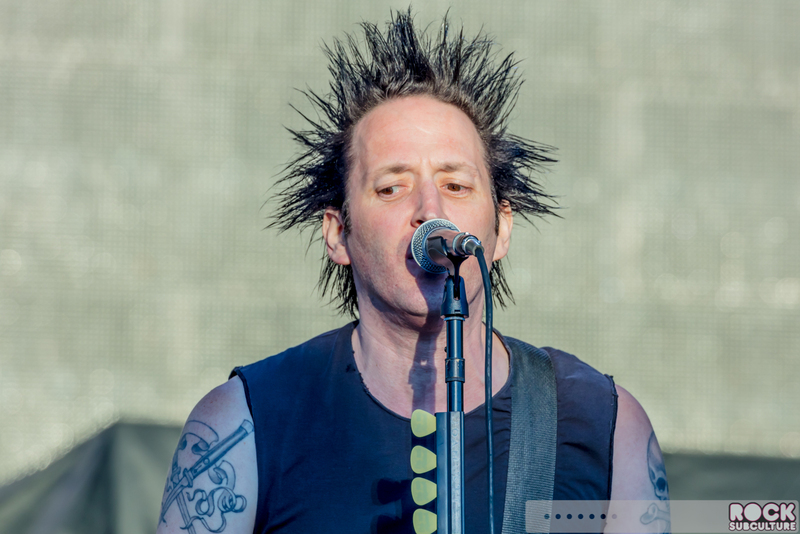 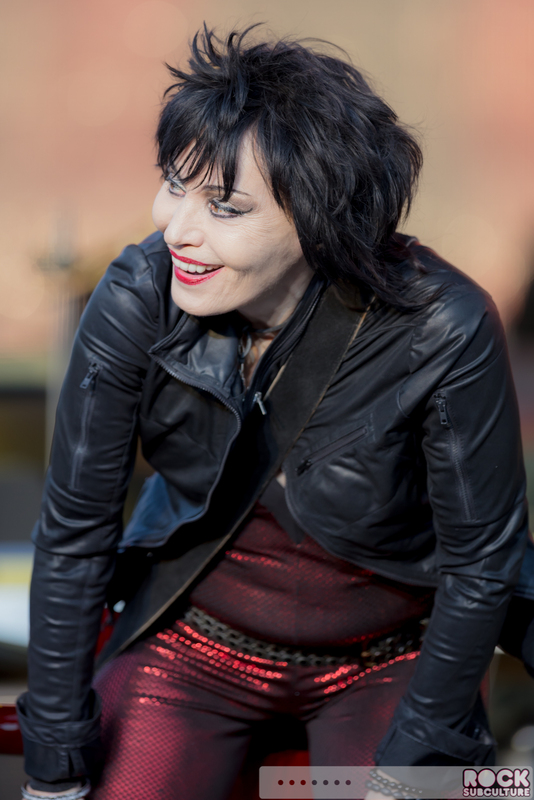 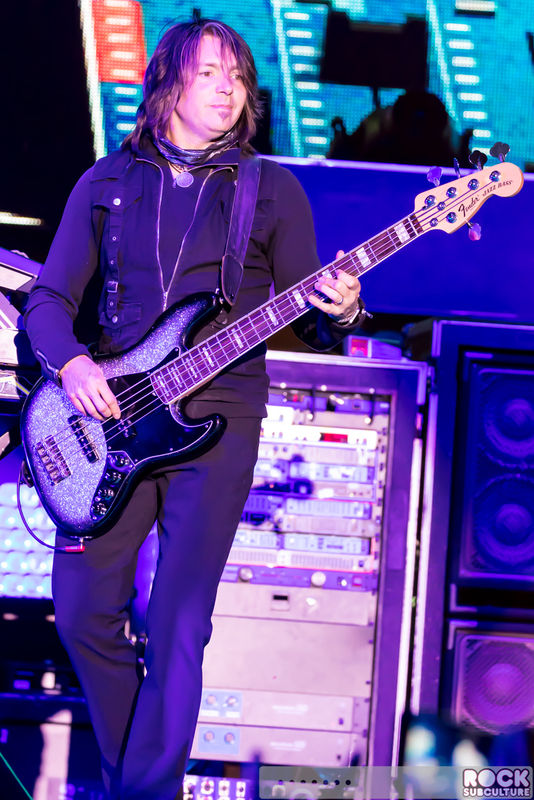 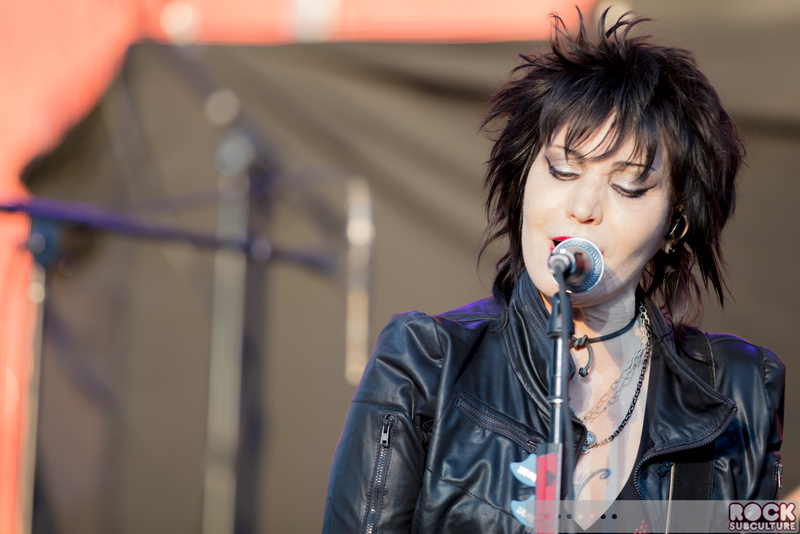 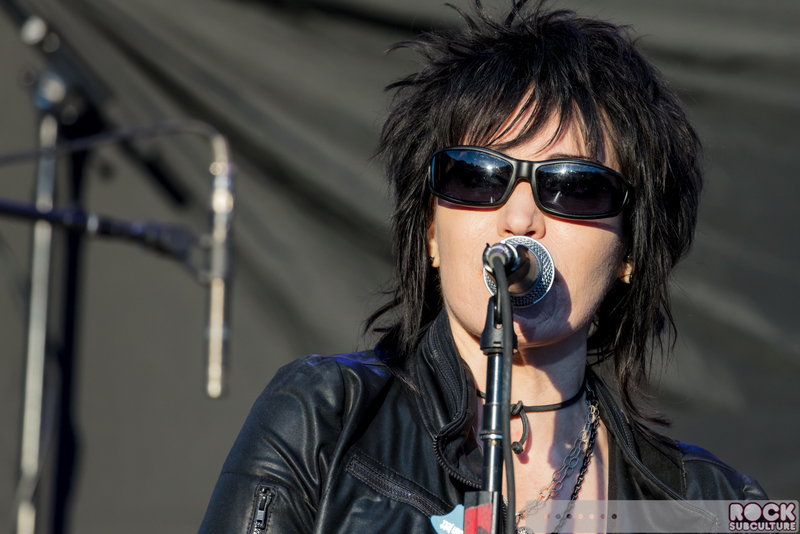 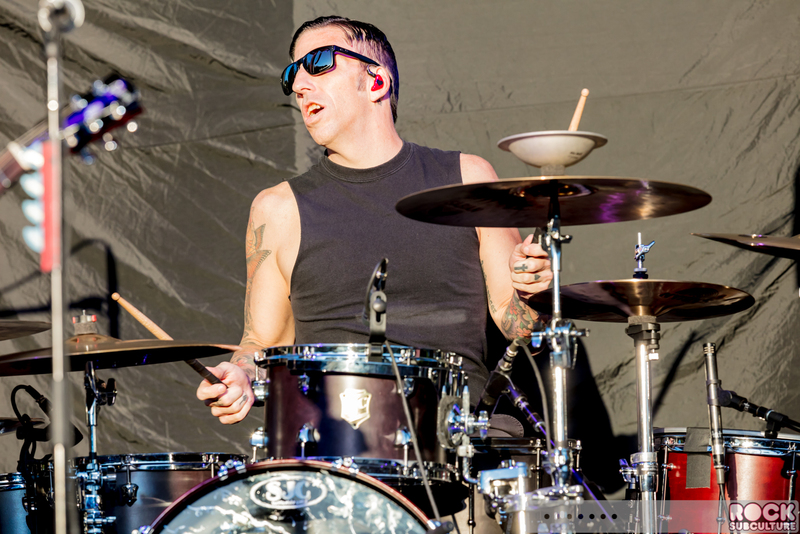 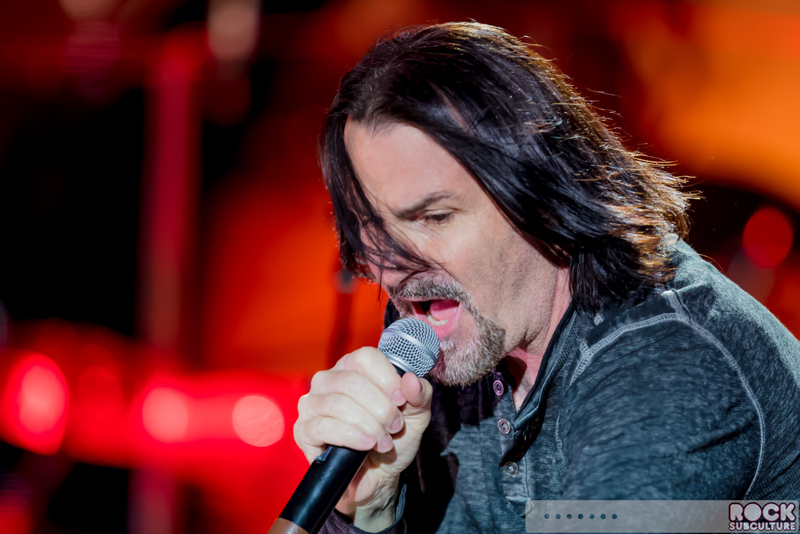 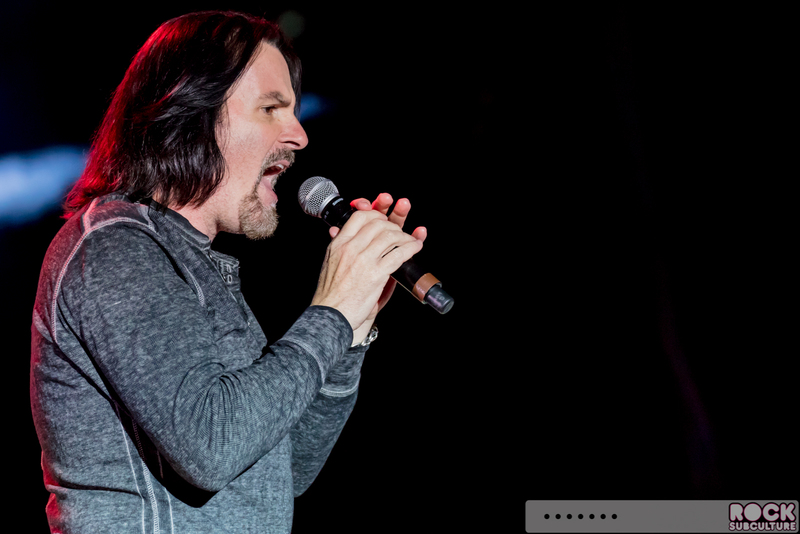 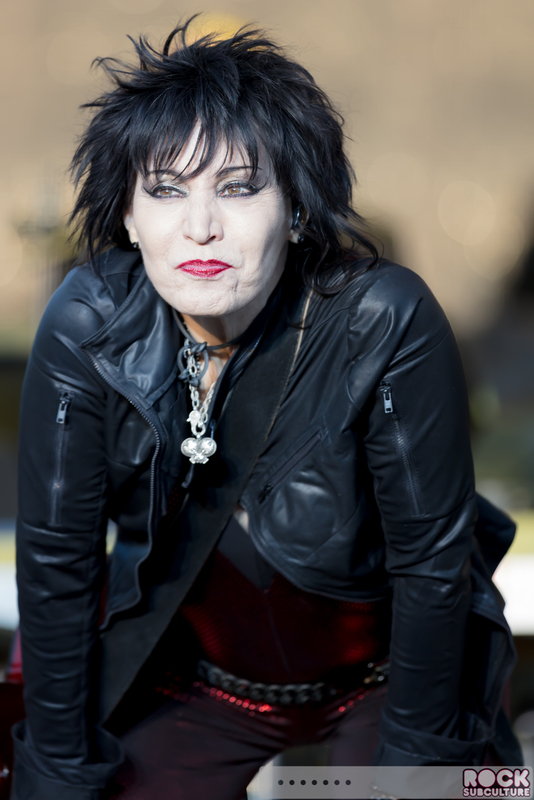 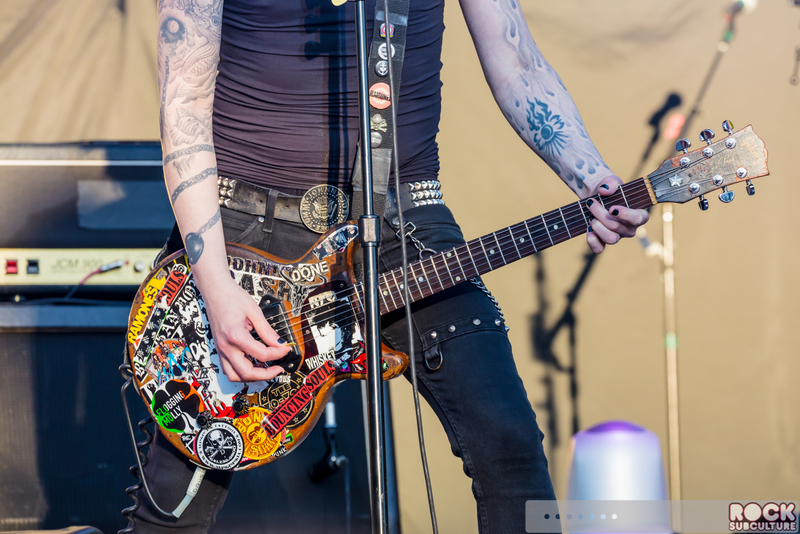 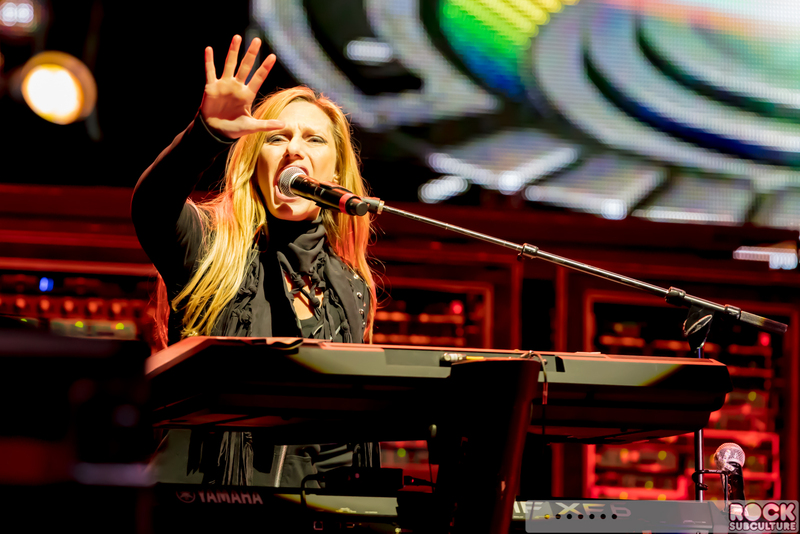 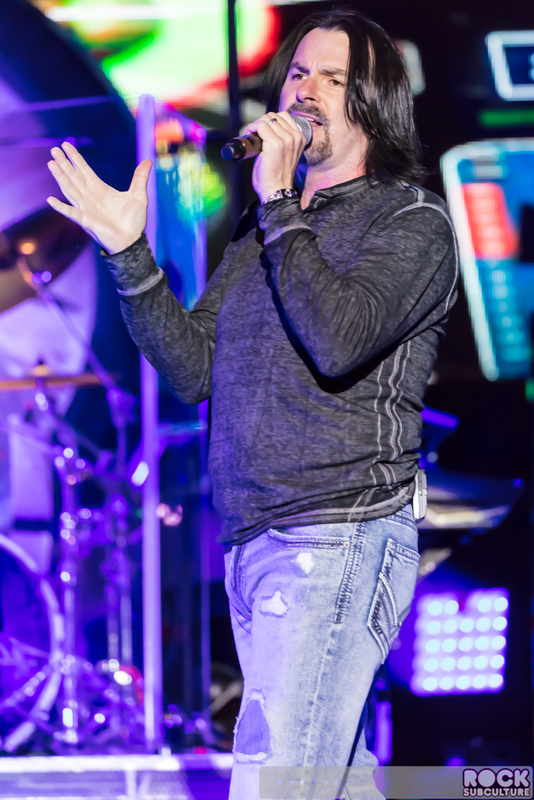 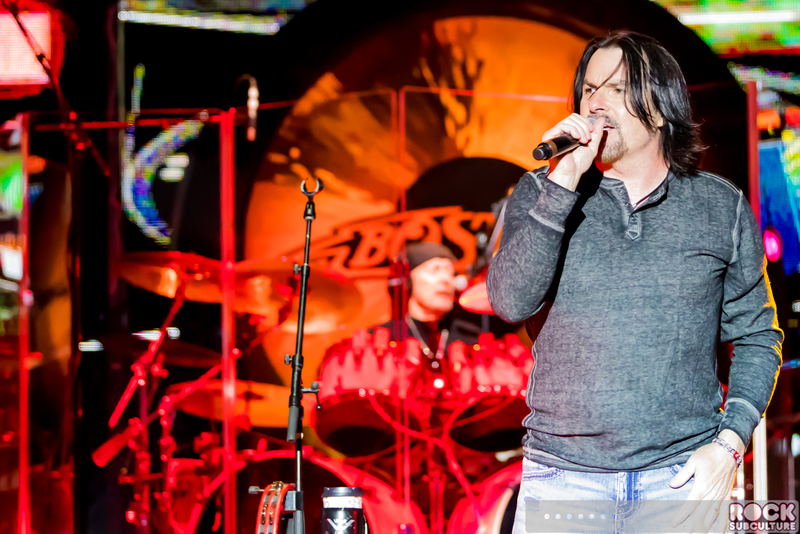 Jett’s most recent album with all-new material – Unvarnished – was released in 2013. 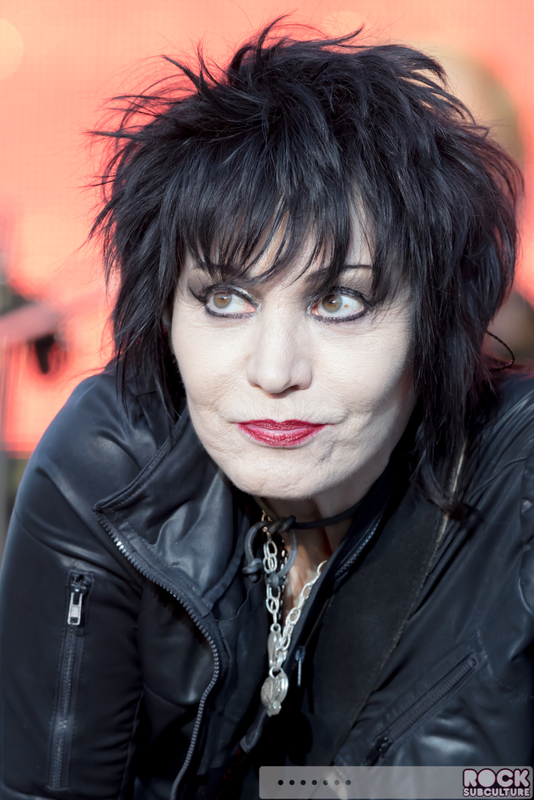 In 2015, she was inducted into the Rock and Roll Hall of Fame. 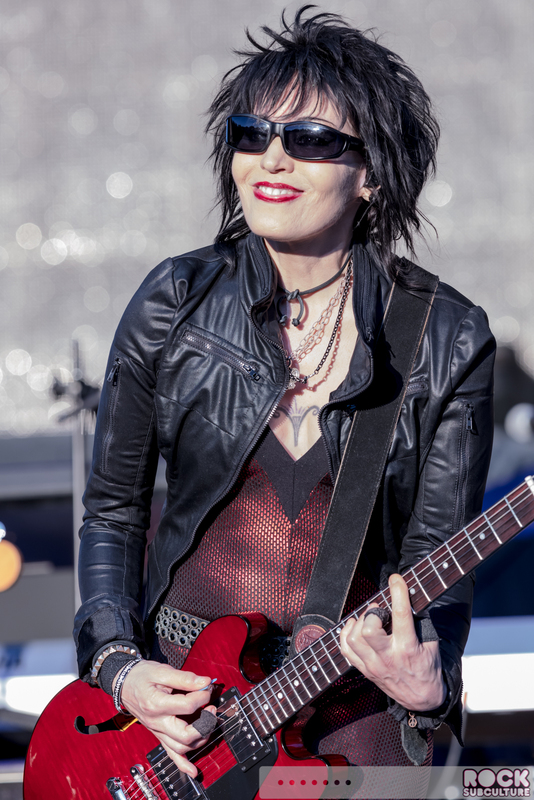 With their appearance at Ironstone, the band strolled onto the stage with Jett flashing one of her trademark, welcoming smiles as she made her way to her mic and guitar. 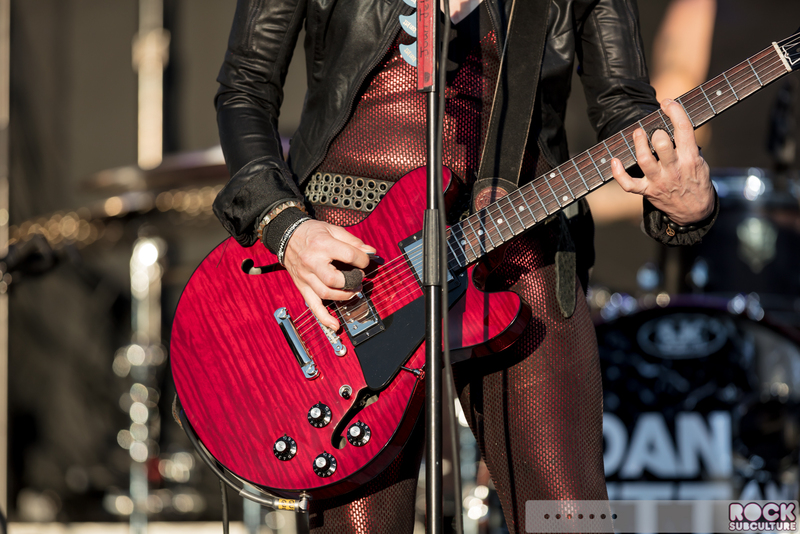 She looks fantastic and dresses the part, beaming with style that is true to her legend. 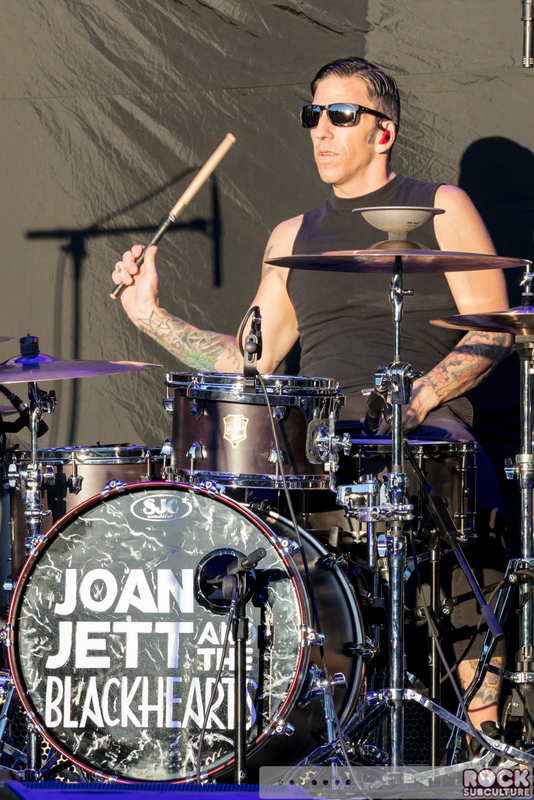 They are touring with a new drummer since I last saw them perform, Michael McDermott, who drove the music fast and hard, just as you want to hear it. 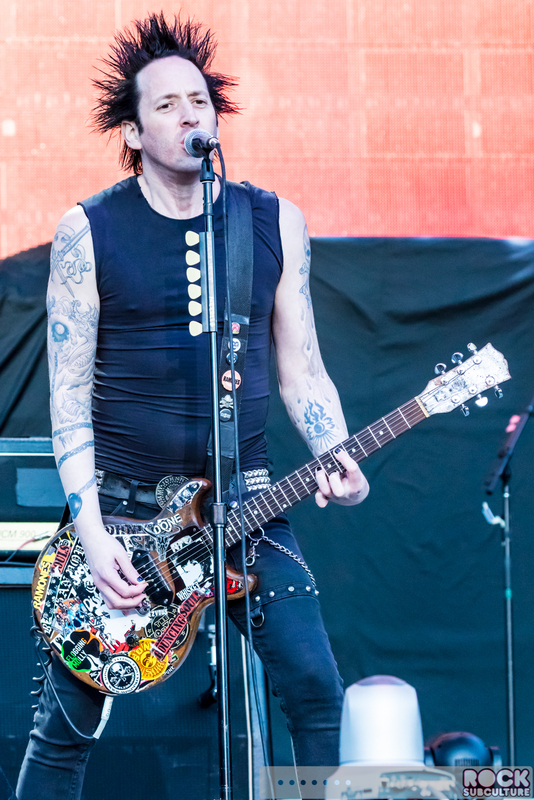 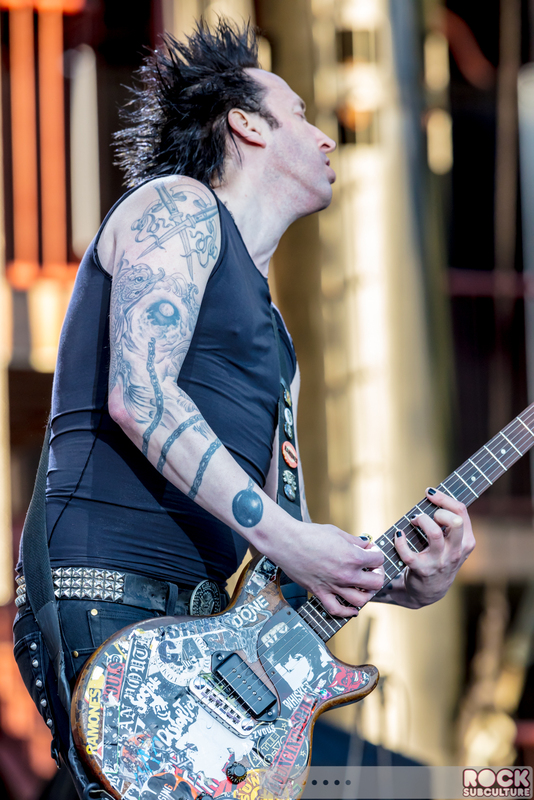 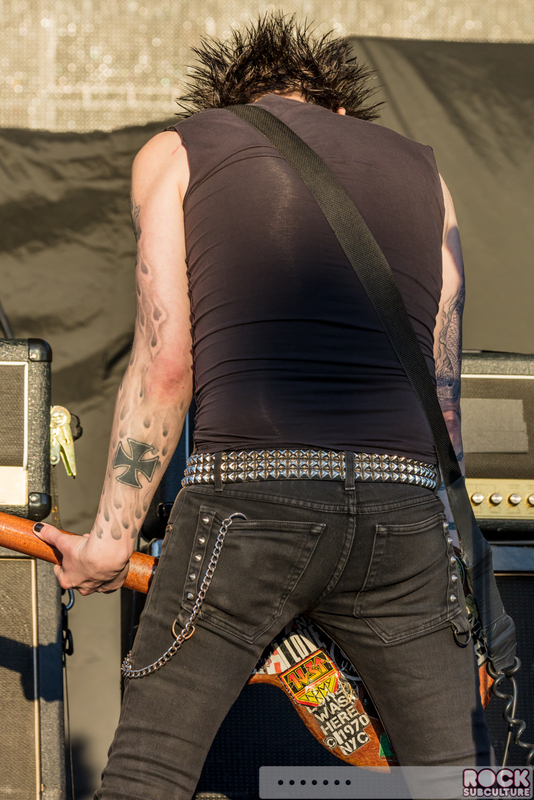 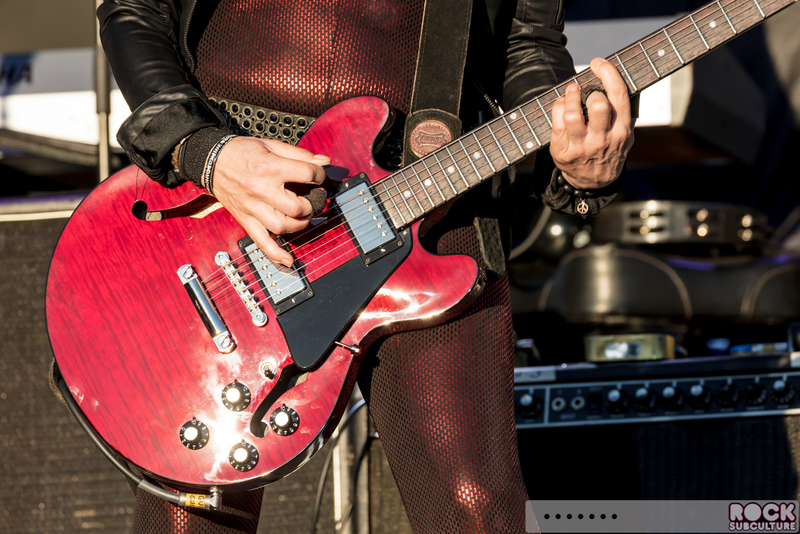 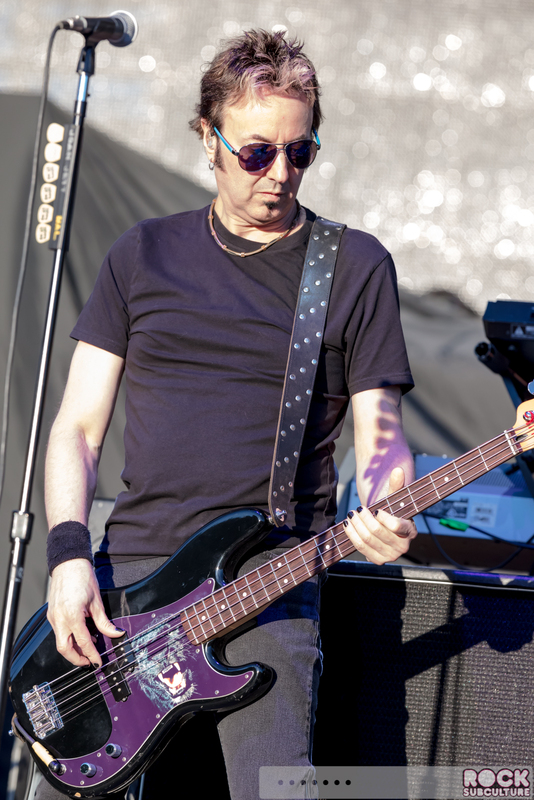 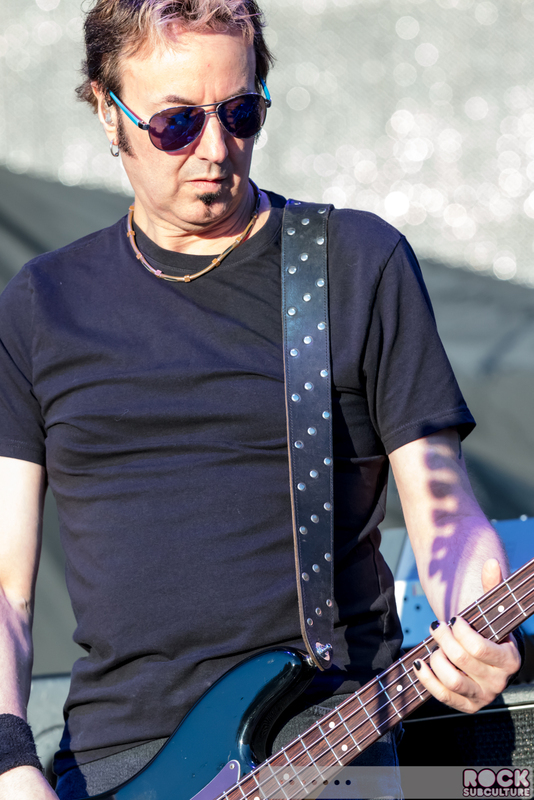 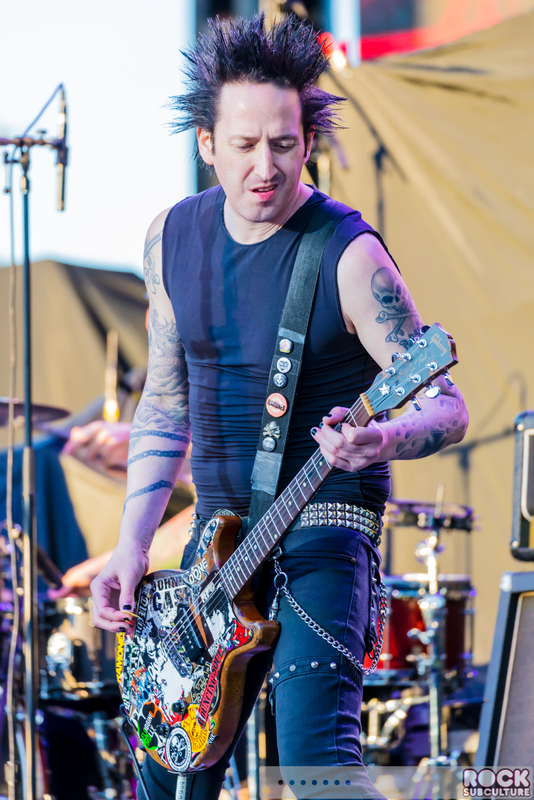 Dougie Needles on lead guitar is the one who seems born to play with Jett, sharing duties and guitar and displaying that intuition and chemistry between the two that brings all those wonderful riffs to life. 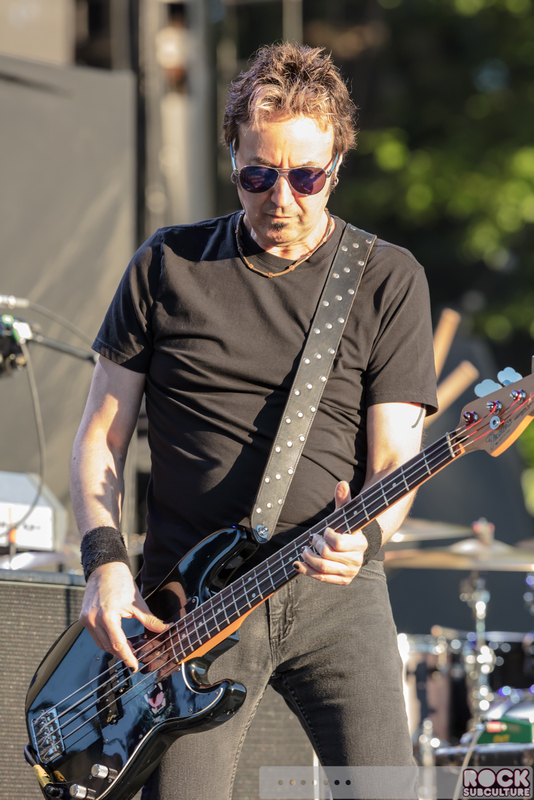 With this punk-style of music, bass is key in this band and Hal B. Seltzer kept everything grounded and pounding throughout the set. 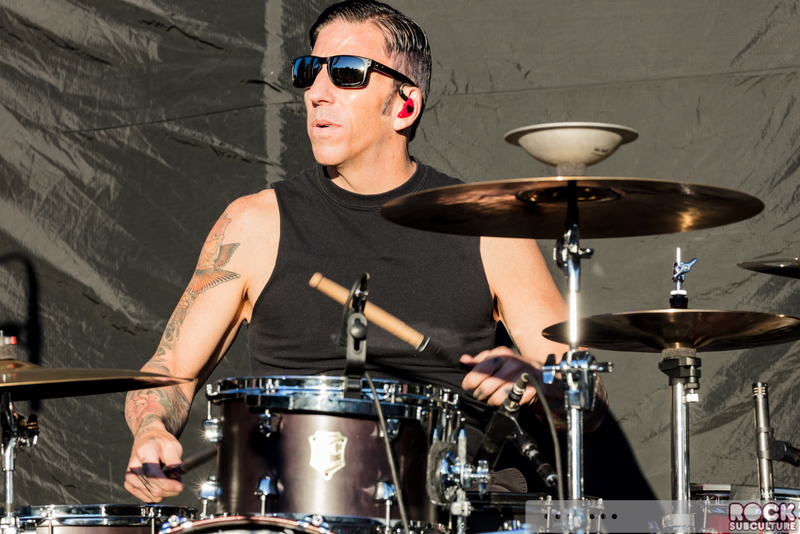 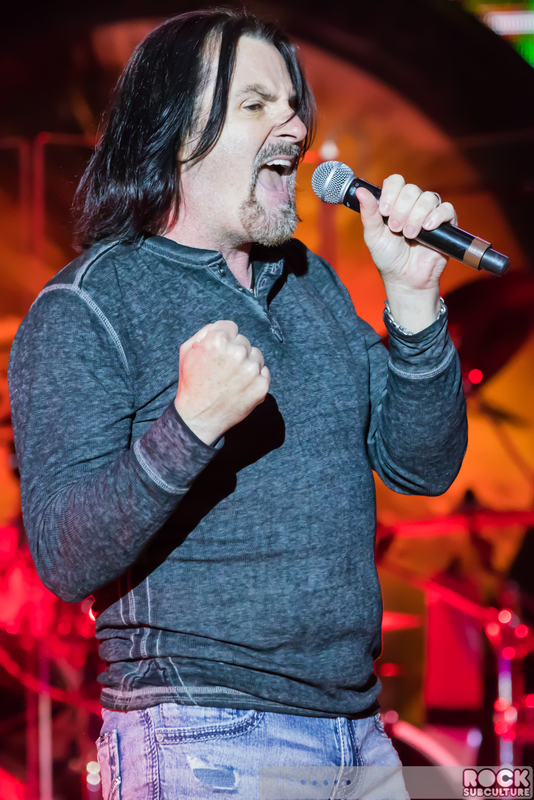 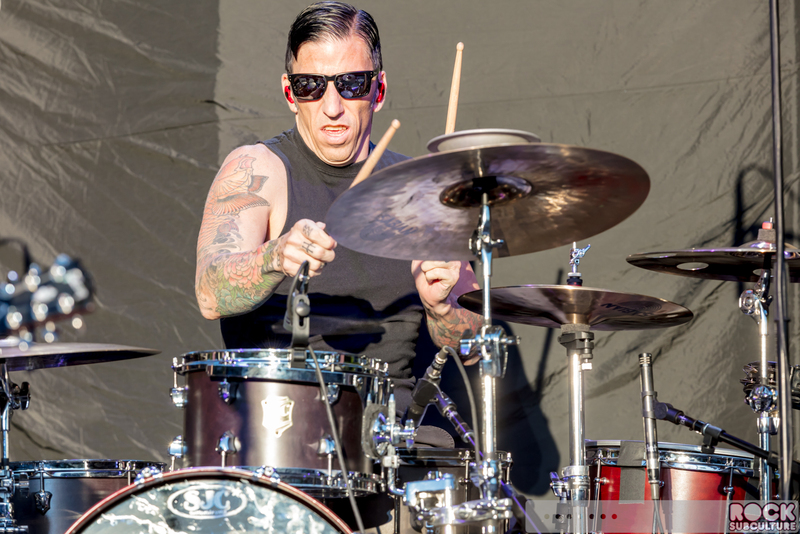 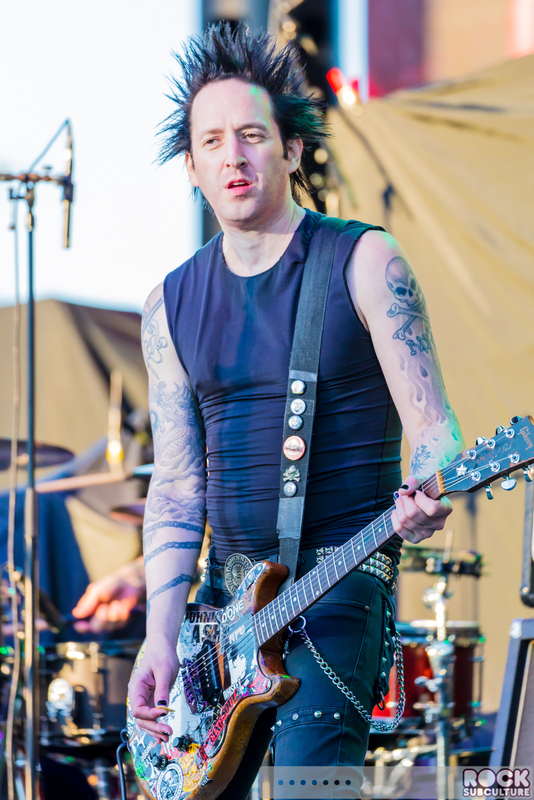 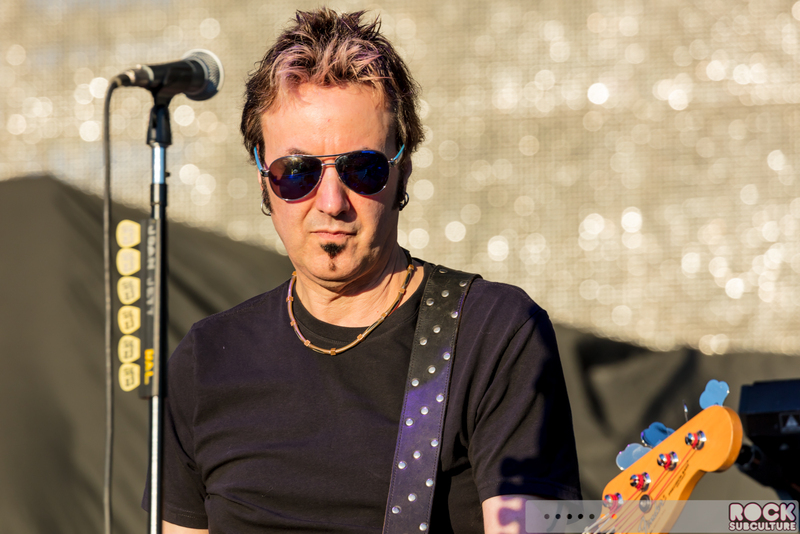 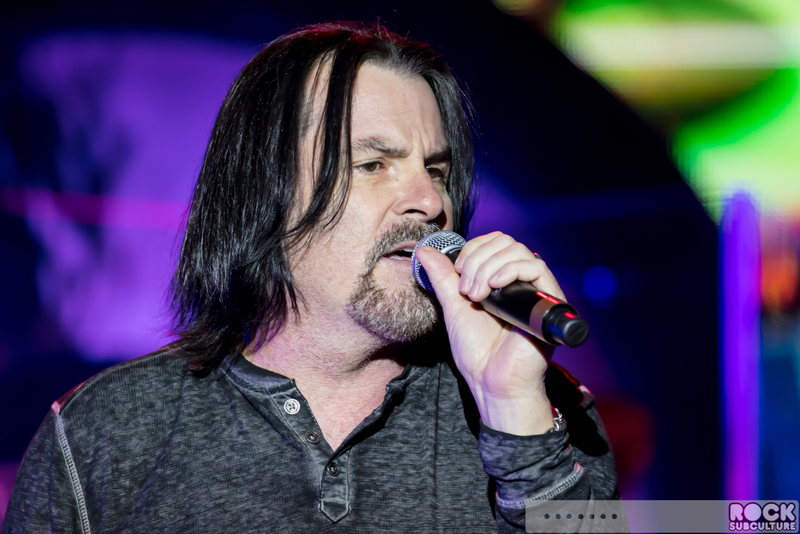 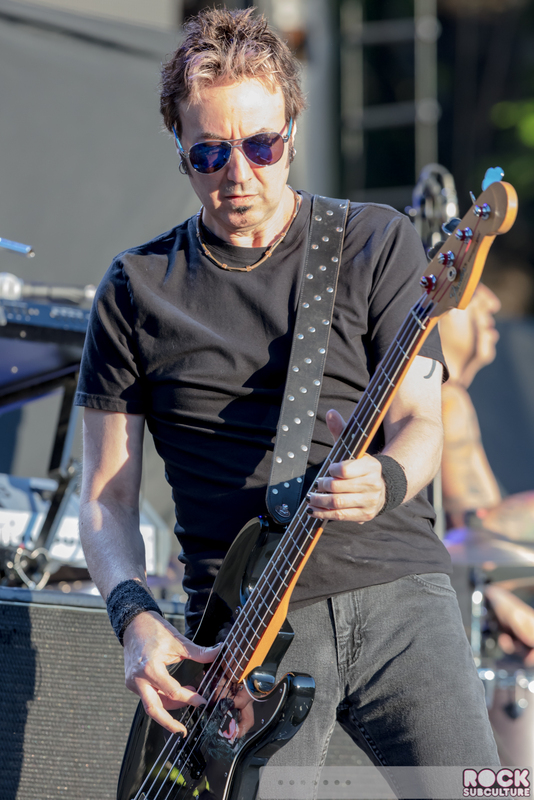 Kenny Laguna of course has a long history in the music business (he even played on the original (non-Billy Idol) version of “Mony Mony” with Tommy James and the Shondells, and he has a long history and association with Joan Jett going back to 1979 after The Runaways broke up. 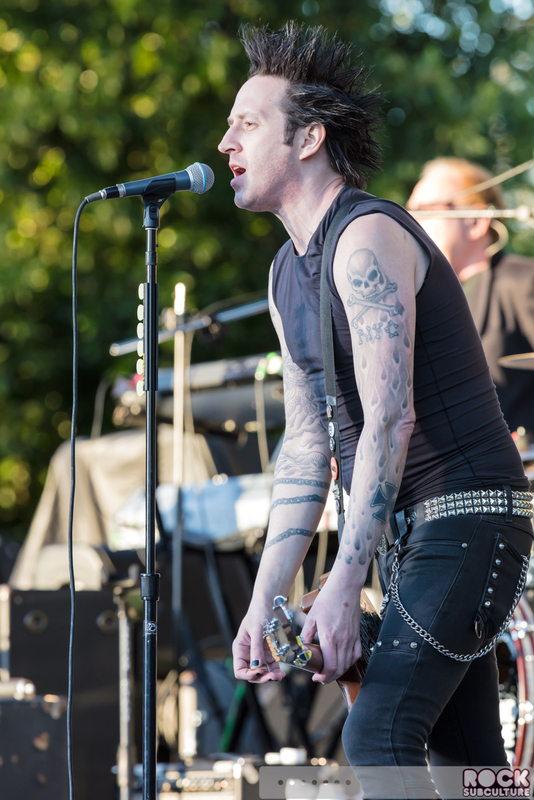 He co-produced a lot of Joan Jett’s early solo material (including Bad Reputation and I Love Rock ‘n’ Roll. 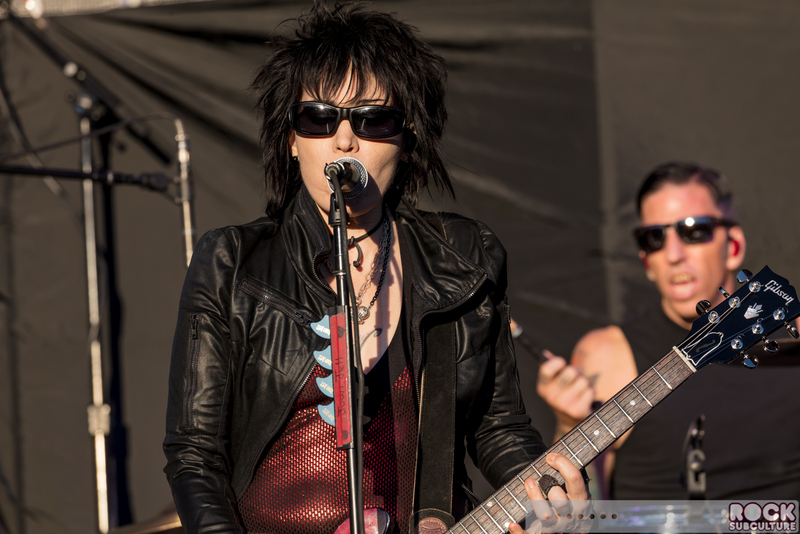 He, like Joan Jett, was an executive producer on The Runaways film. 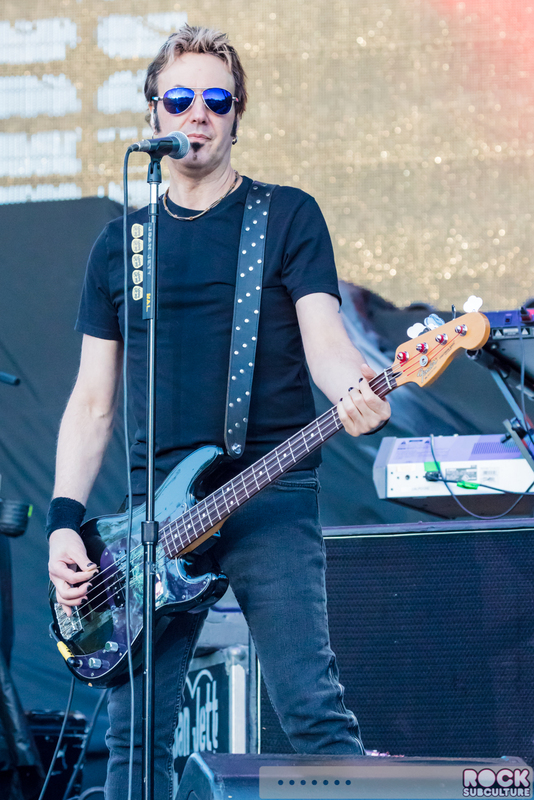 As always, he adds a lot of character to their live shows. 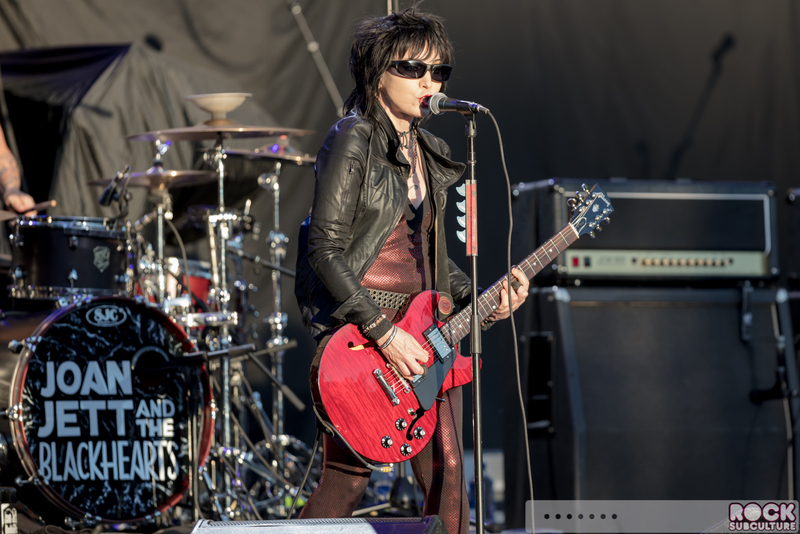 So while Joan Jett is the star, The Blackhearts are an amazing accompaniment to bring all that music to life in an authentic and compelling fashion. 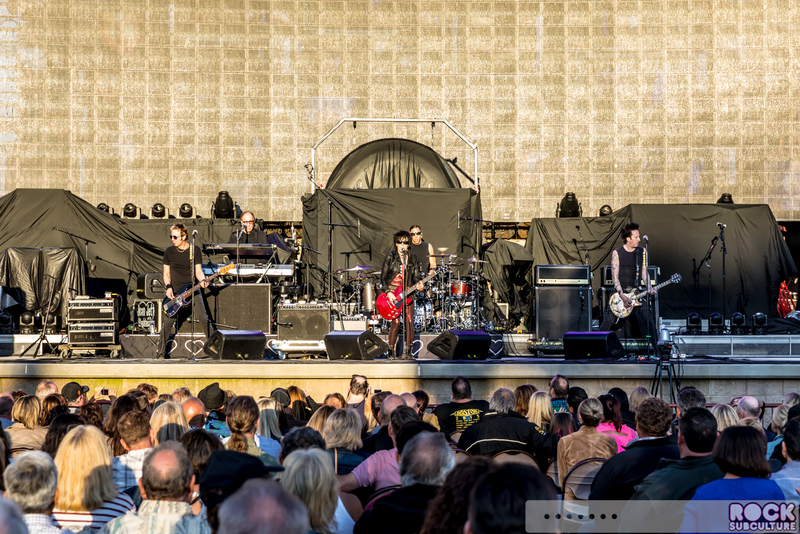 I really love their shows as they are one of those bands that you can see today and feel as though you are getting the authentic experience that’s been consistent yet fine tuned over the years. 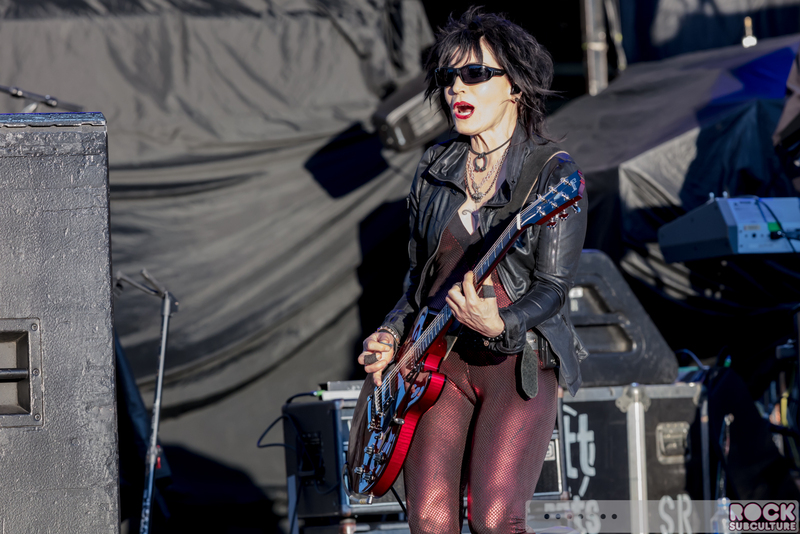 Jett’s vocals sound better than ever, both a reflection of her gifts vocally as well as the style of the original music and her ability to deliver it in the way only she can. 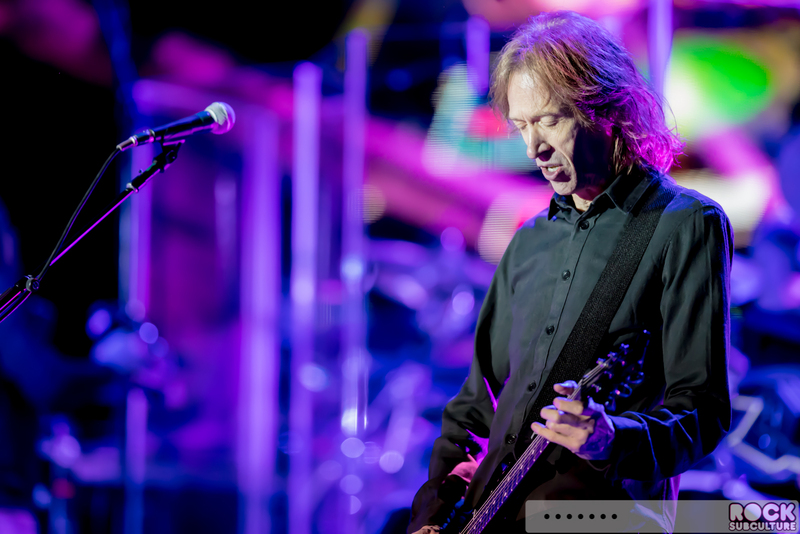 Many in the crowd turned out just for this half of the concert, and they were up on their feet singing along much of the time, especially as it built up to songs like “I Love Rock ‘n’ Roll”, “Crimson & Clover” (my favorite), and “I Hate Myself for Loving You”. 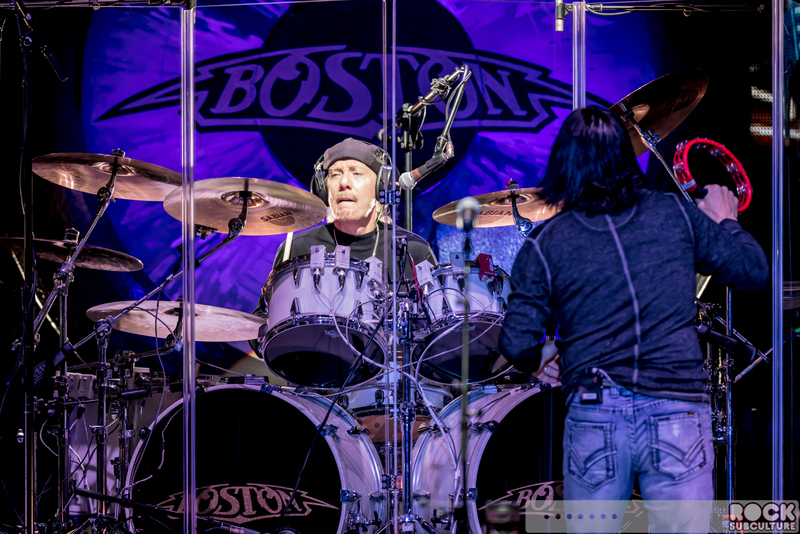 I have to confess that I was not a big follower of Boston leading into the show – being familiar mostly with their hits. 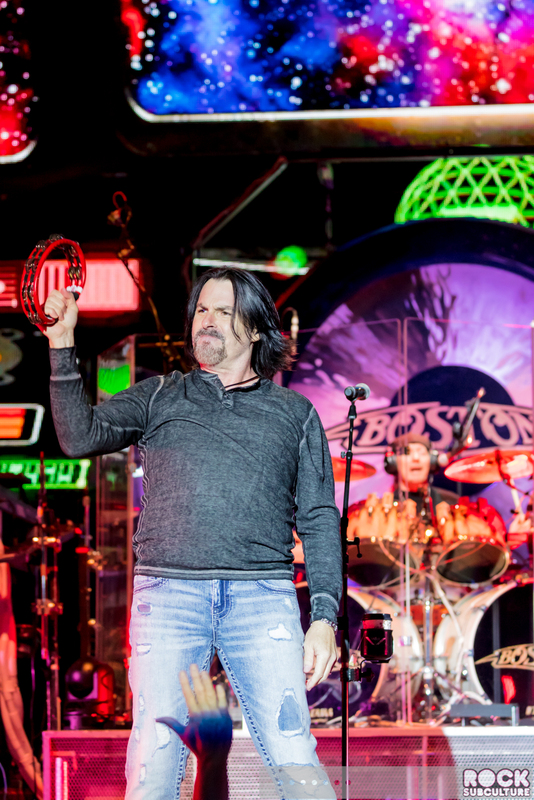 Formed in, of course, Boston in 1976, by the time I was more focused on music growing up I missed their origins and was more drawn to the New Wave style music going into the 80s, as opposed to hard rock, which is a genre I’ve never personally gravitated towards… but having said all that, I was really interested to check them out, and came away impressed. 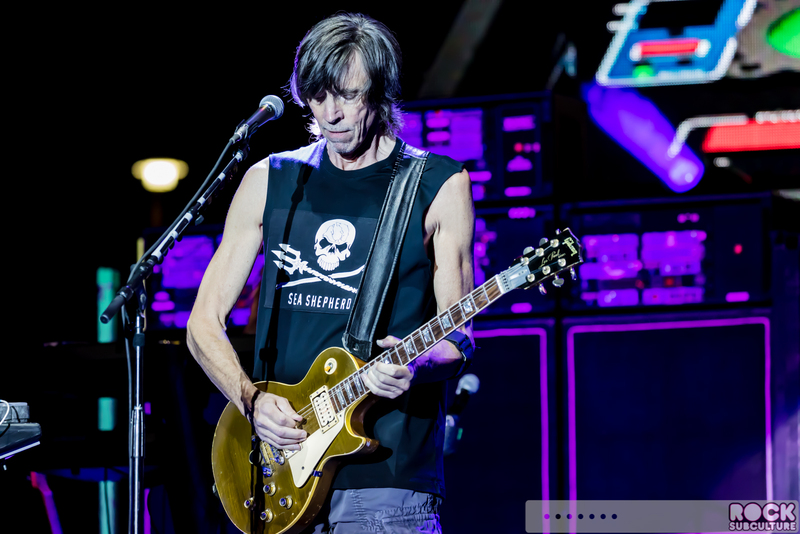 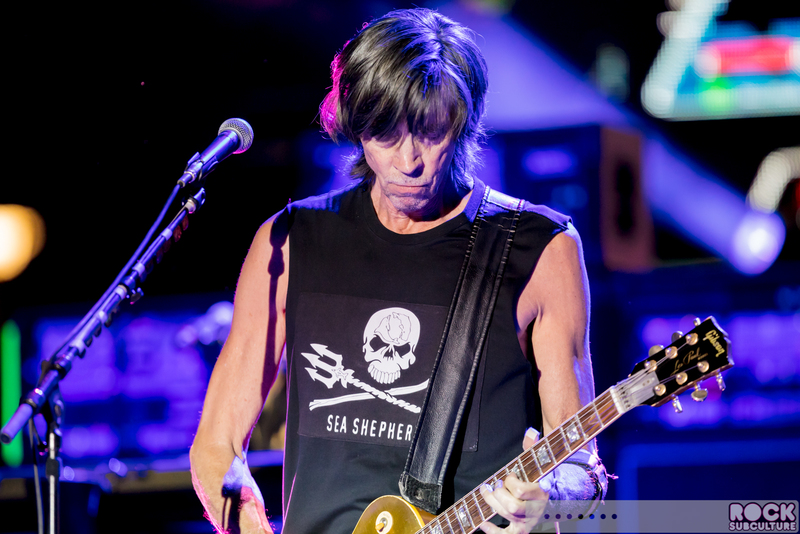 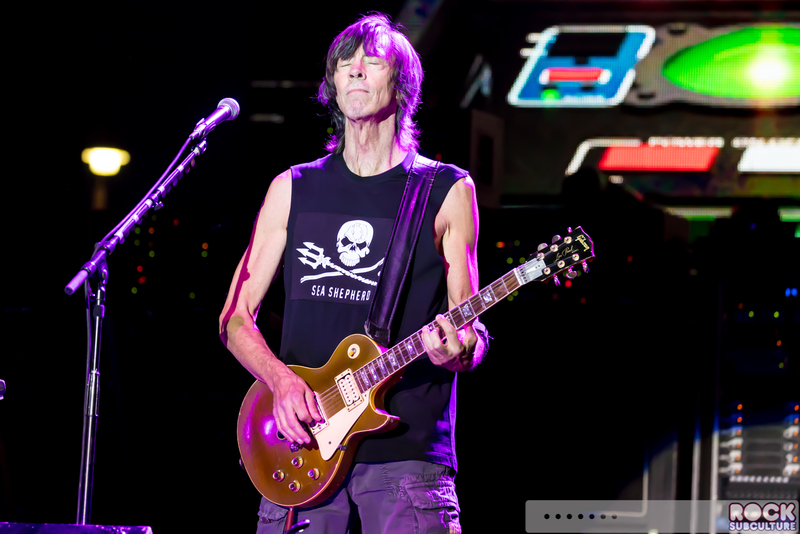 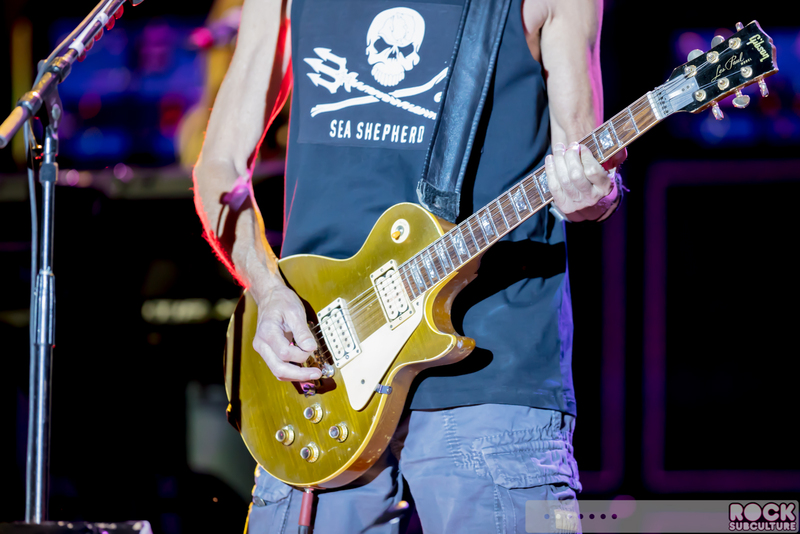 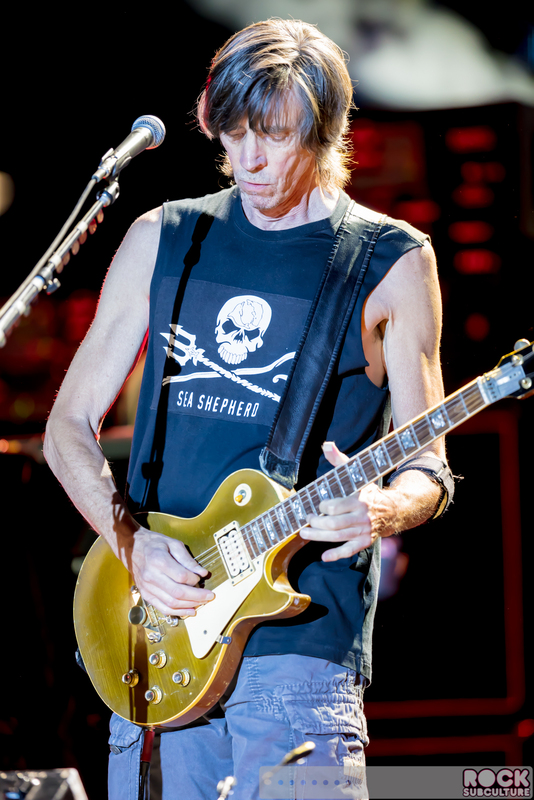 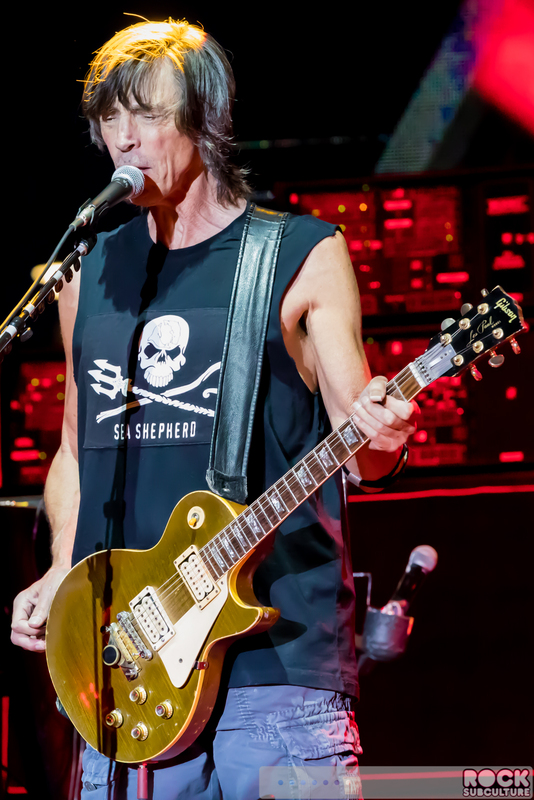 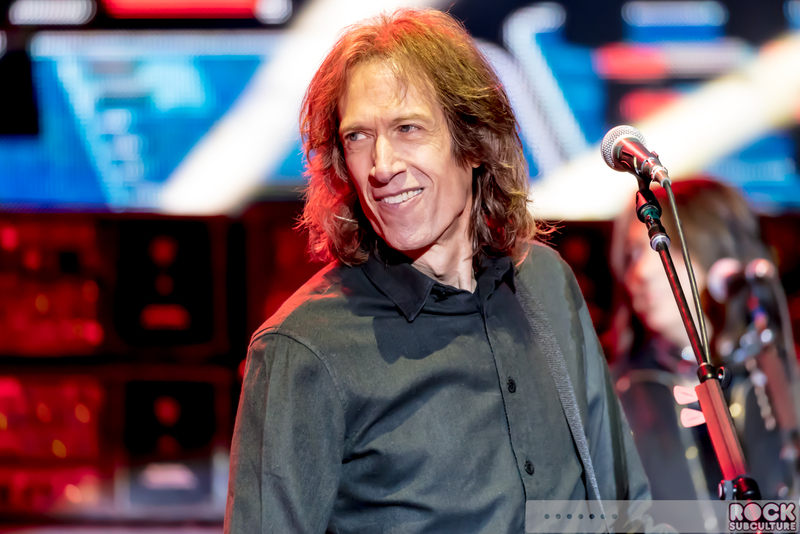 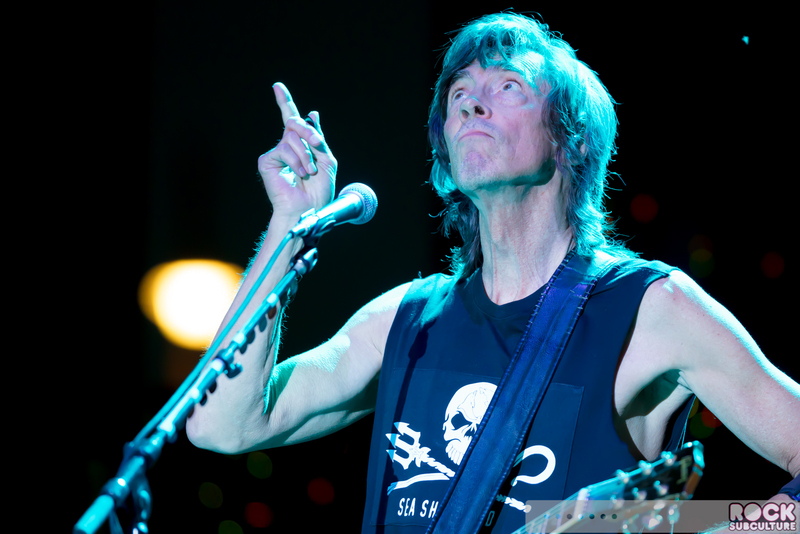 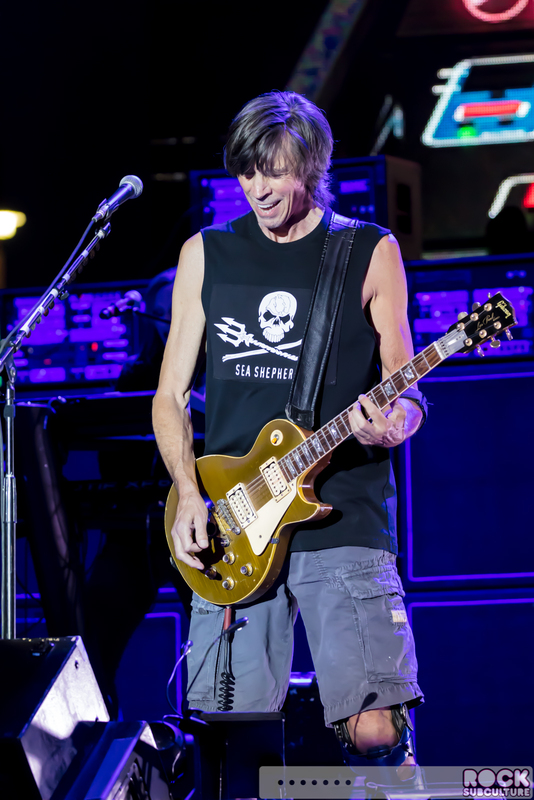 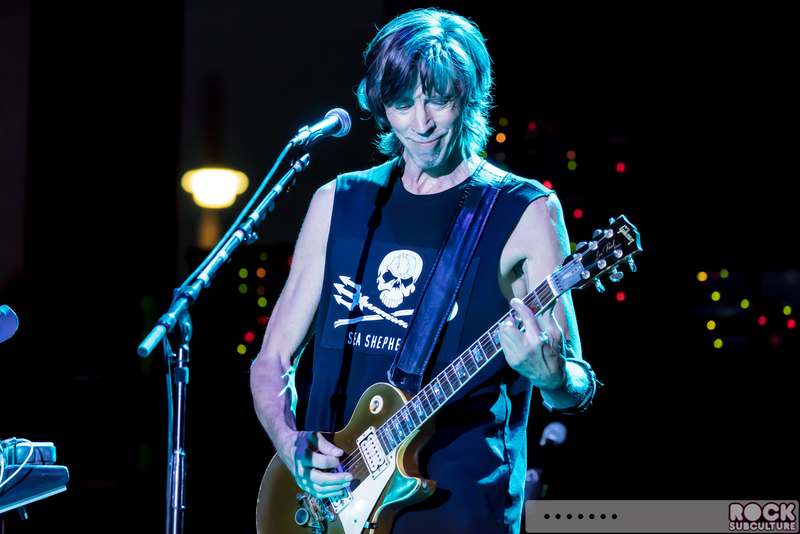 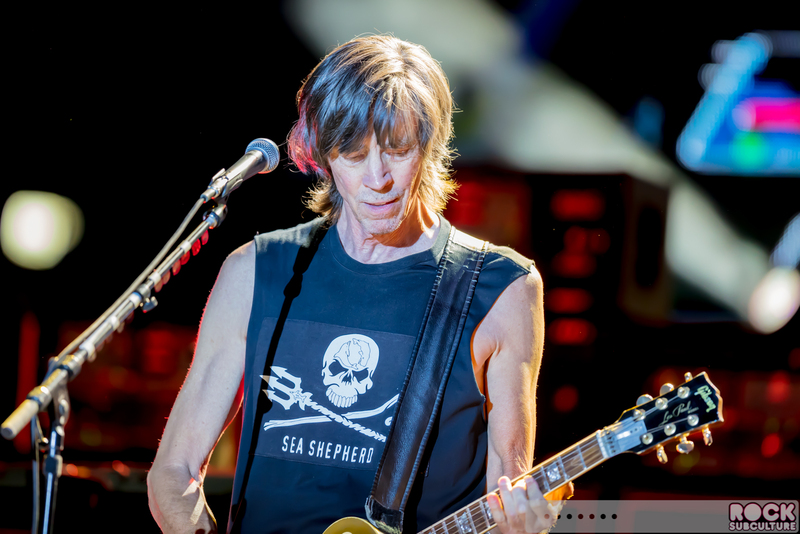 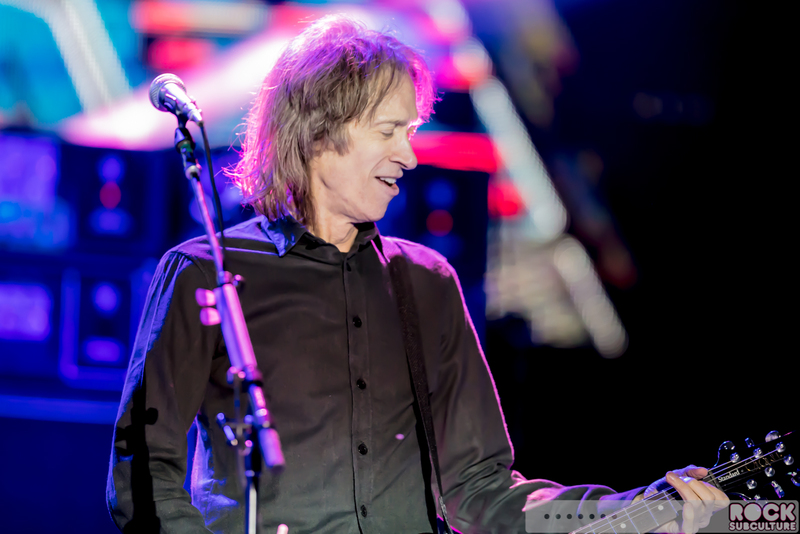 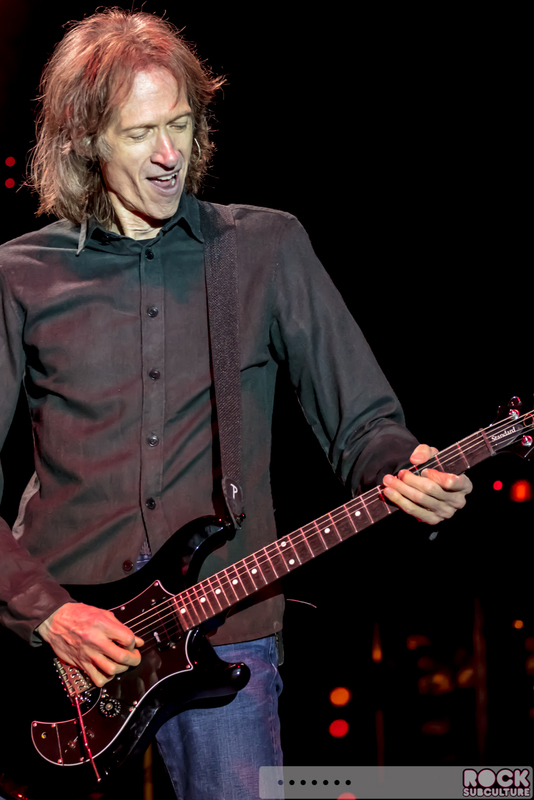 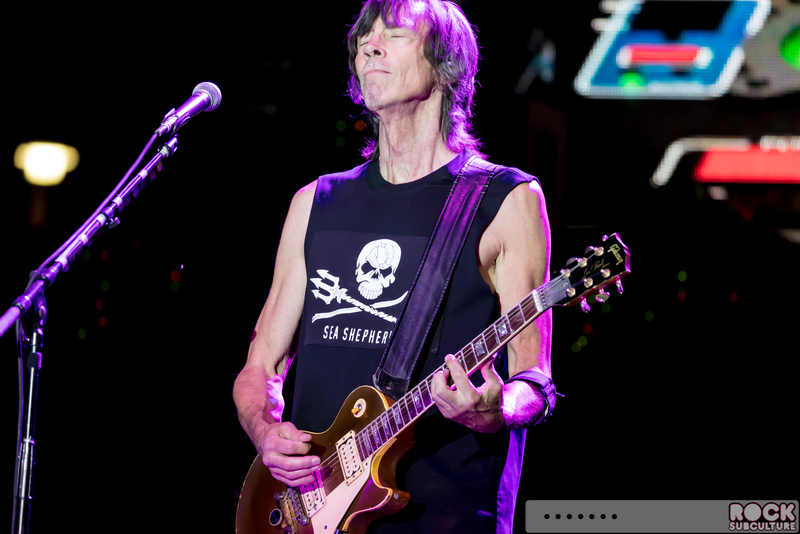 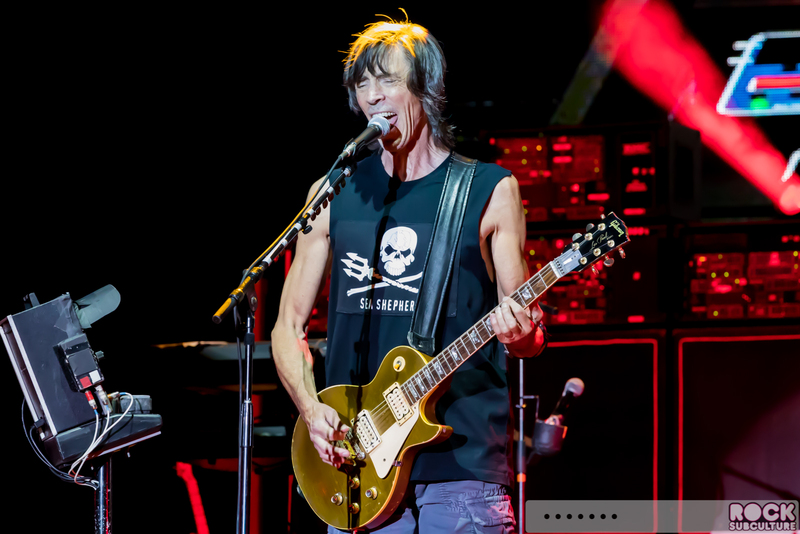 At the center of the band back in the beginning as well as today is guitarist, keyboardist, producer and songwriter Tom Scholz, who founded the band. 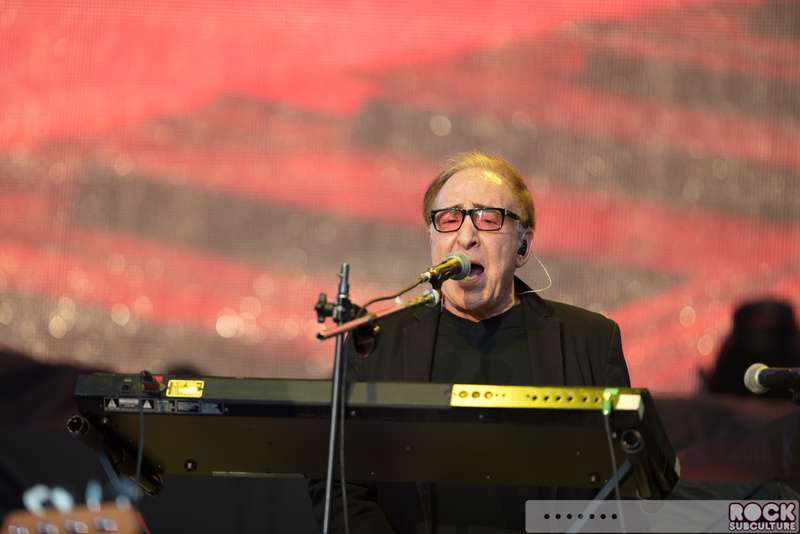 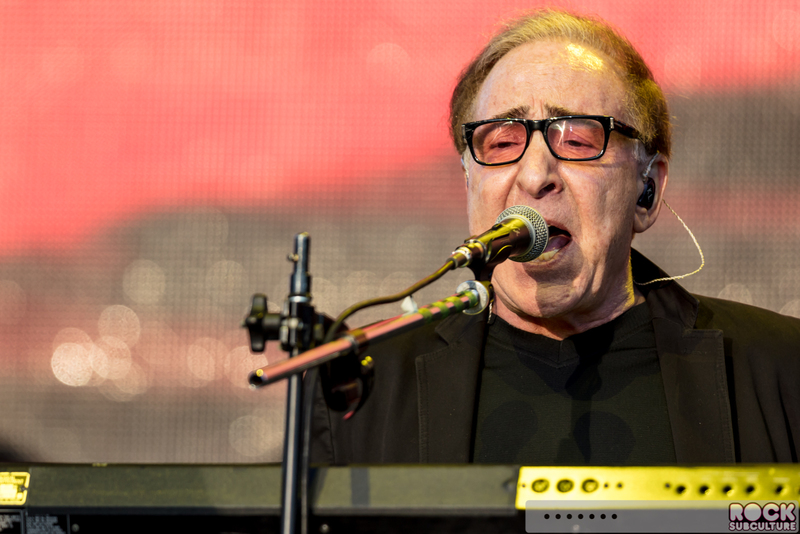 Scholz was attending MIT and started writing music back in the late 60s. 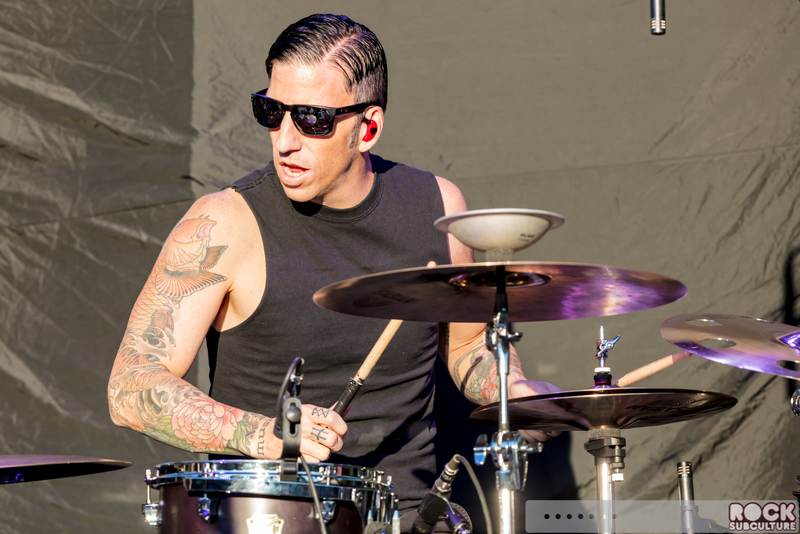 While in school he joined a band called Freehold and met future Boston members. 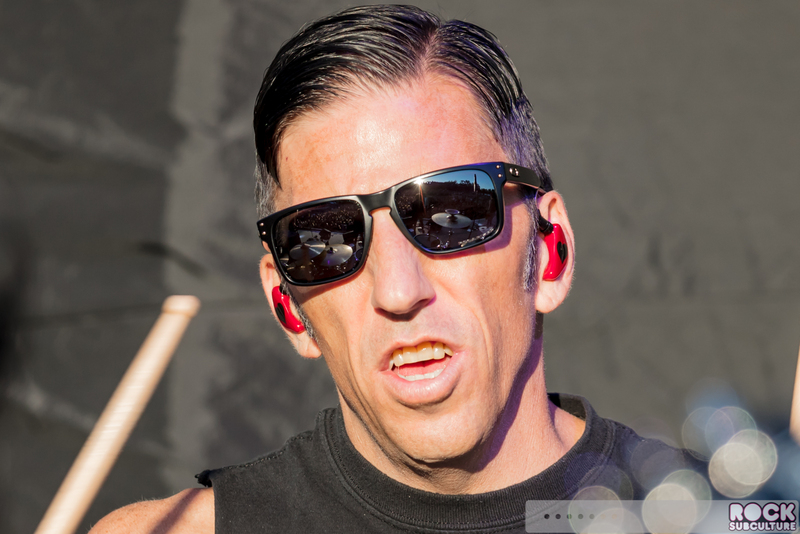 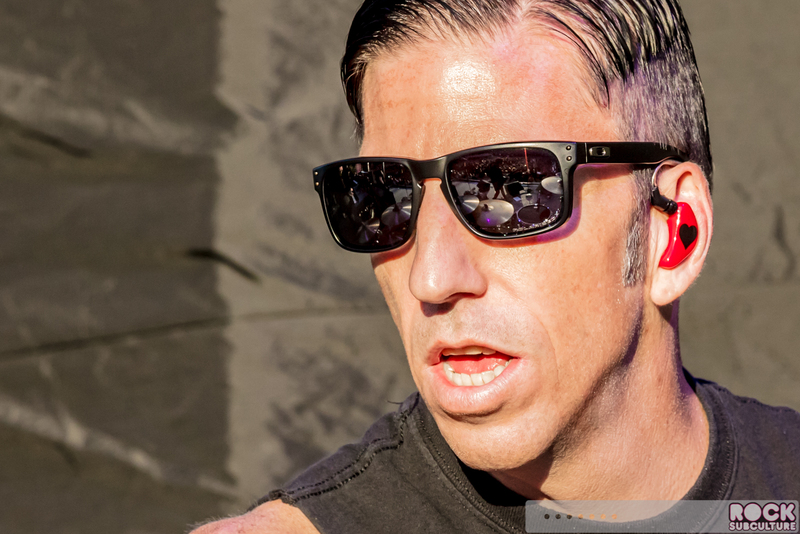 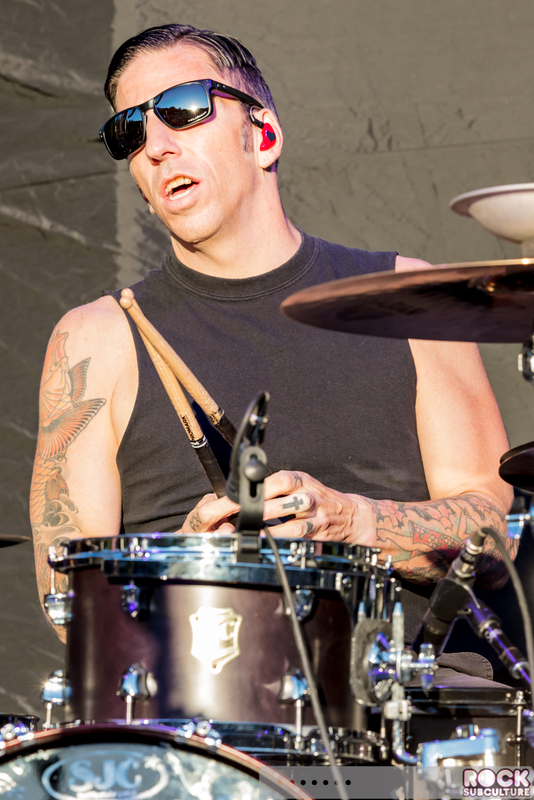 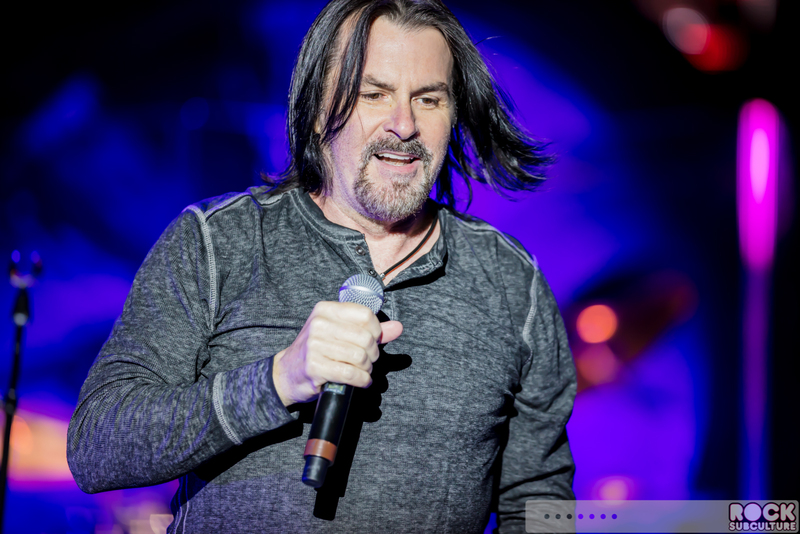 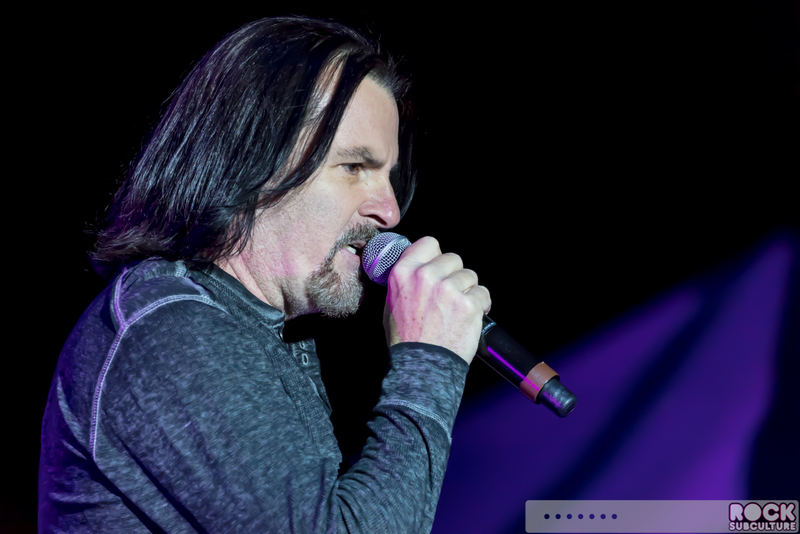 Scholz remains the lone founding member of the band still active today. 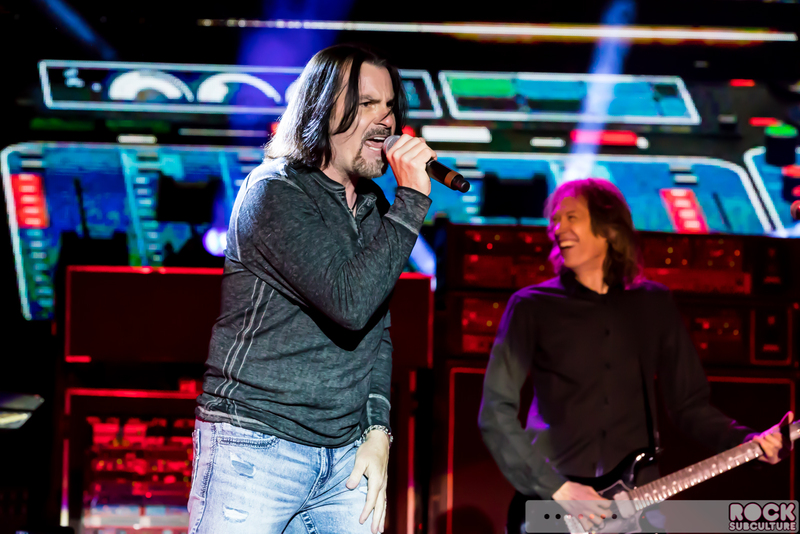 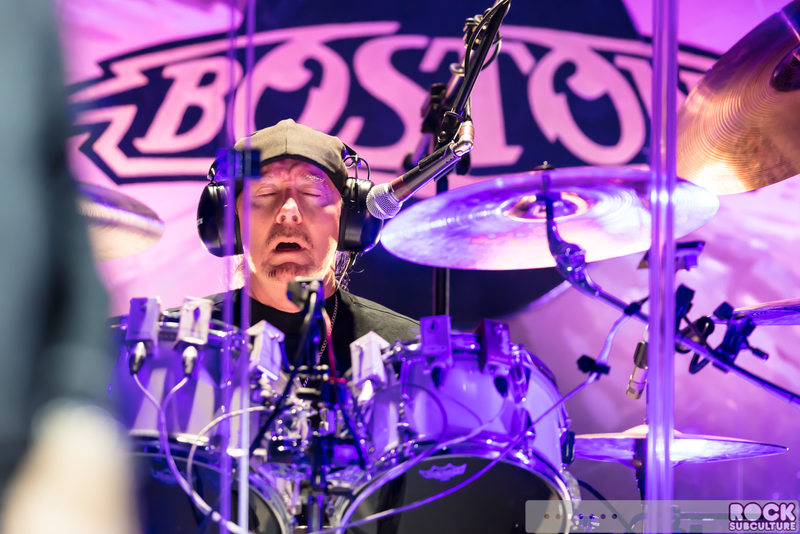 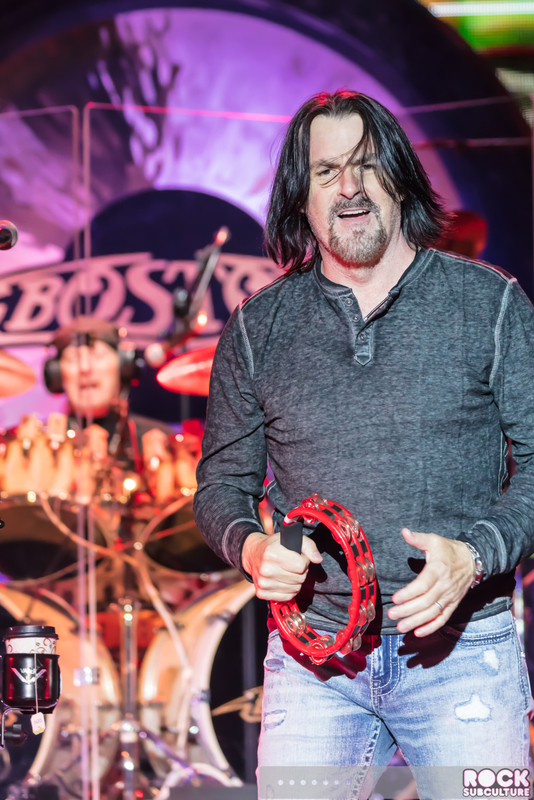 Boston has become one of those legendary bands that have had a great number of accomplished artists come and go, and they’ve sold over 75 million records and released just six studio albums over four decades (their most recent Life, Love & Hope, was released in 2013). 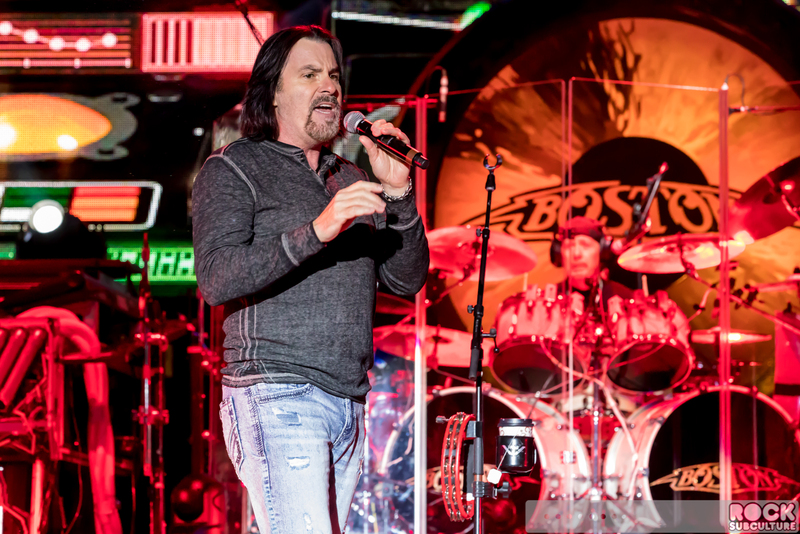 Their self-titled debut remains one of the best selling albums of all time in the U.S.
With the passing of the original singer in 2007, the band ultimately found a new singer in Boston fan Tommy DeCarlo who they found via cover performances published on MySpace. 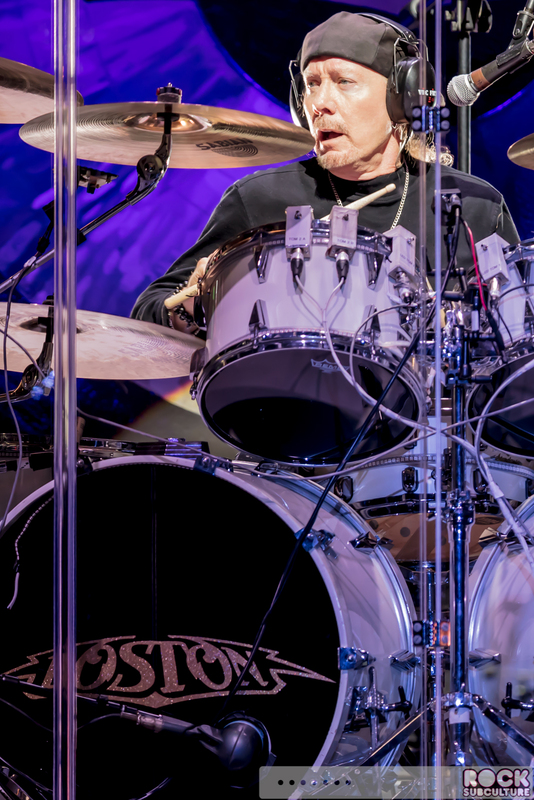 Tragically, earlier this year drummer Sib Hashian collapsed and died during a concert performance – he had been with the band since before the release of their debut album. 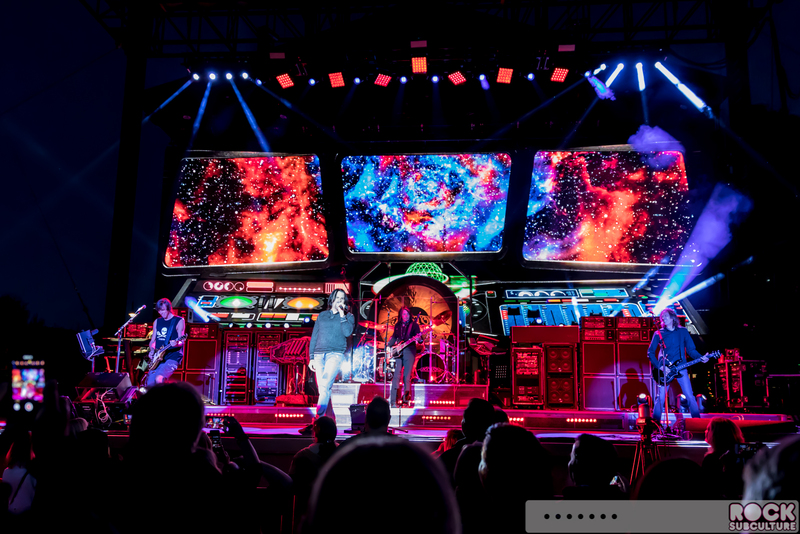 The line-up for their current “Hyper Space Tour” is strong, with each member having plenty of opportunities to showcase their talents throughout the sprawling setlist of songs. 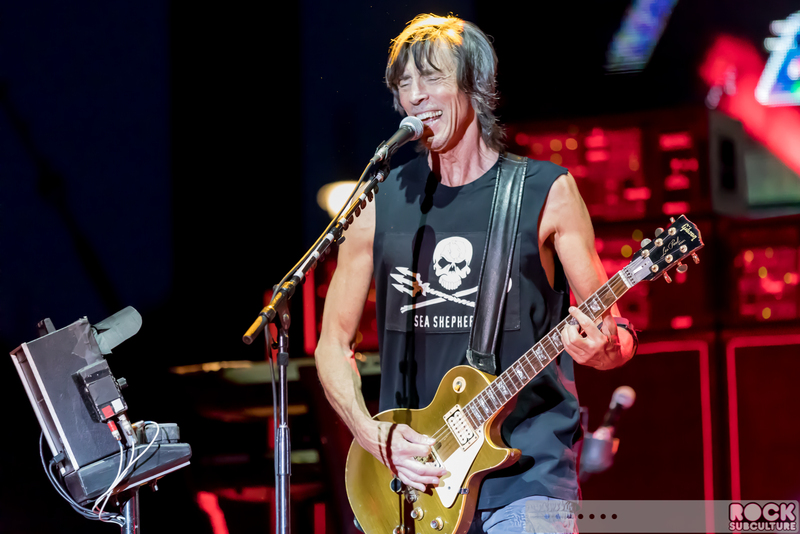 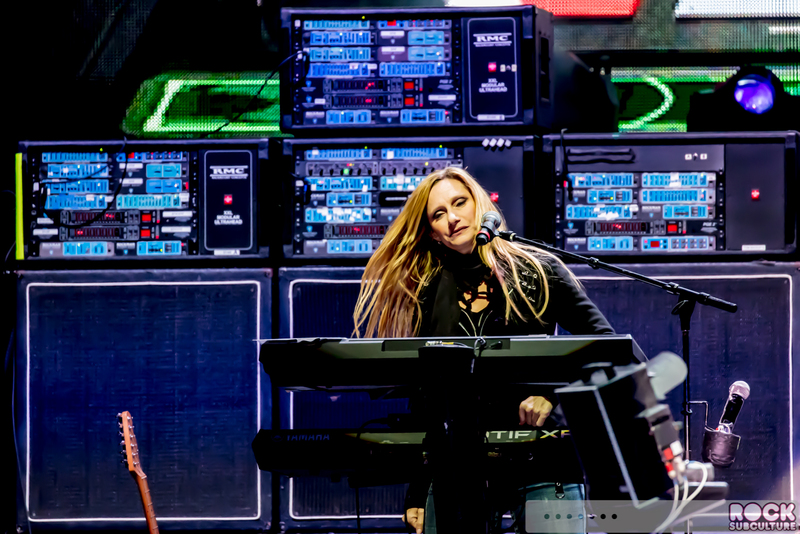 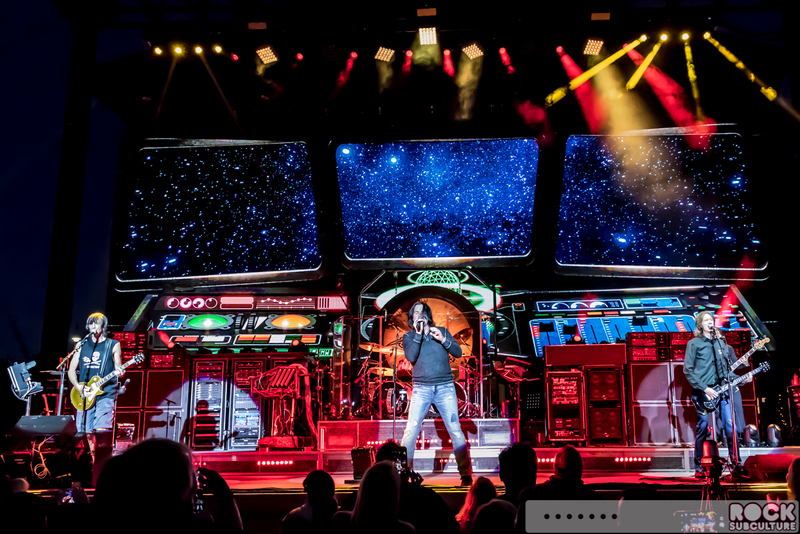 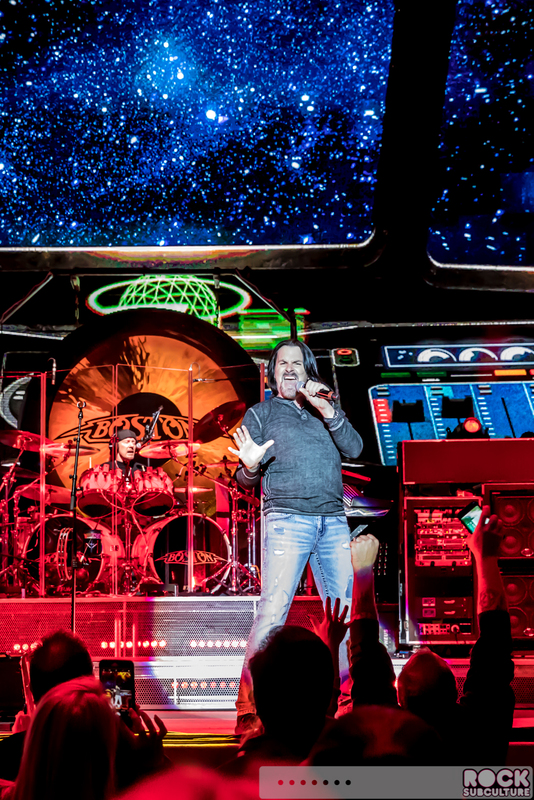 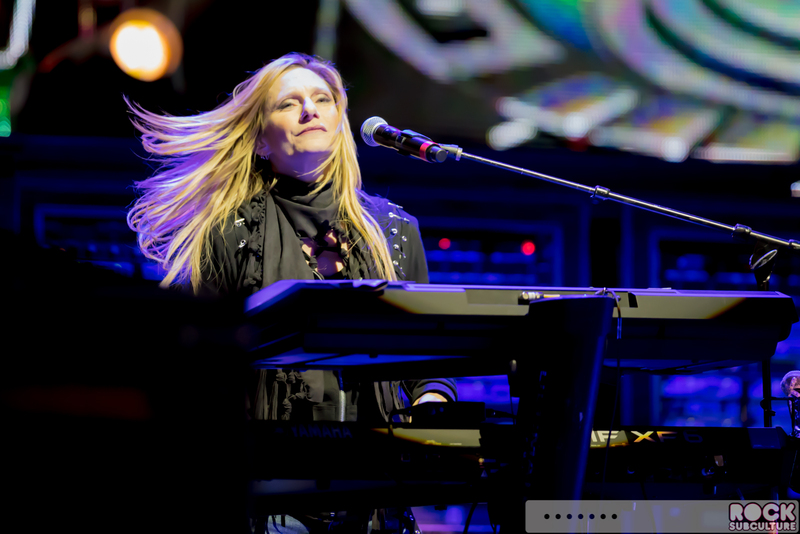 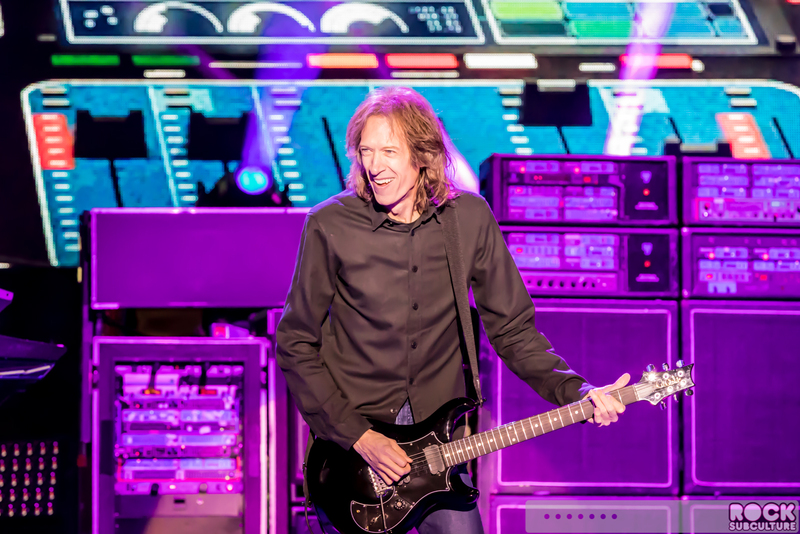 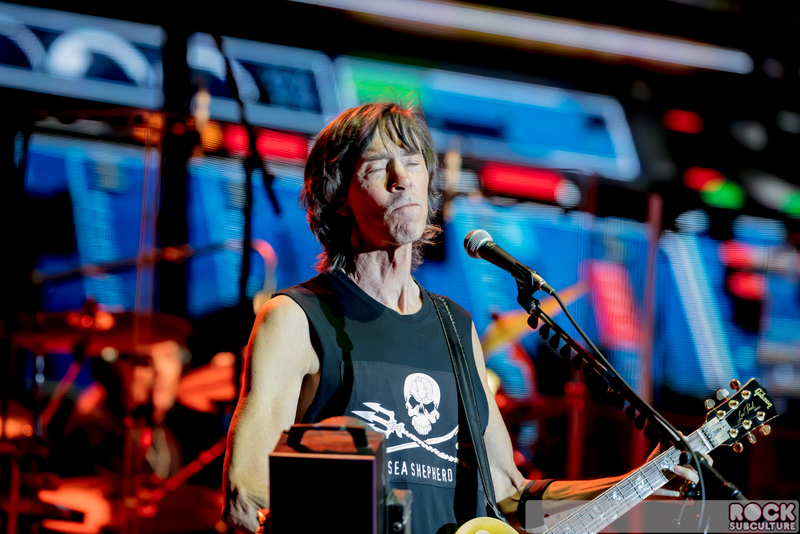 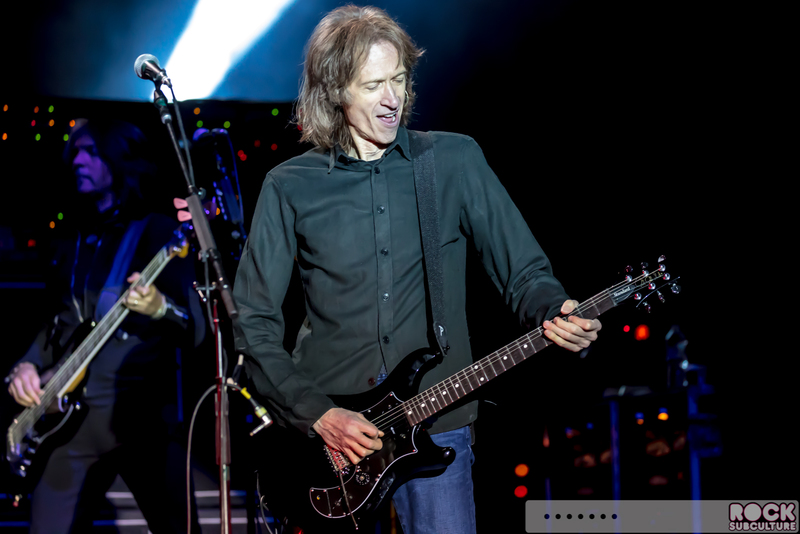 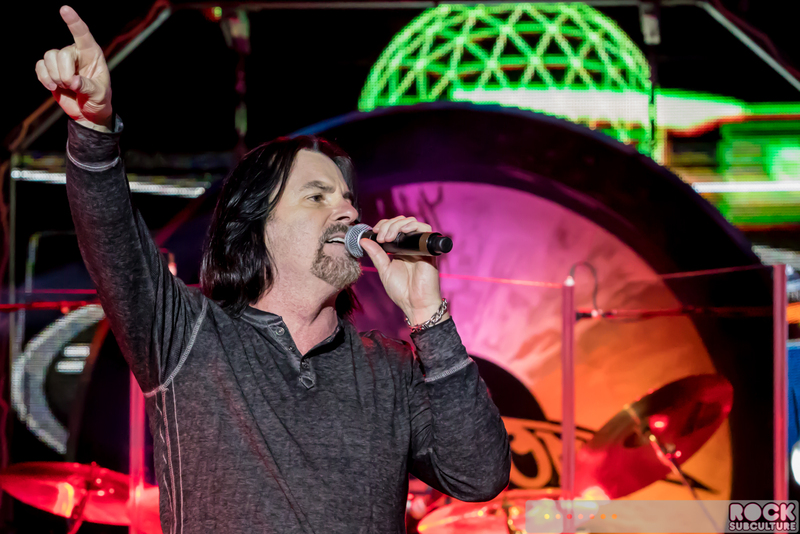 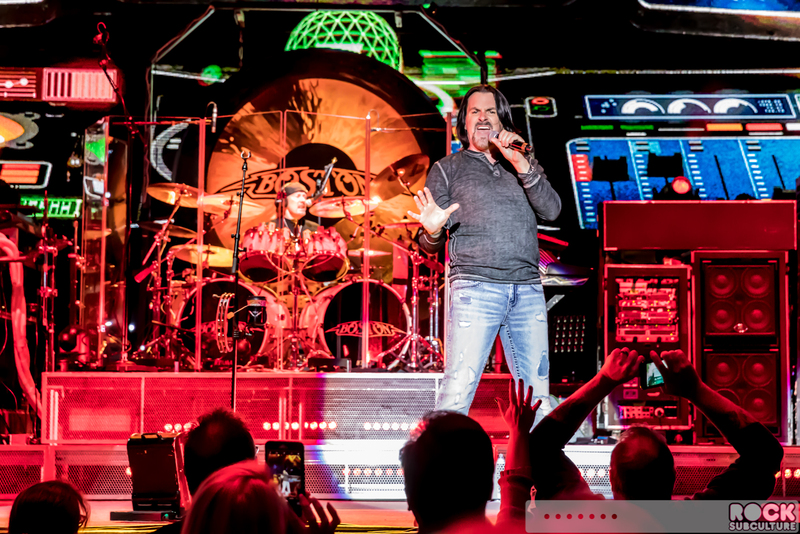 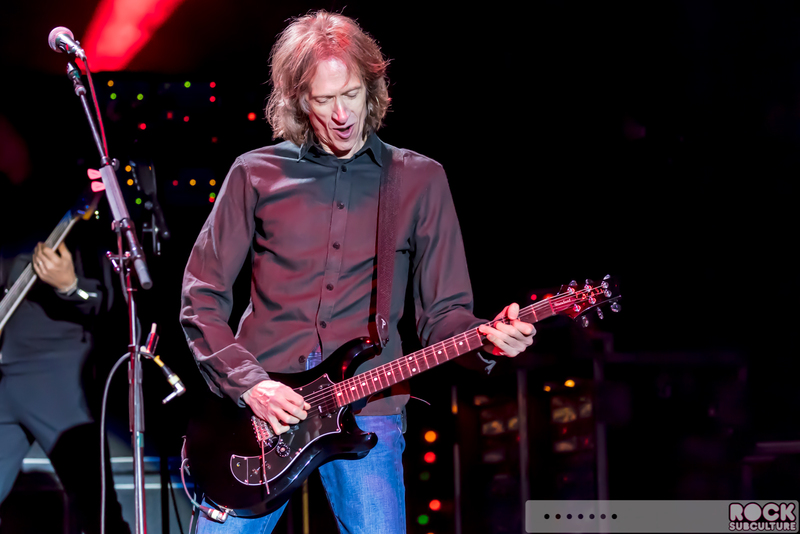 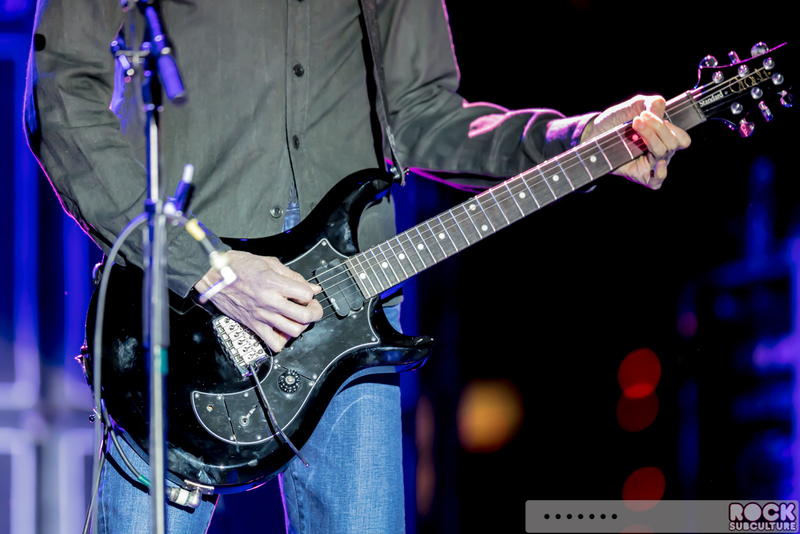 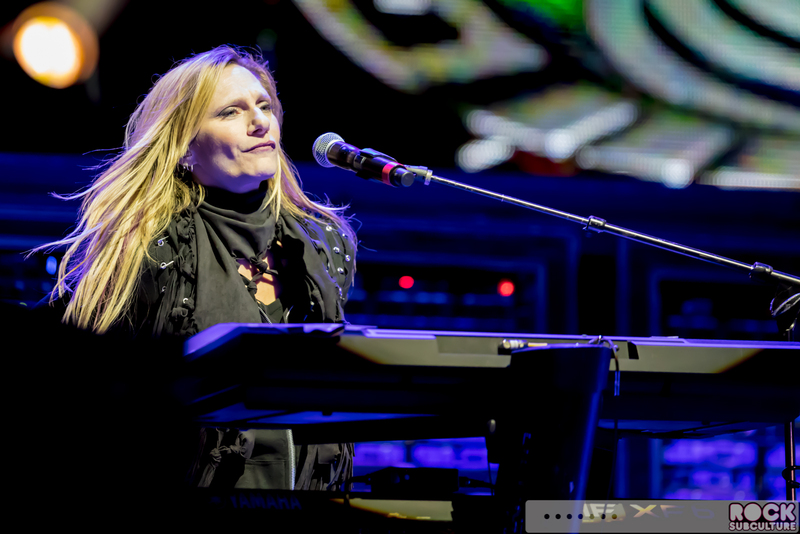 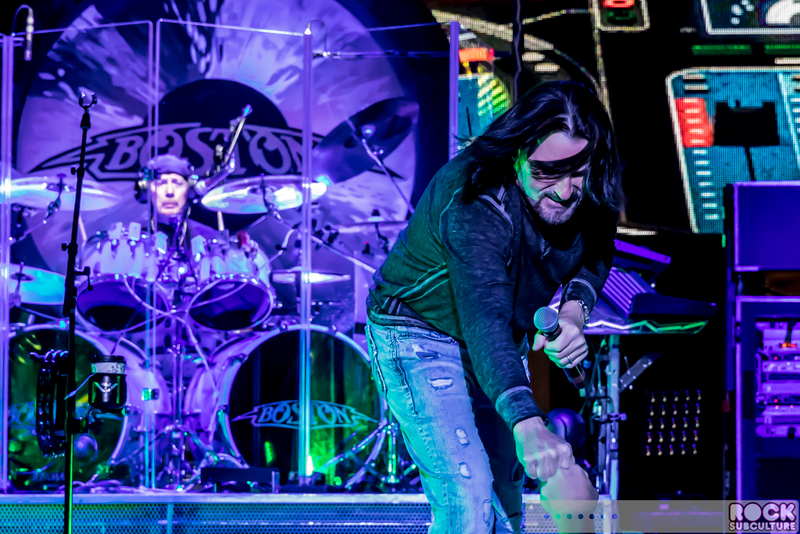 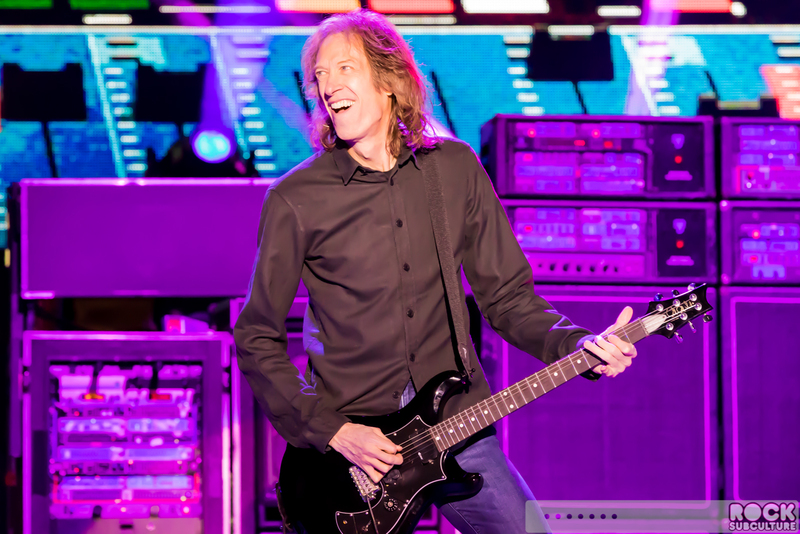 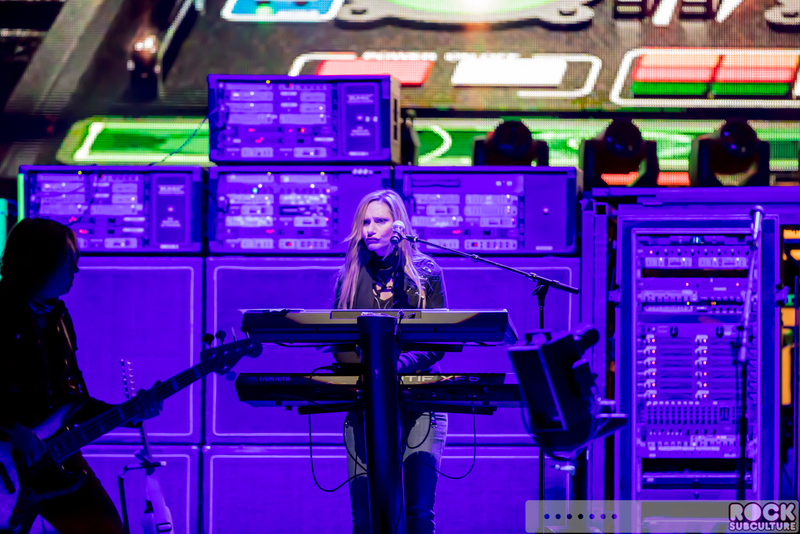 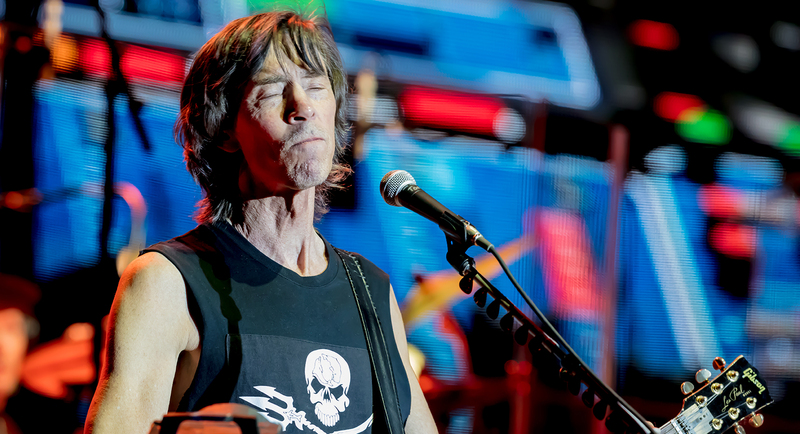 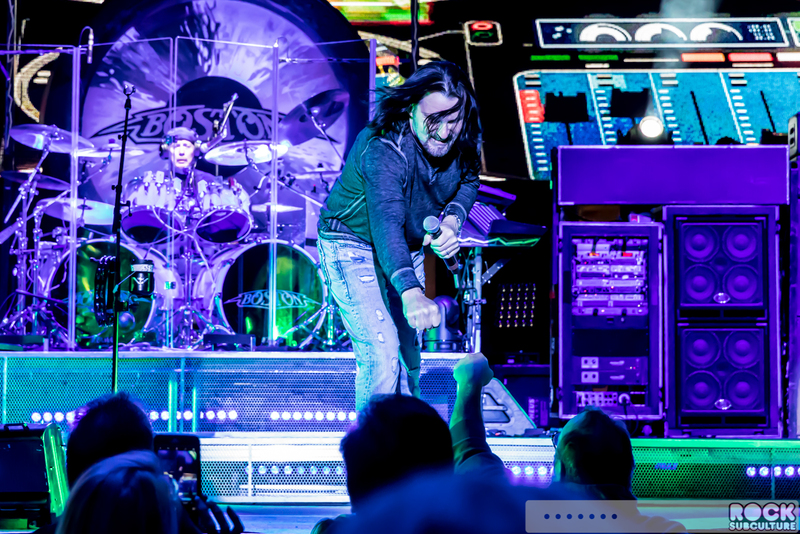 Though placed stage right, founder Tom Scholz was at the center of it all throughout the night, not only doing incredible work on his guitar but keyboards as well. 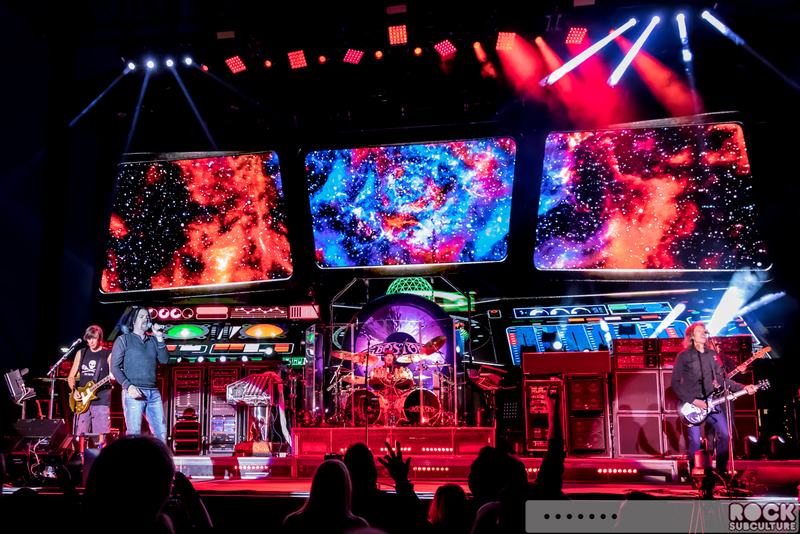 Set against their iconic “spaceship” motif, it was interesting when stepping back and thinking about Boston being from Boston, MA and now playing before thousands in rural wine country in a part of California that to them would feel like the middle of nowhere. 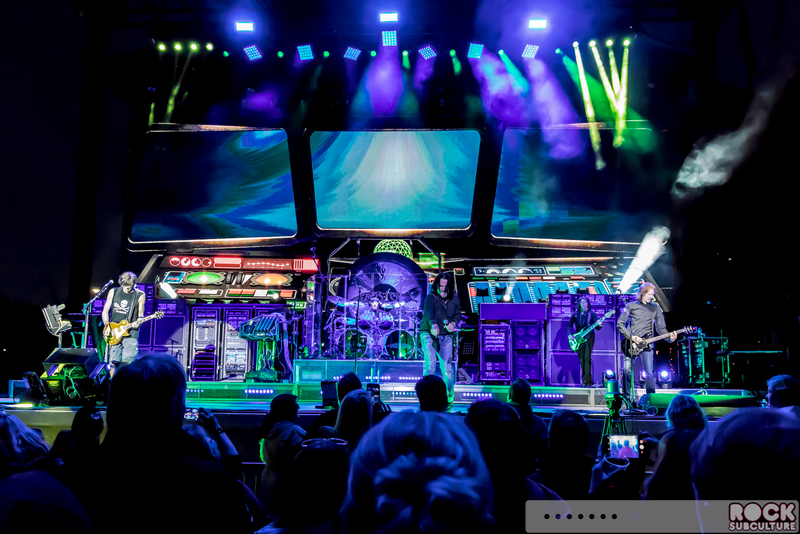 Boston is definitely a band that knows how to play to the front row and the distance seating all at once, not only with the visual explosion of color but with their music as well, both instrumentals and vocal driven tracks. 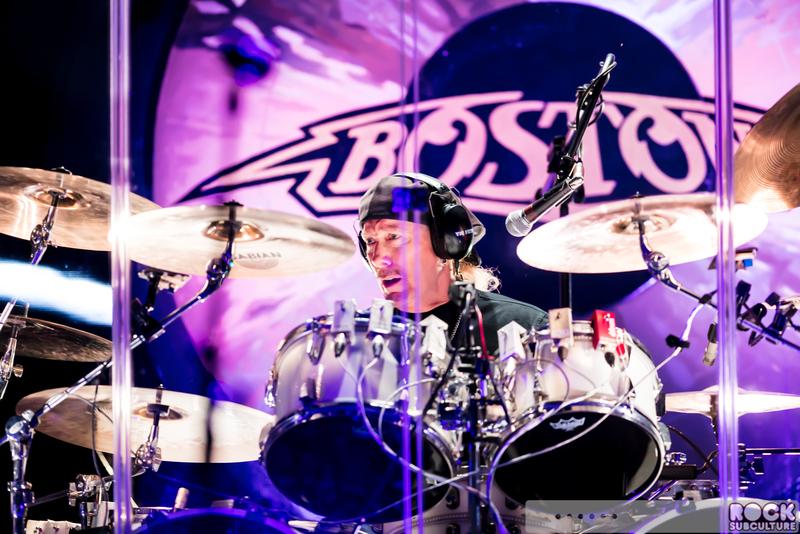 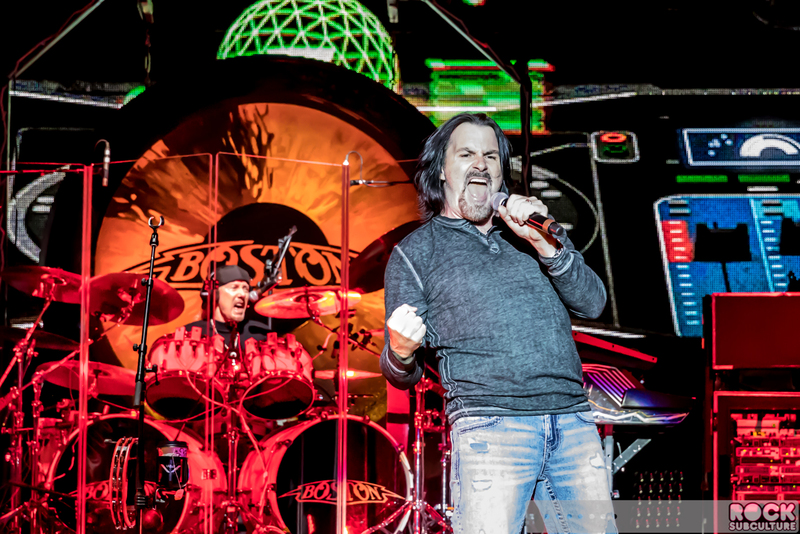 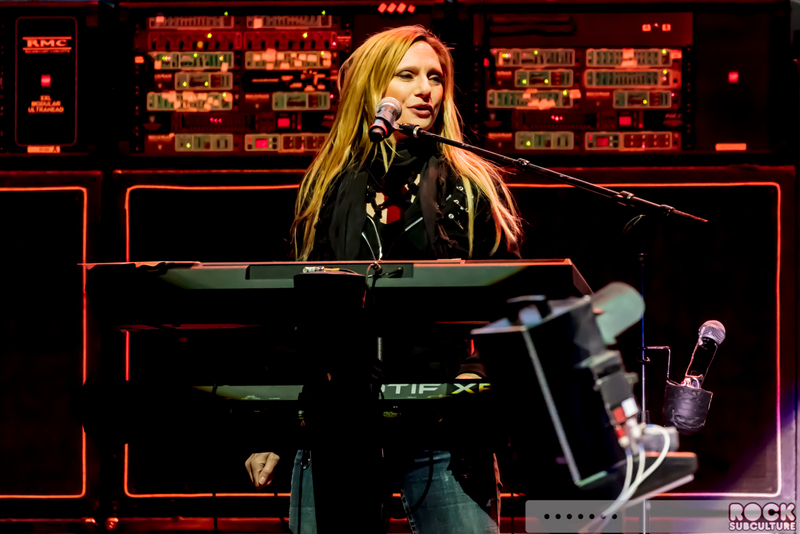 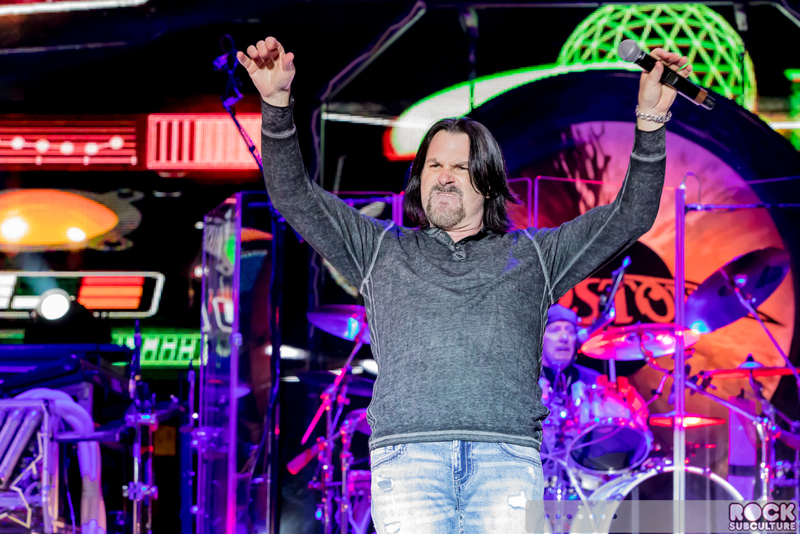 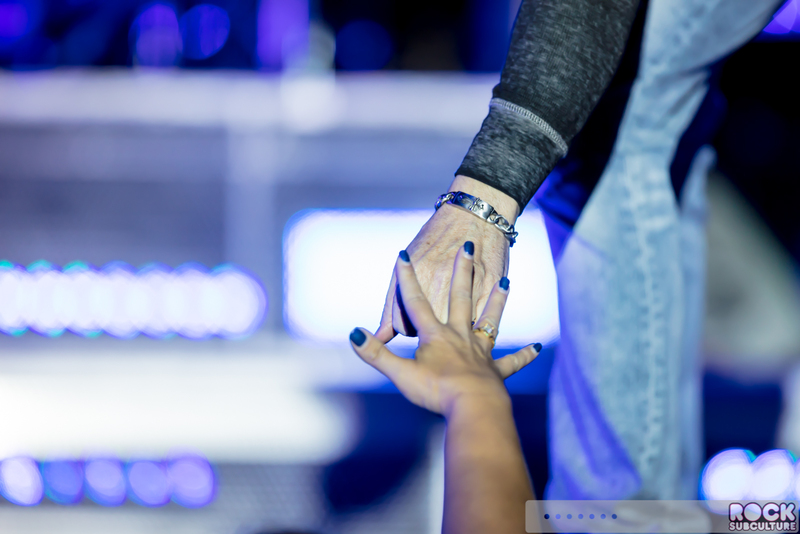 All in all, the true test of success in live shows is the audience, and they all seemed to go crazy for Boston.